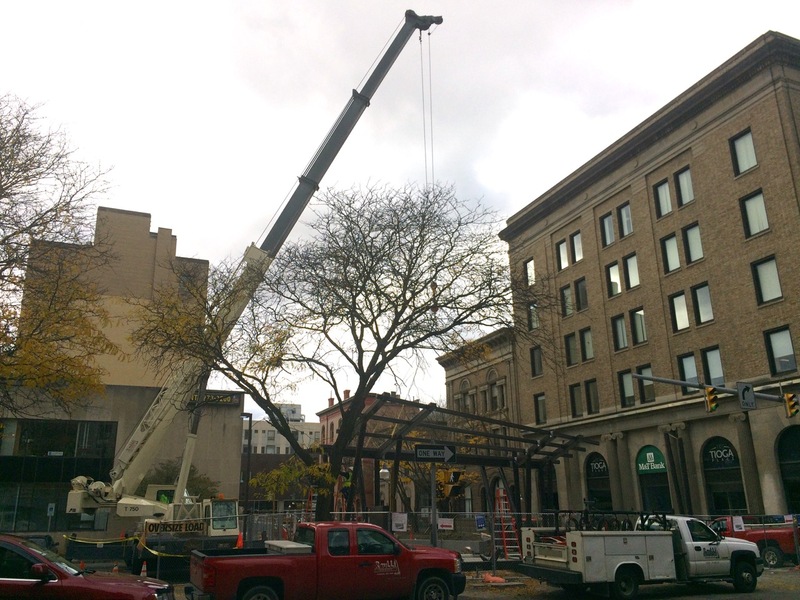 Bank Alley continues to take shape as Raulli & Sons secured the Bernie Milton Pavilion roof assembly on the structure last week. 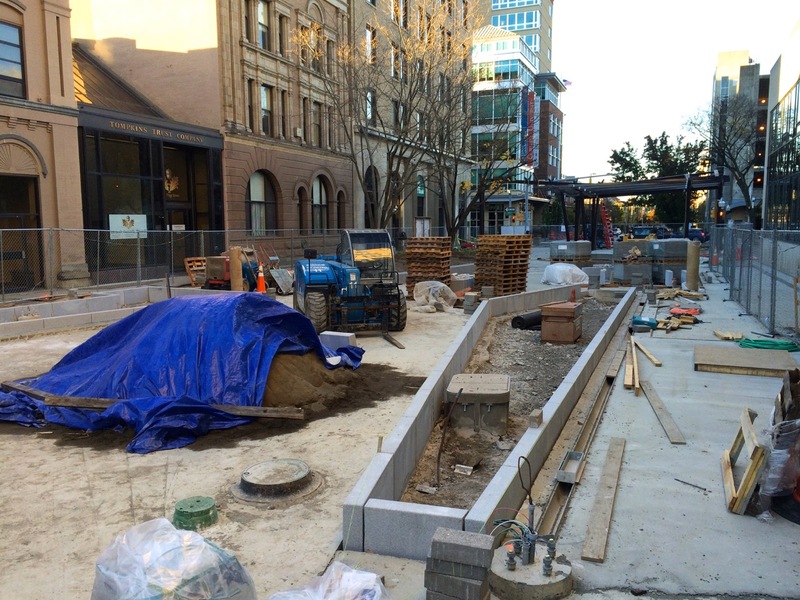 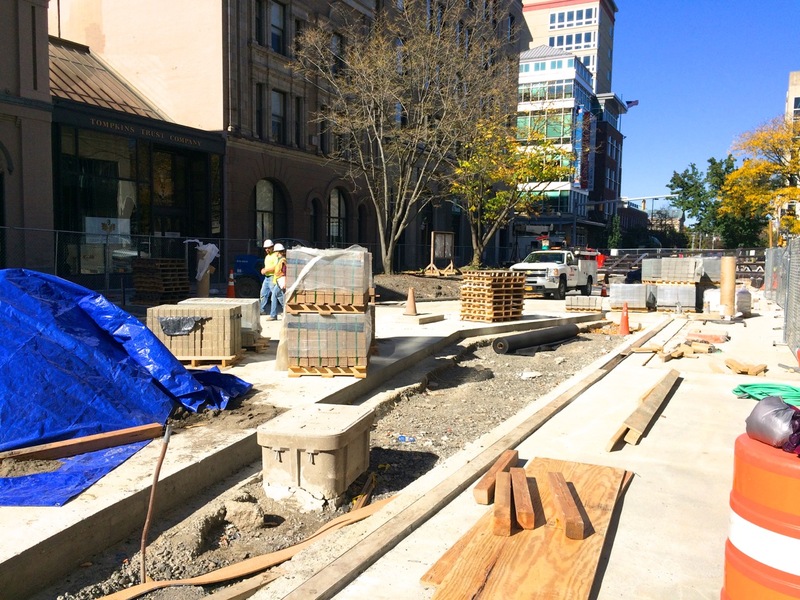 Syrstone continues to spread stone base and install pavers along Bank alley, and future planters and benches are taking form along the eastern extension to Aurora Street. 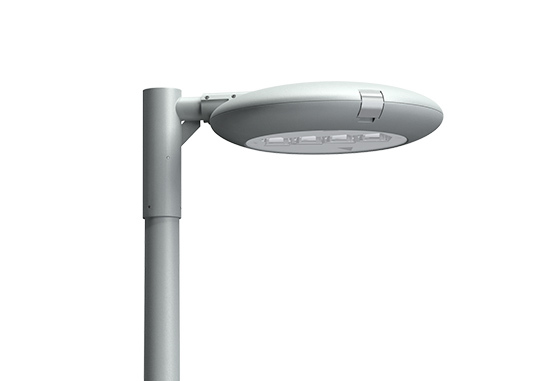 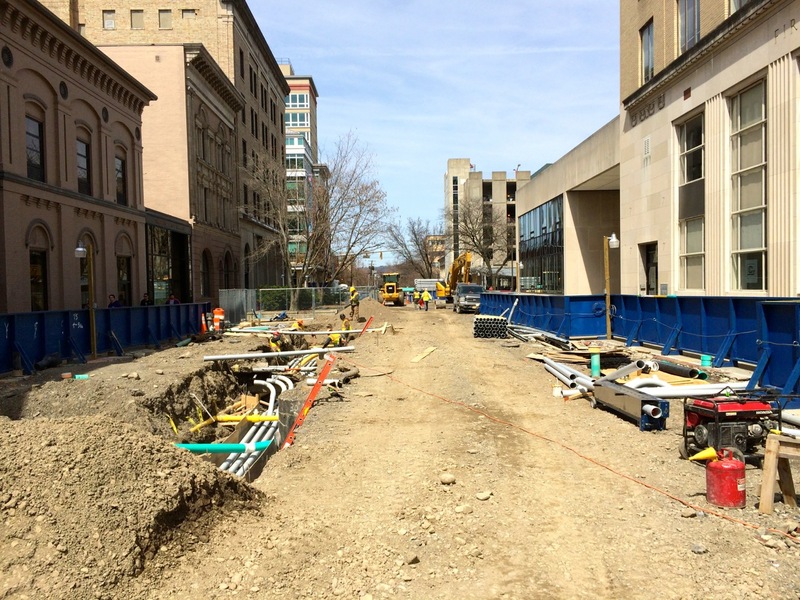 Power & Construction has already completed wiring and round footings for the pole lamps, which will permanently replace the temporary lighting as the surfaces phase progresses. 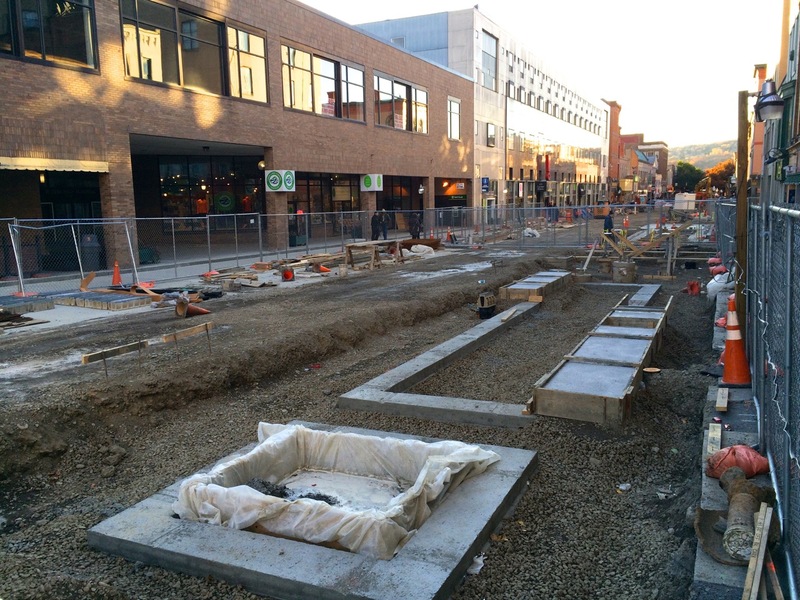 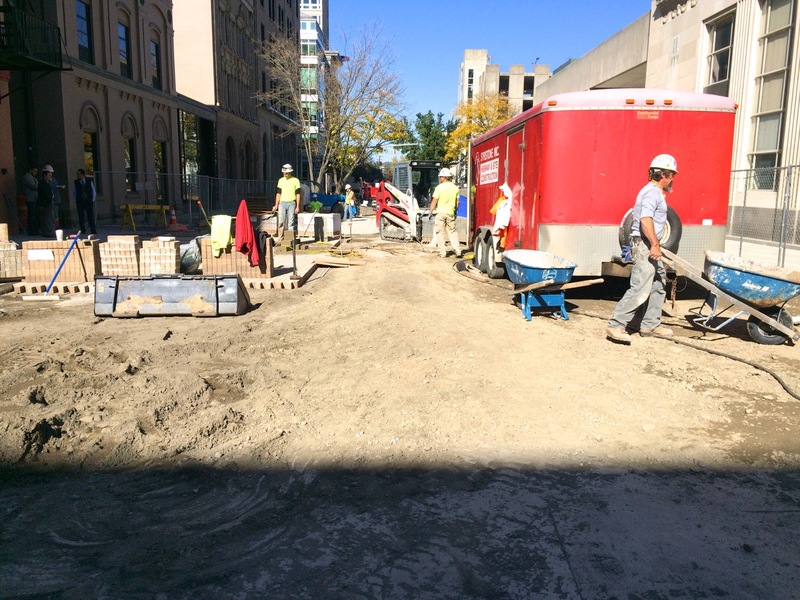 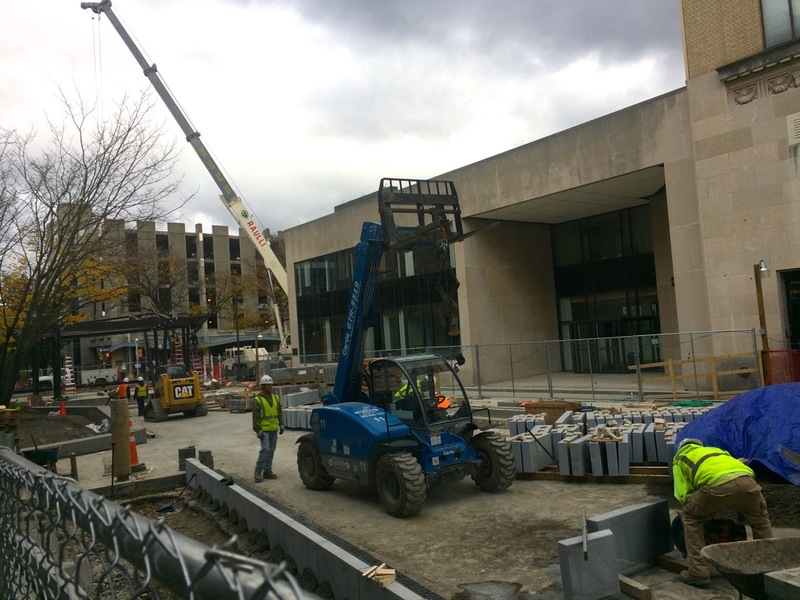 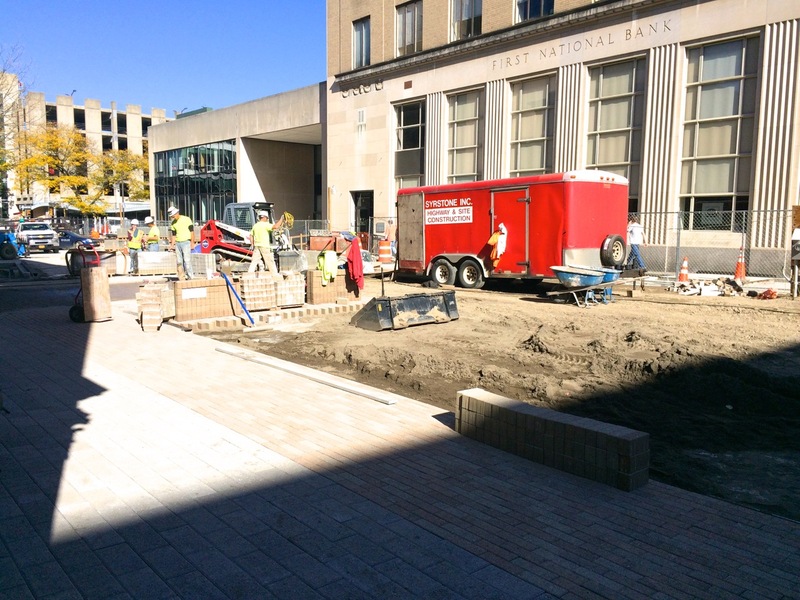 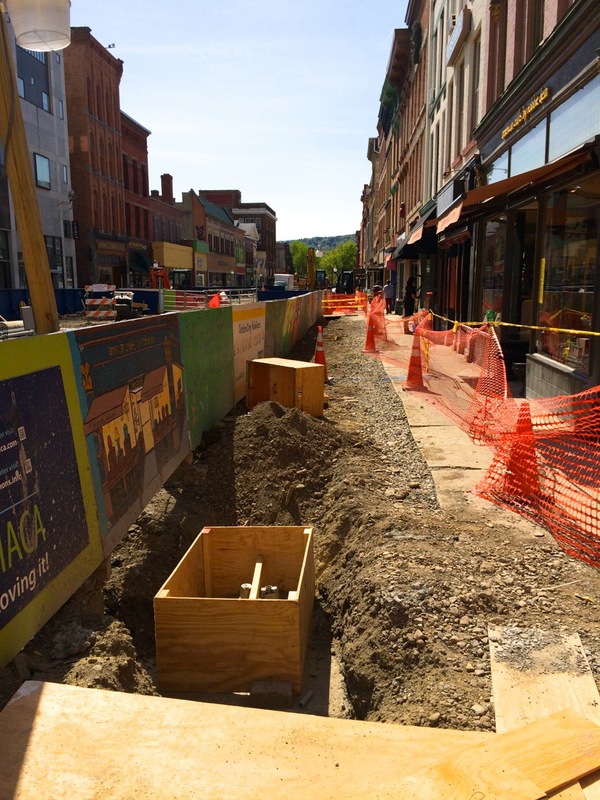 The Ithaca Commons Rebuild Project crews have begun laying pavers over top of stone bases along Bank Alley, and several sections of concrete have been poured along Bank Alley and the east end for the floor and planter boxes, along with tube pours for the pole lighting systems. 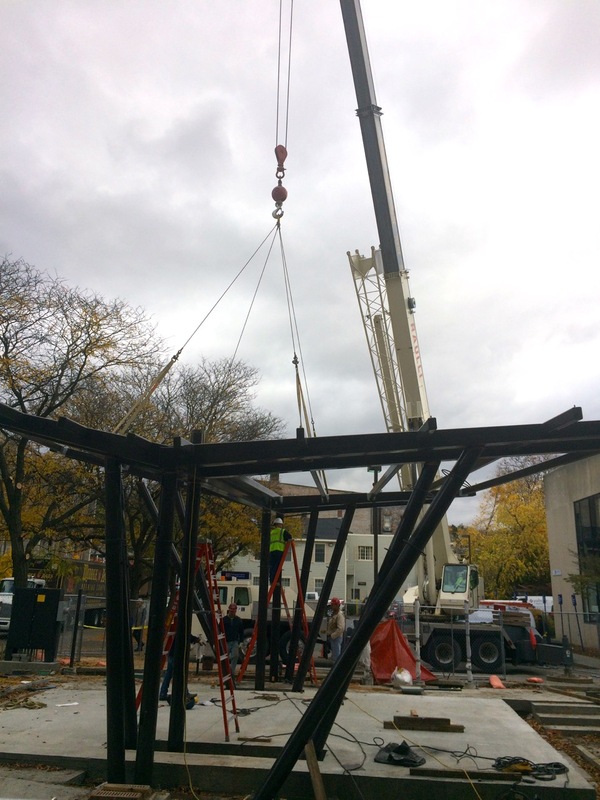 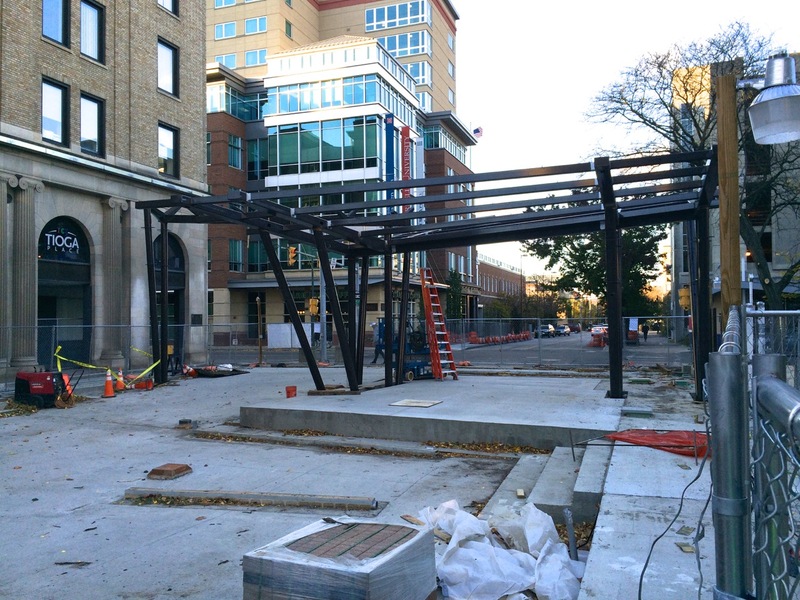 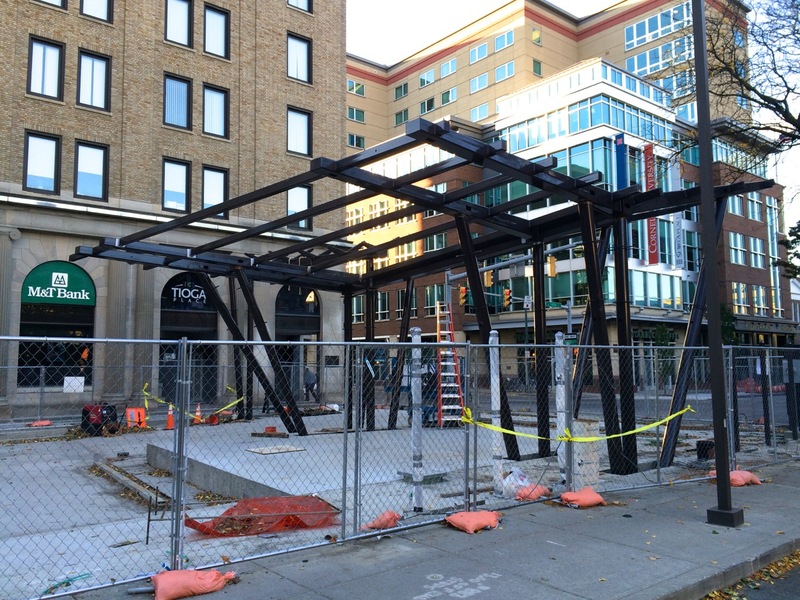 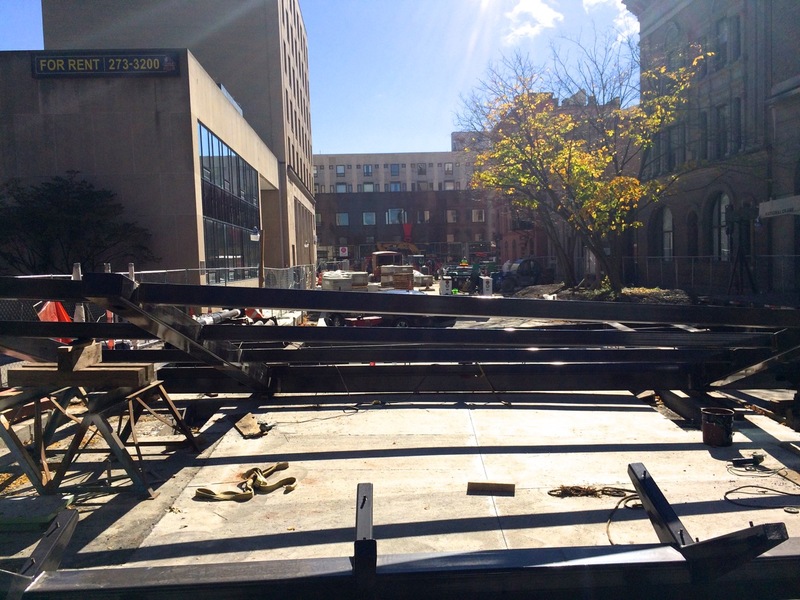 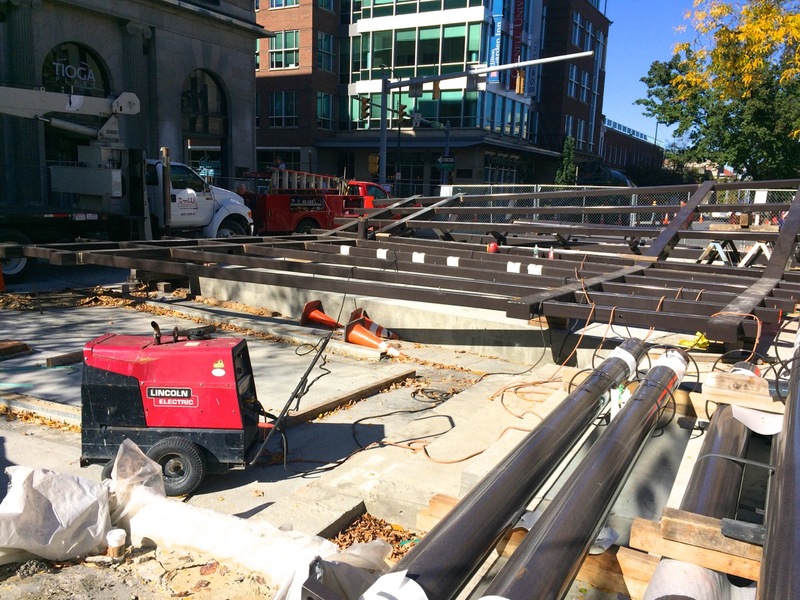 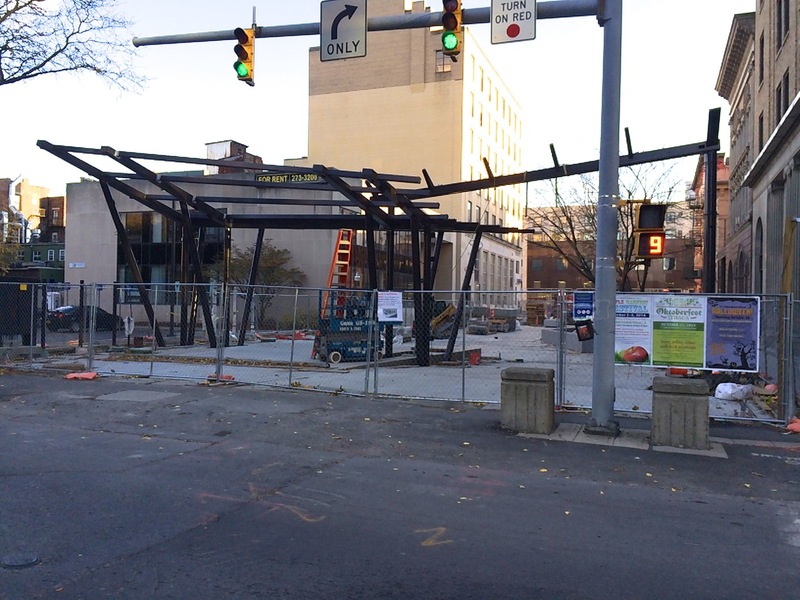 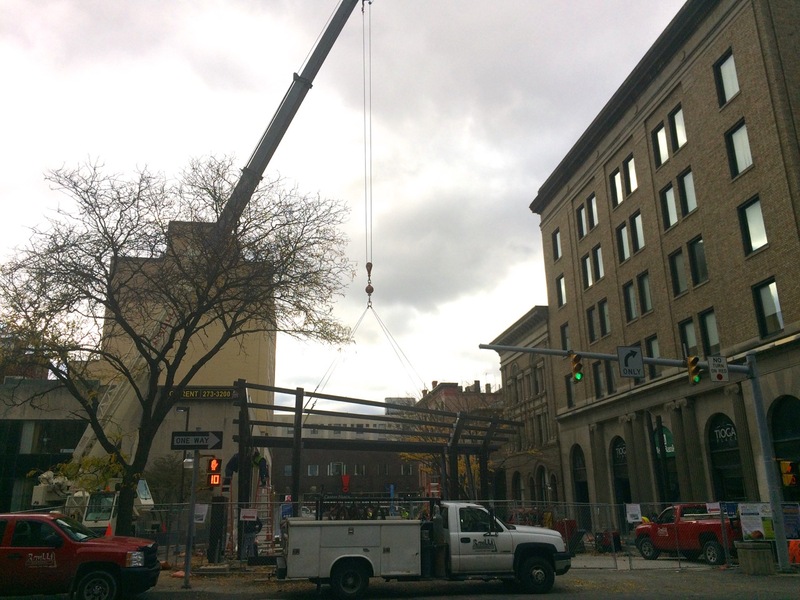 Steel sections of the new Bernie Milton Pavillion arrived in mid-October, and crews have been welding together the frame for the roof at the end of Bank Alley. 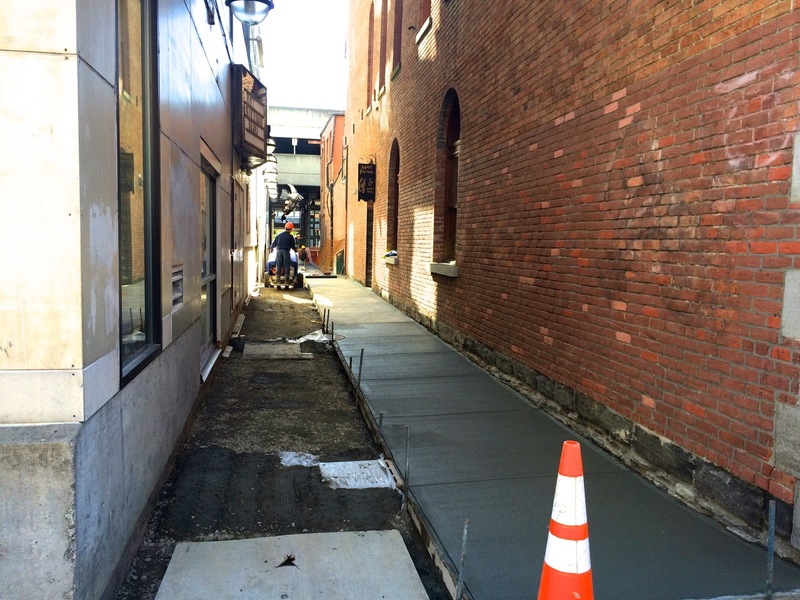 The Home Dairy Alley also received a new concrete walkway. 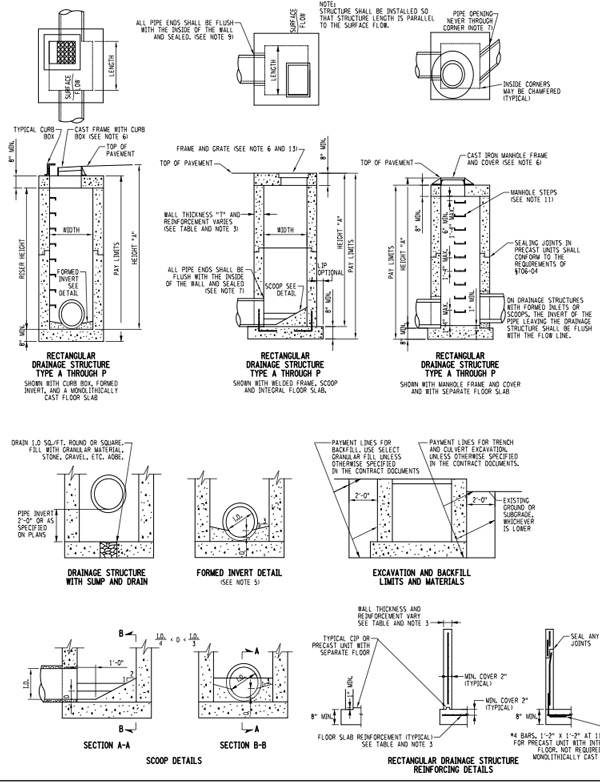 Previous design posts here (part one link) and here (part two link). 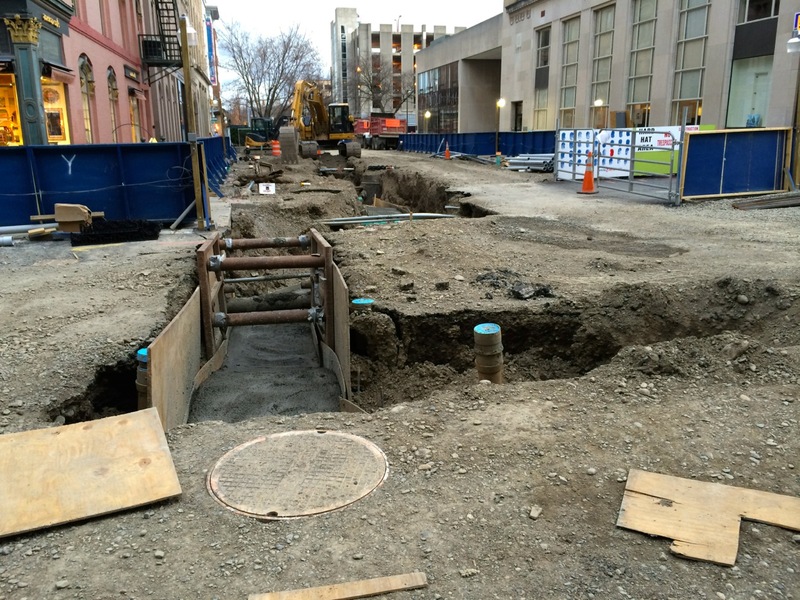 The Commons Rebuild project entered Phase Three this past month, as Vacri Construction is back on site digging-out trenches for the installation of telecom pipe ducts and utility vaults (the large pre-formed concrete blocks with manhole access). 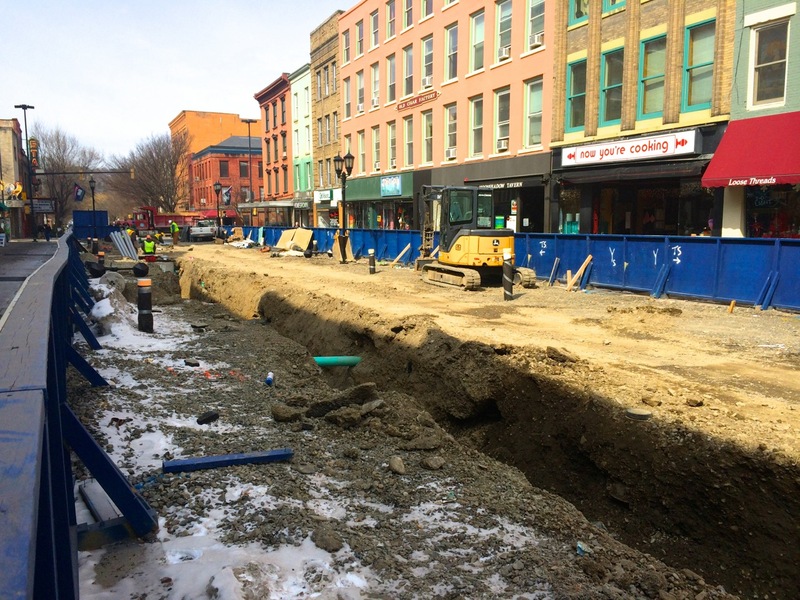 The duct bank run along the western end near Cayuga Street is being worked on right now. 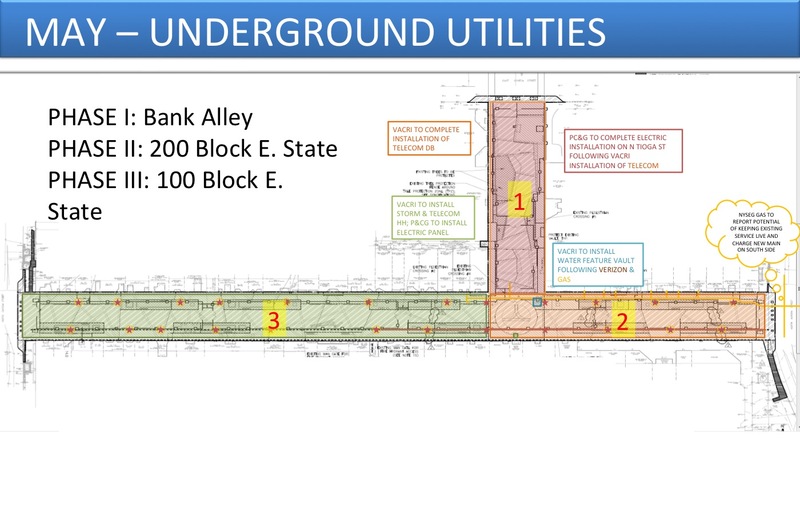 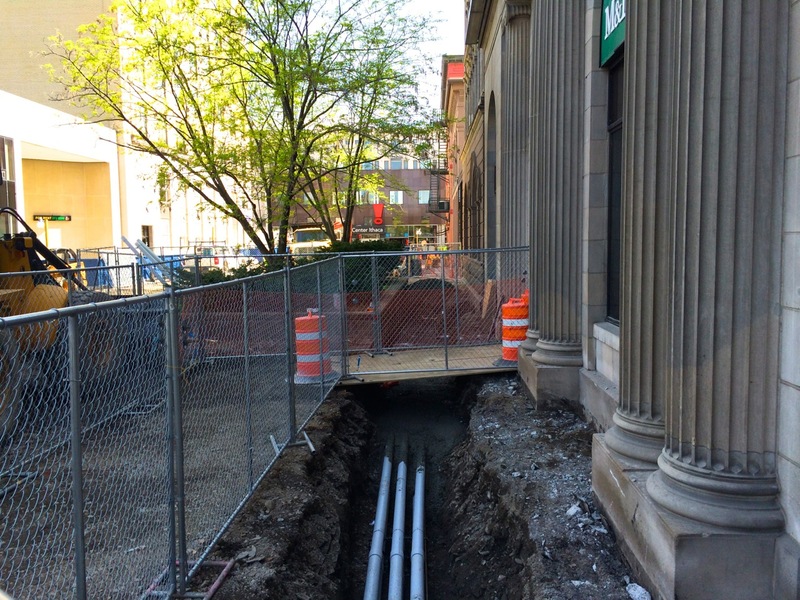 In addition to the duct piping and vaults, NYSEG is installing a new gas main along several of the outside edges of the construction fence to replace the old one. 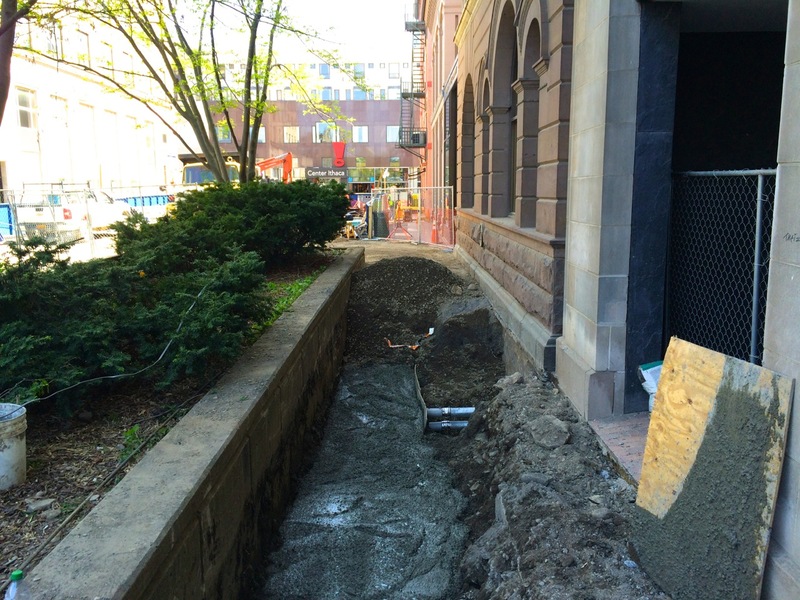 The concrete slab is cut and removed in sections, then several feet of soil is dug out to install the piping. 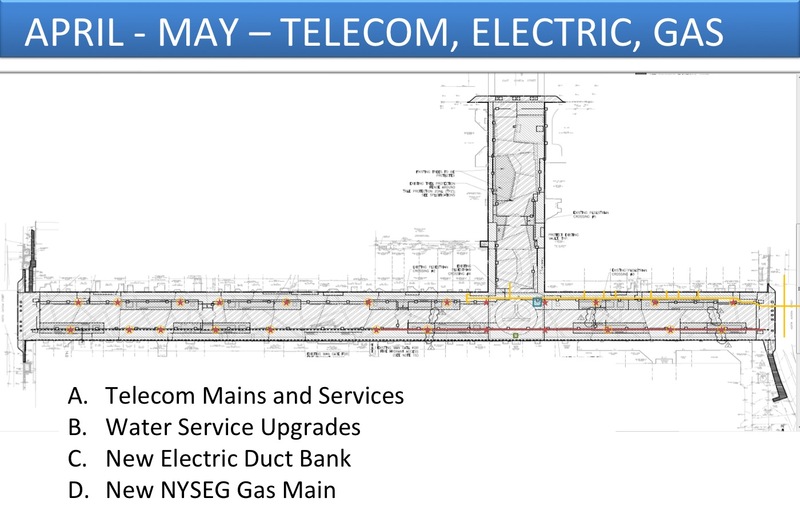 The gas main is not part of Vacri’s contract, but since the gas main is quite old, NYSEG requested to replace it during the same timeframe since the project presents an ideal opportunity to do so. 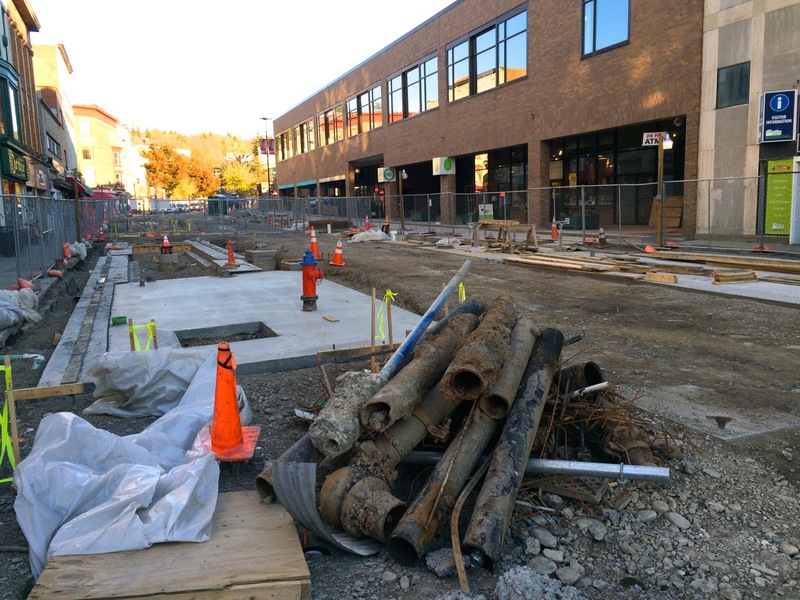 As of now, the concrete is cut, but not yet removed. 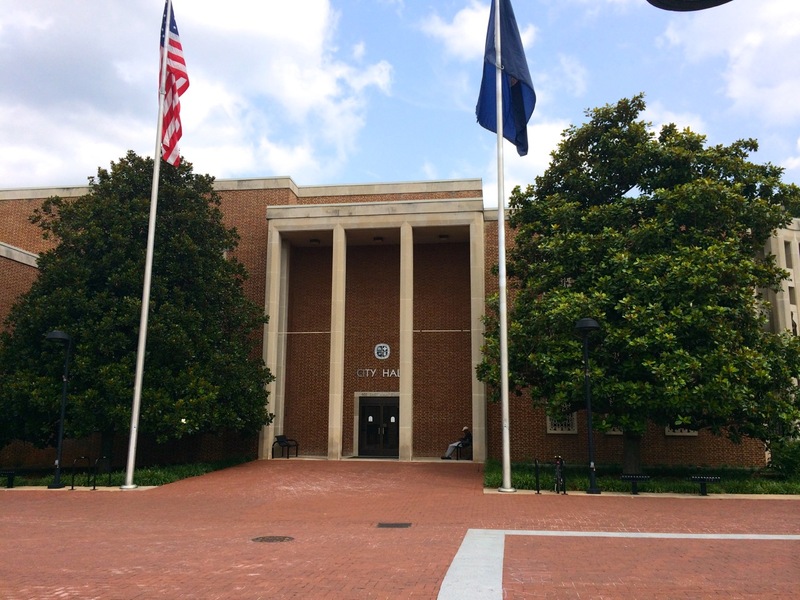 Common Council approved a resolution at their meeting on February 19th to fund the amount, and the Board of Public Works accepted the contract at their meeting on February 24th. 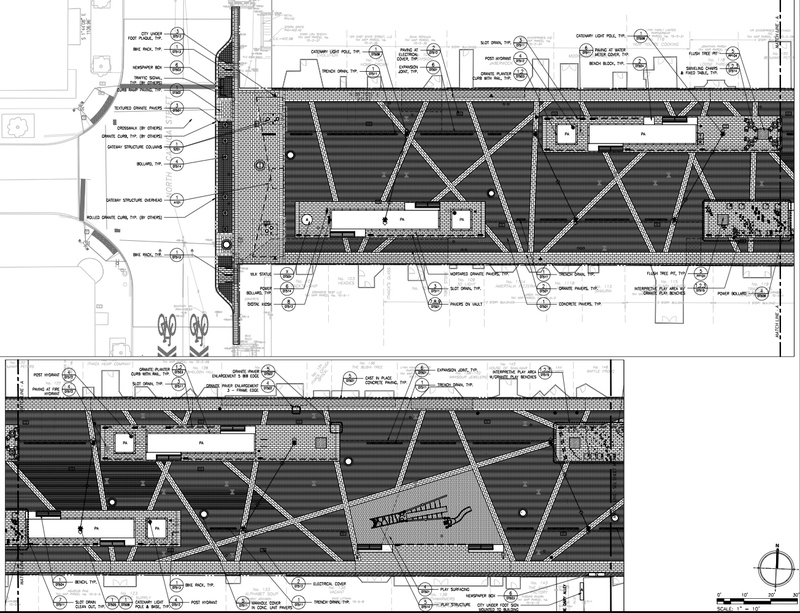 This is a relatively image-heavy post, and there are still so many details I’m leaving out, but I hope these shots taken from Sasaki‘s final presentation and the bid drawings documents give a rough idea of each of these features. 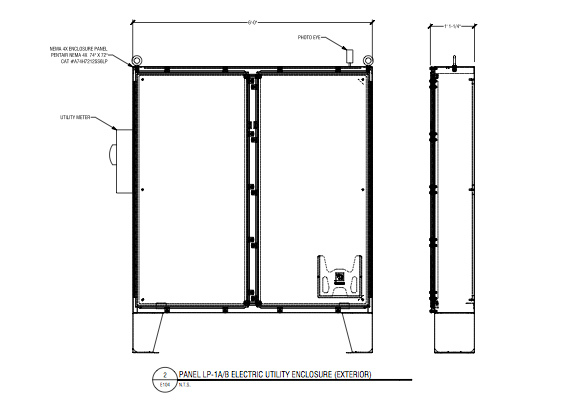 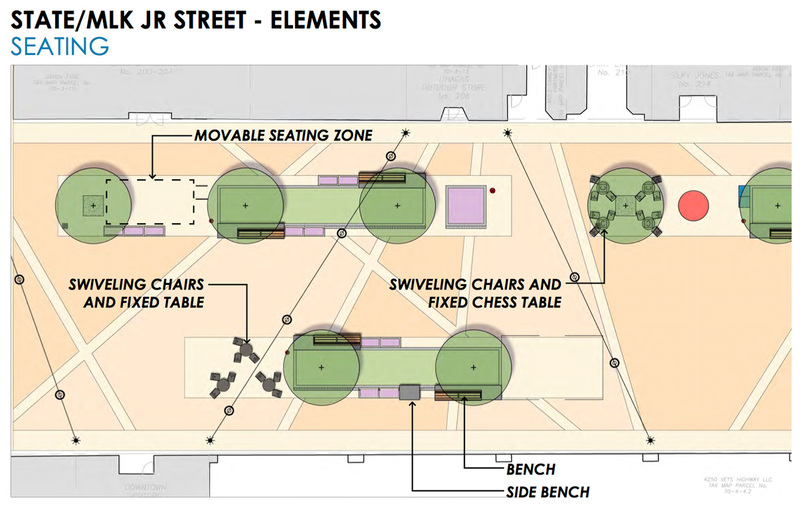 Part of the new design is focused on providing multiple seating options with fixed benches, fixed swivel chairs and tables, and also some movable seating areas. 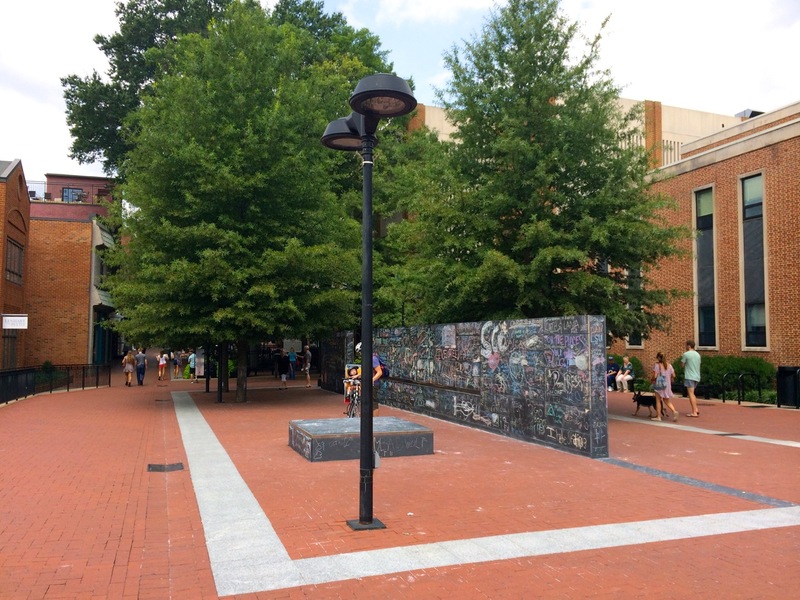 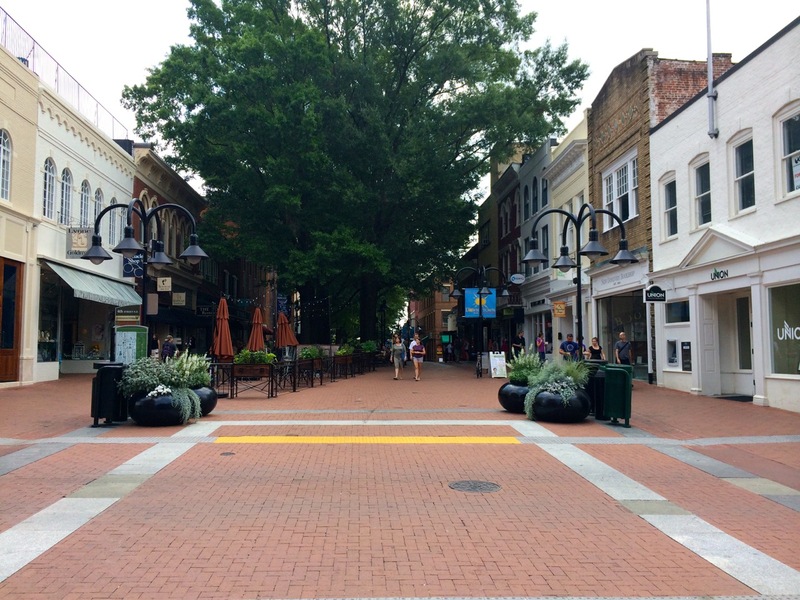 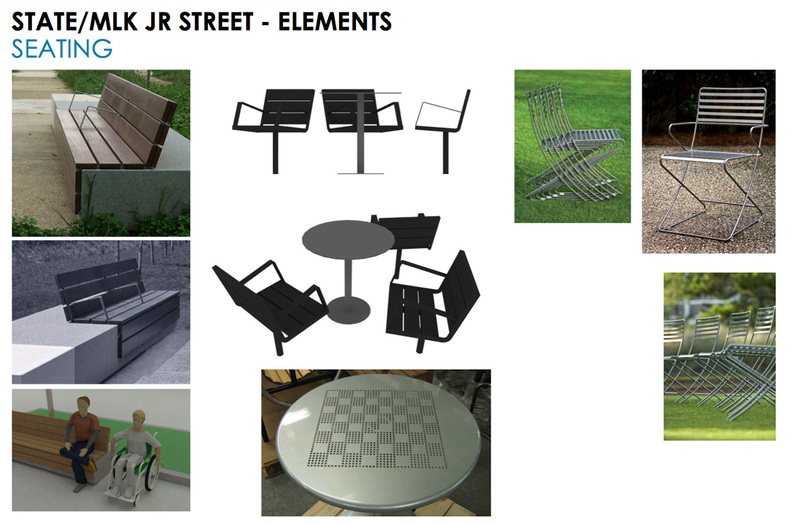 The previous Commons design relied heavily on wide concrete planters for bench seating, but the new design allow for easier re-configurations over time. 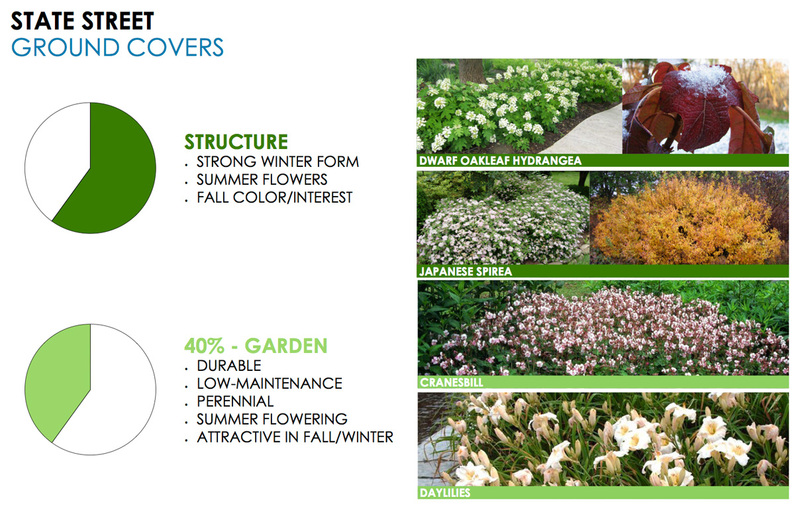 As I’ve stated before, I’m quite far from a working knowledge of plants, but I think these look to be tasteful options, and the angular ground cover designs are certainly interesting. 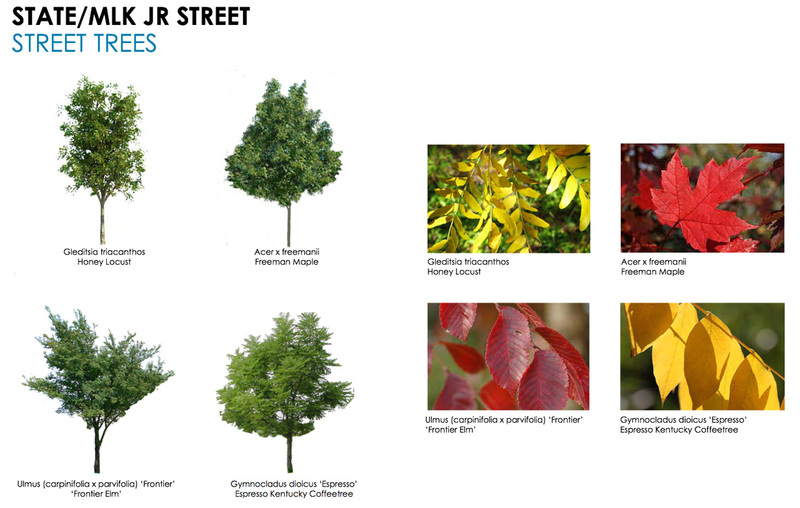 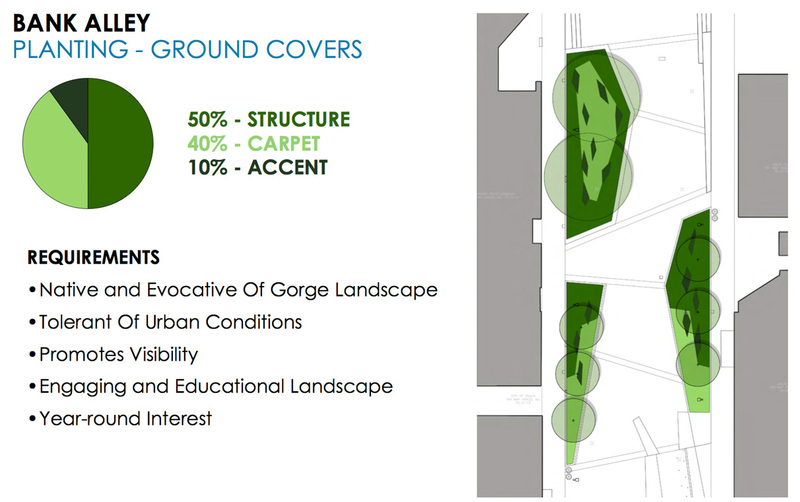 I hope that the trees are trimmed so that they don’t grow to expansive- the view of the facades on the Commons has really grown on me, and all of the tree options max out at heights of 25 feet, and all the way up to 100 feet for the Honey Locust (although there’s probably not enough soil to provide the nutrients to grow that big). 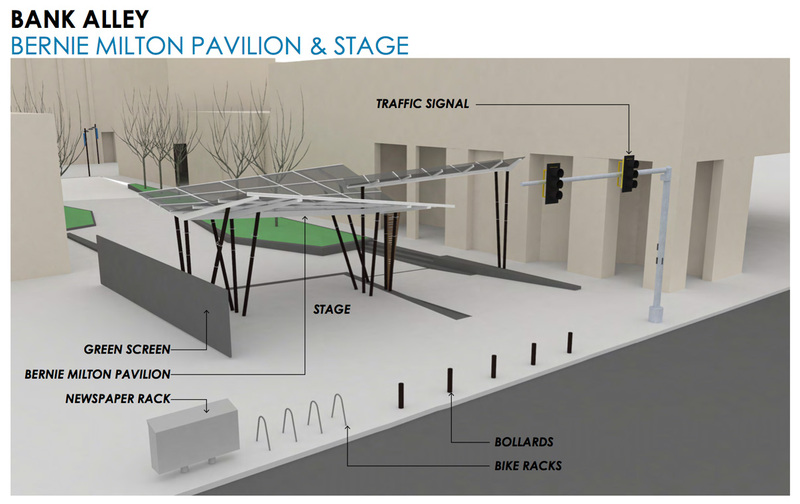 Named after the much-loved and sorely missed Bernie Milton (1942-2002) the Soul musician, and former DJ at WICB Radio, the proposed pavilion is an interesting steel and glass structure, designed to be situated at the end of Bank Alley. 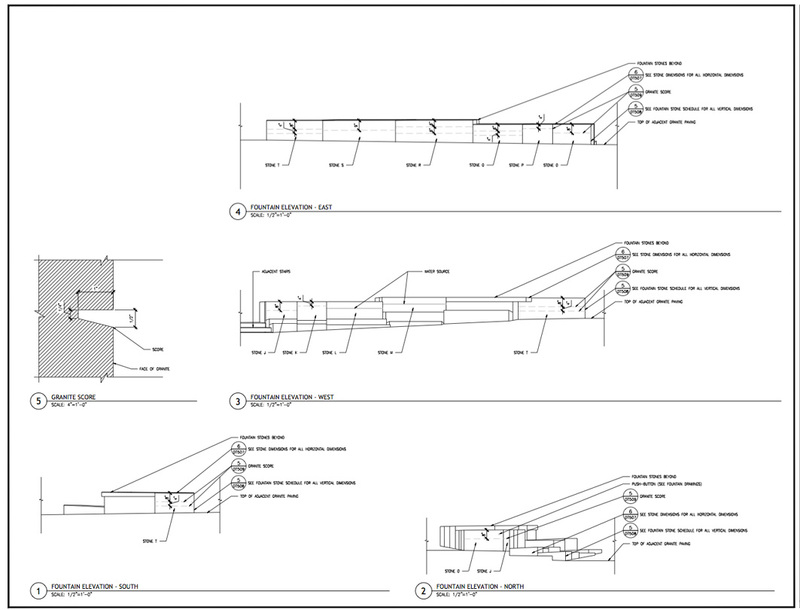 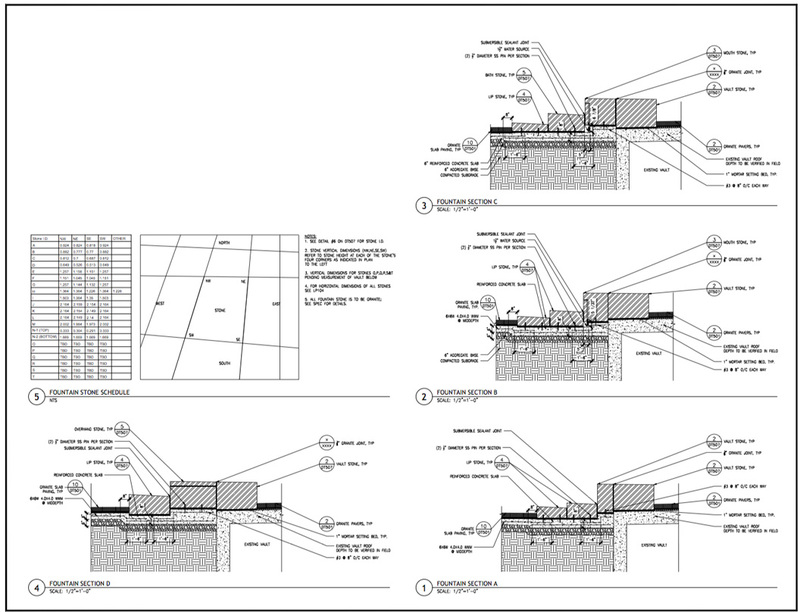 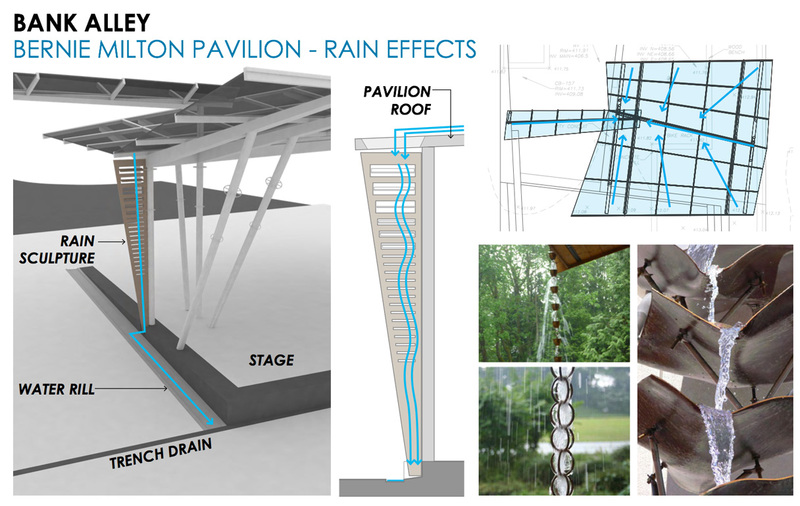 The roof will funnel water onto a shaded drip piece to provide effect, then down into a trench drain. 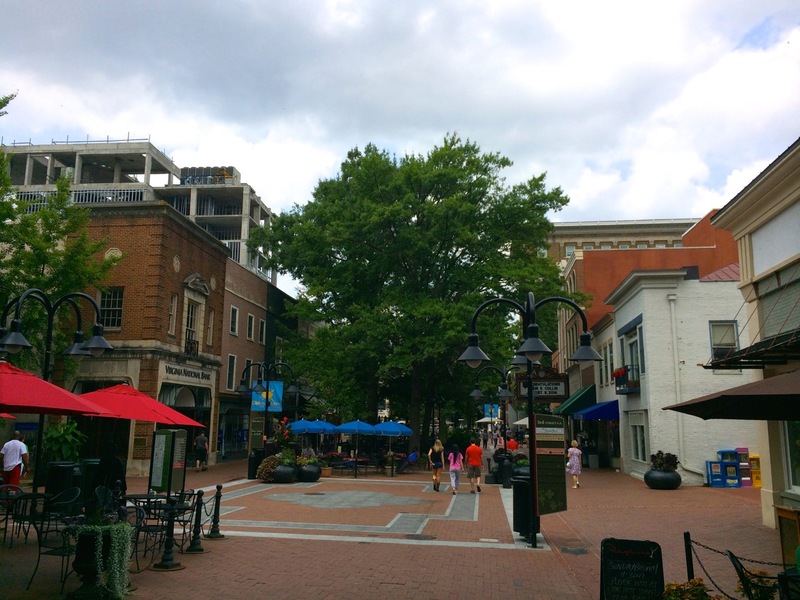 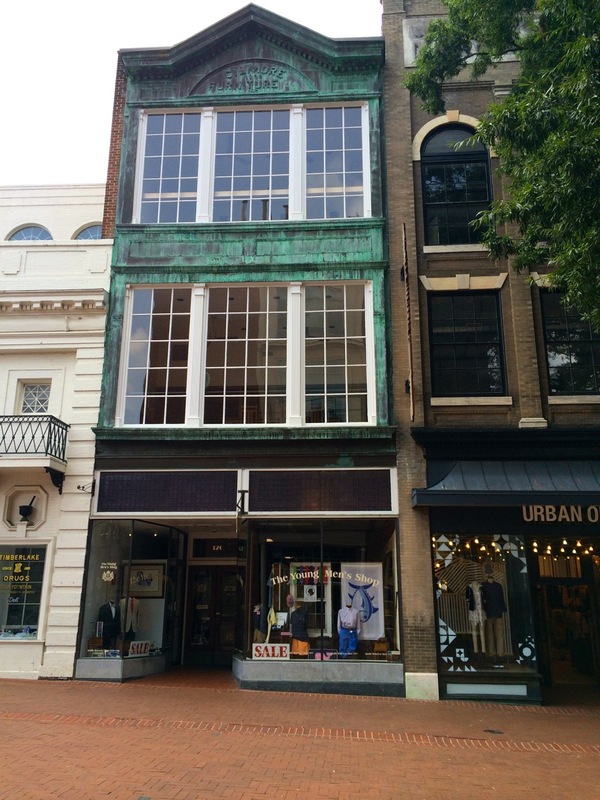 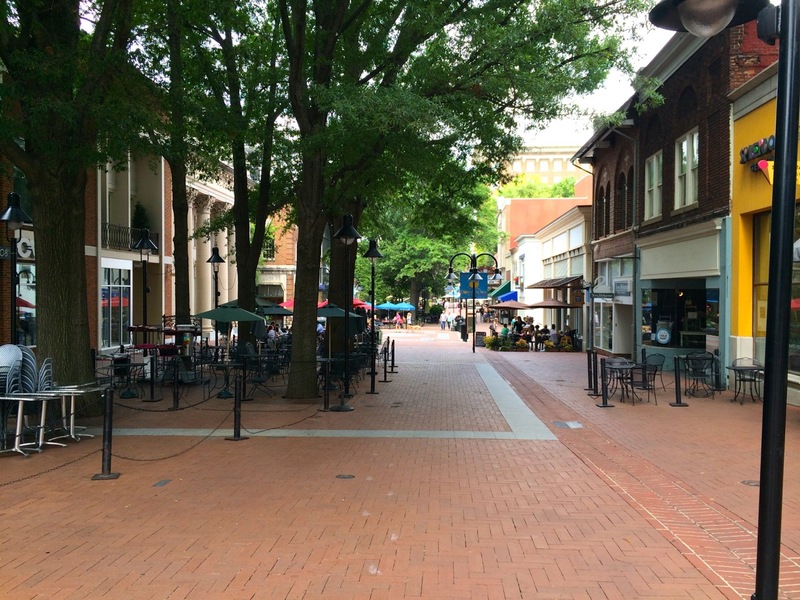 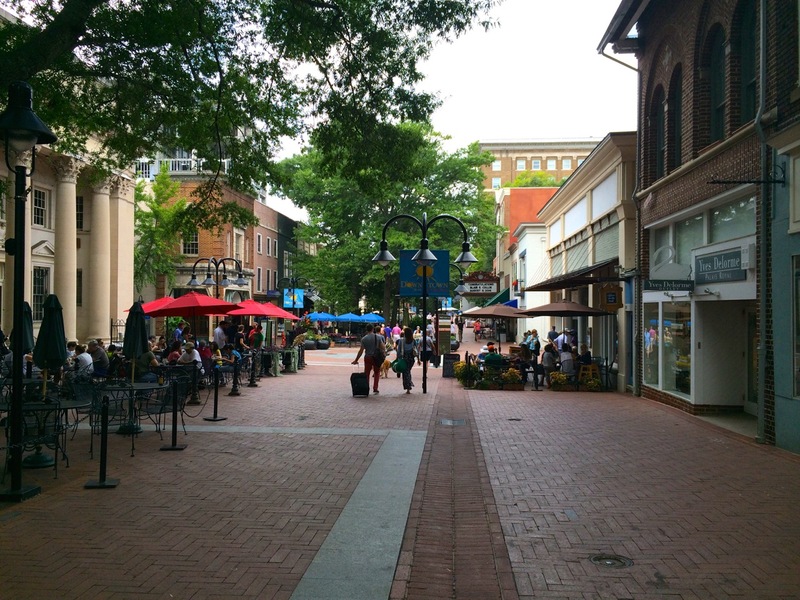 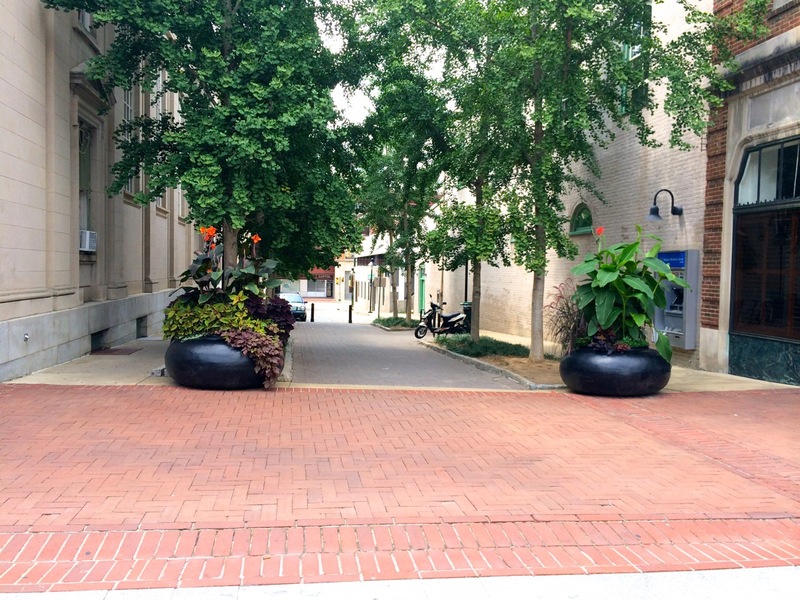 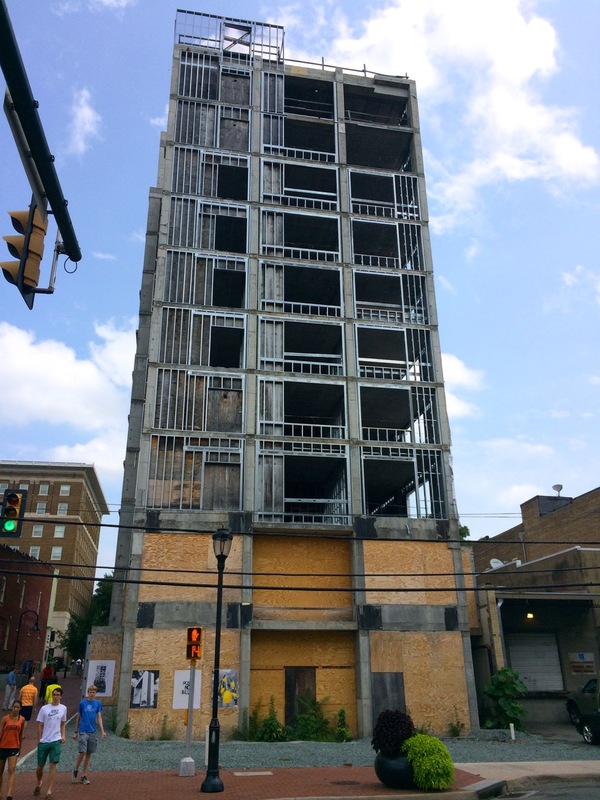 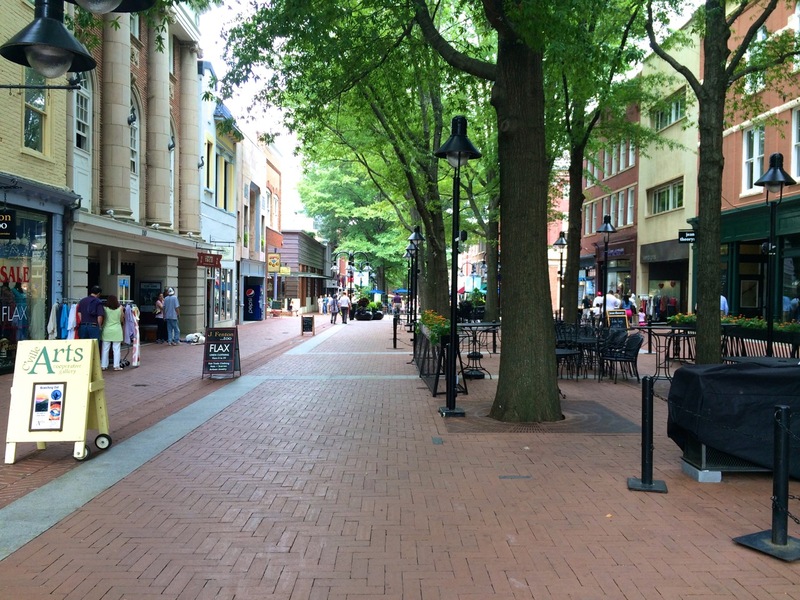 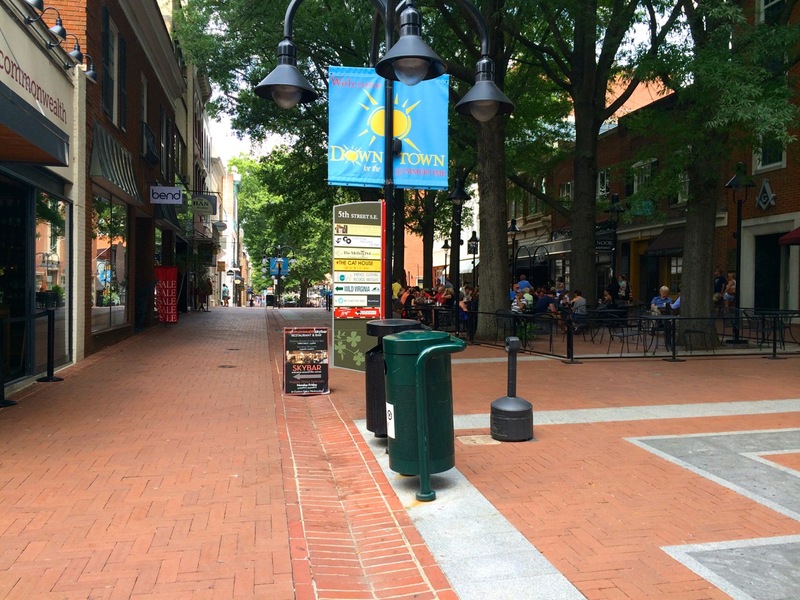 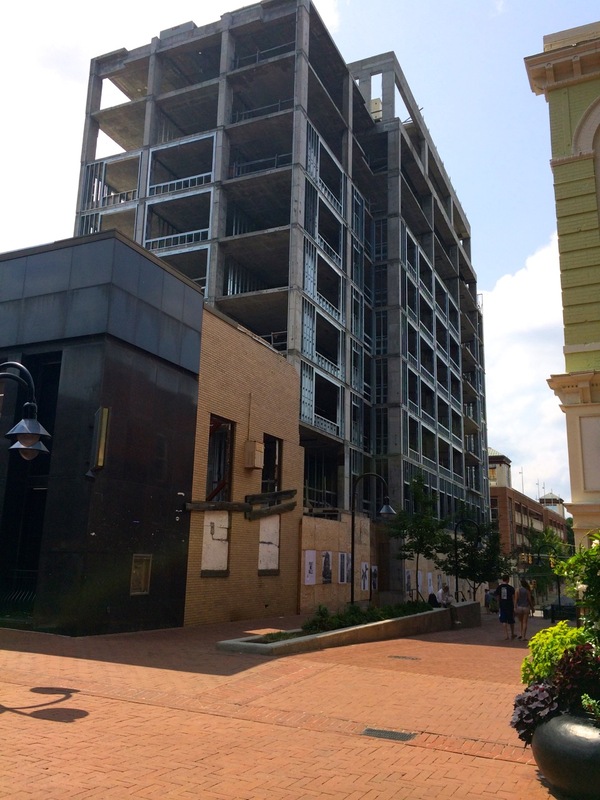 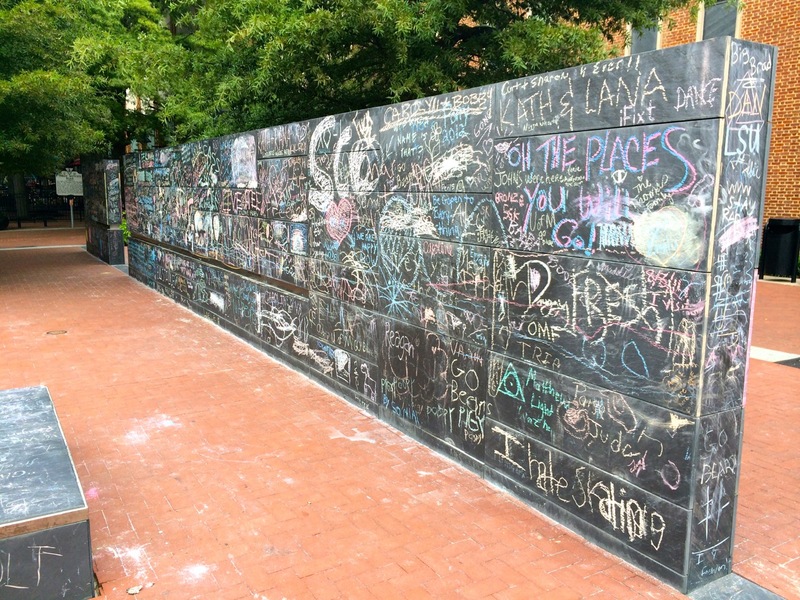 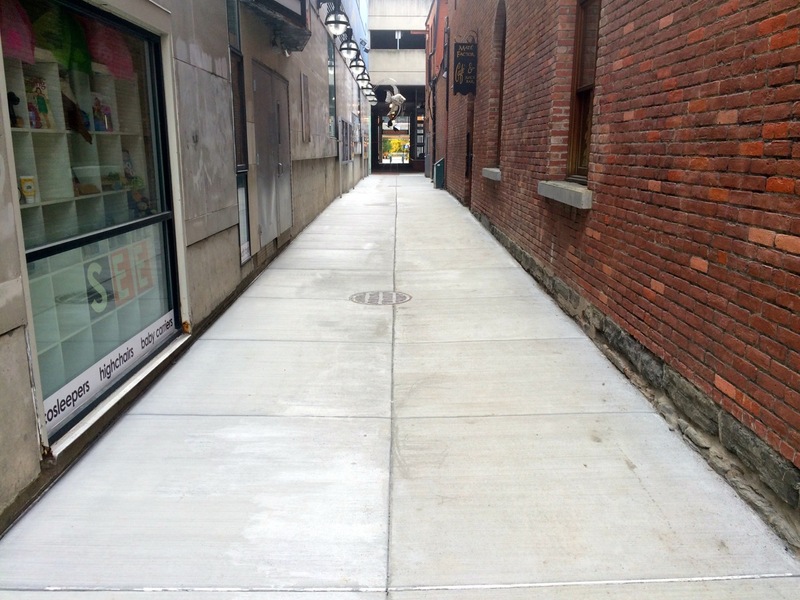 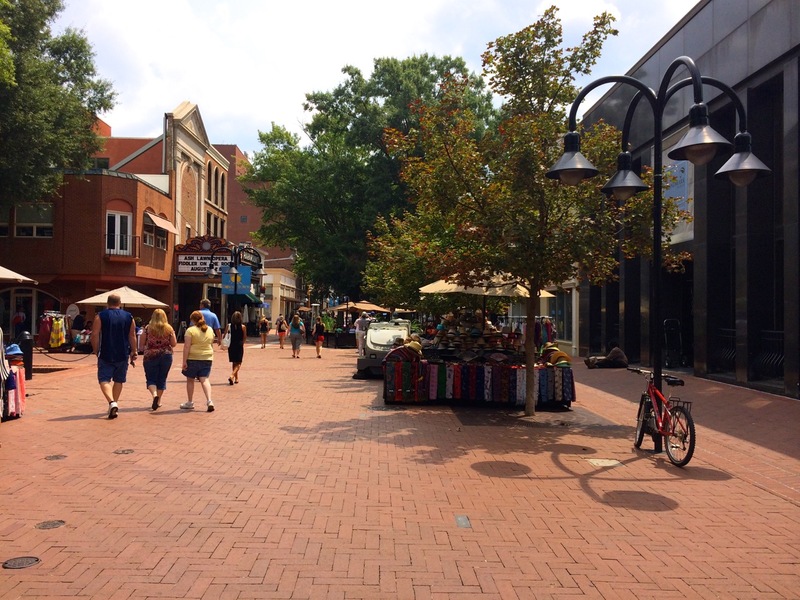 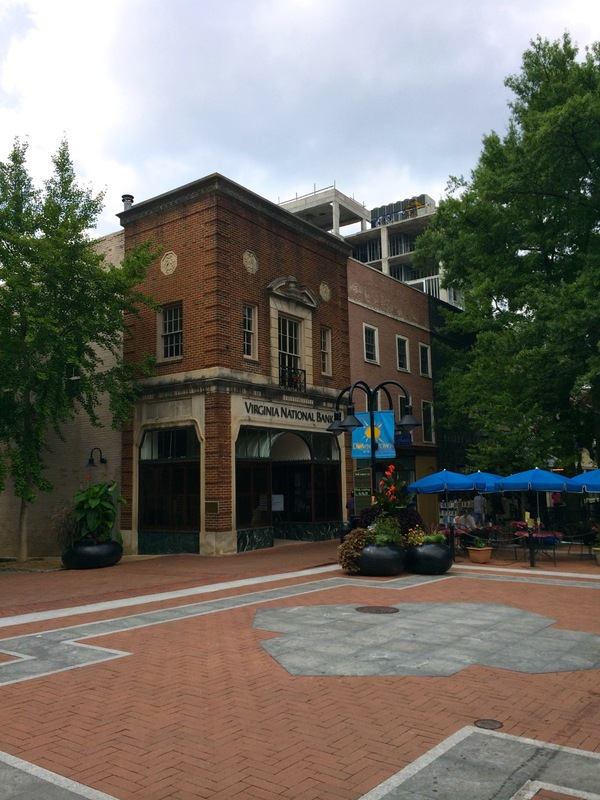 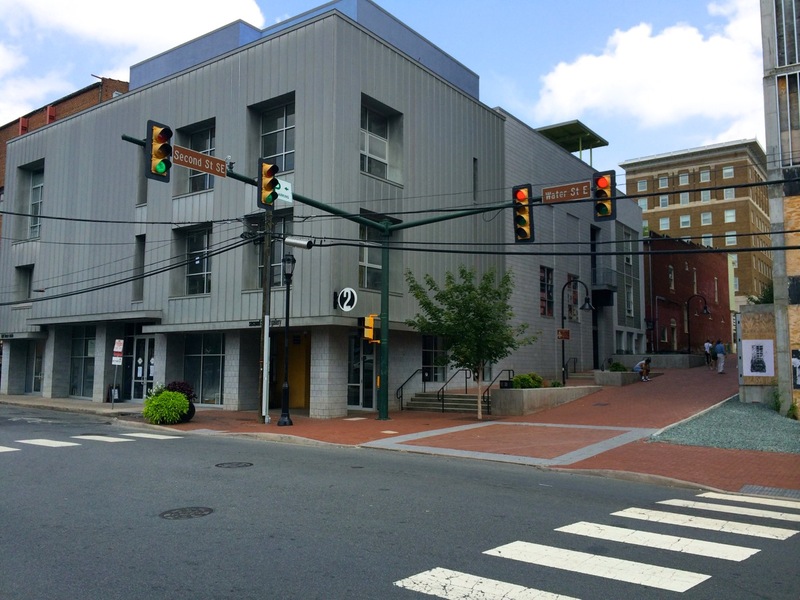 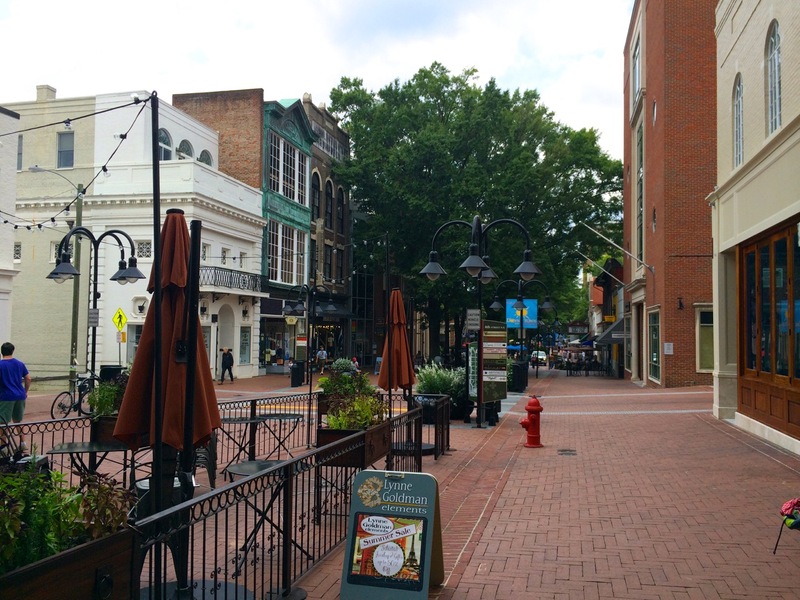 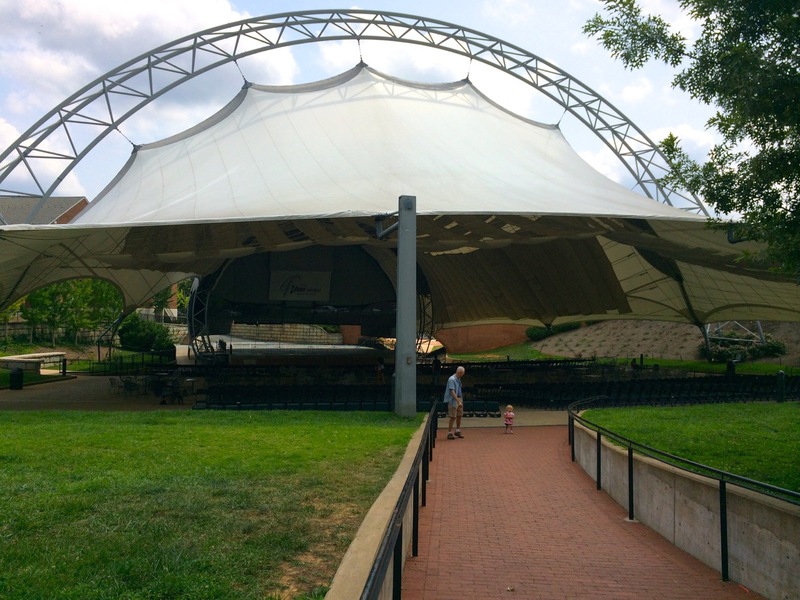 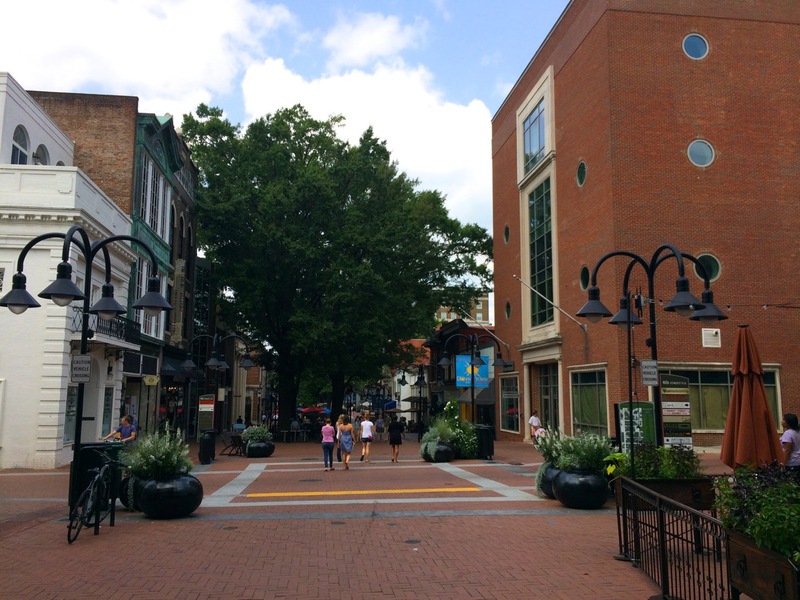 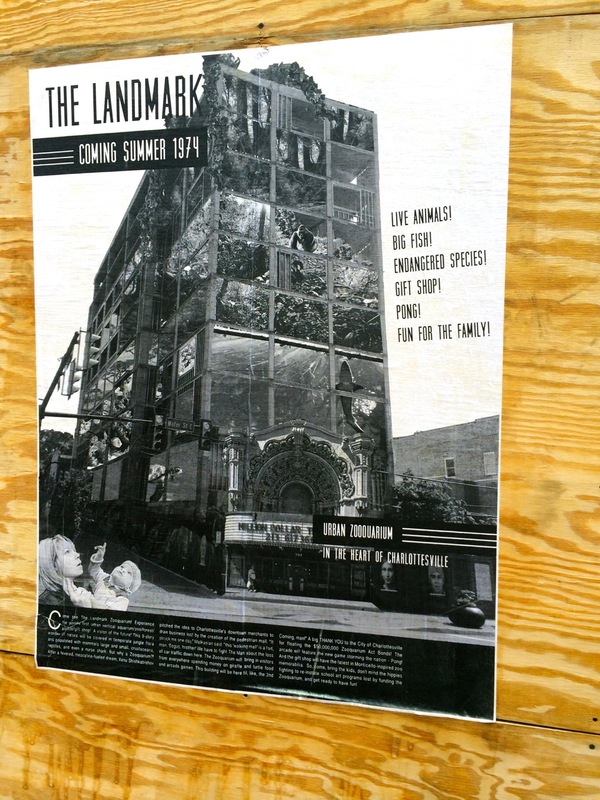 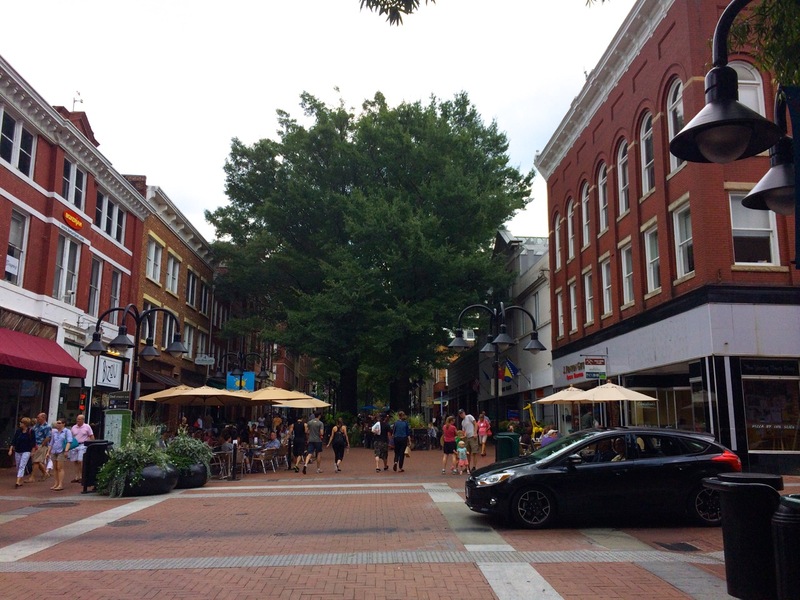 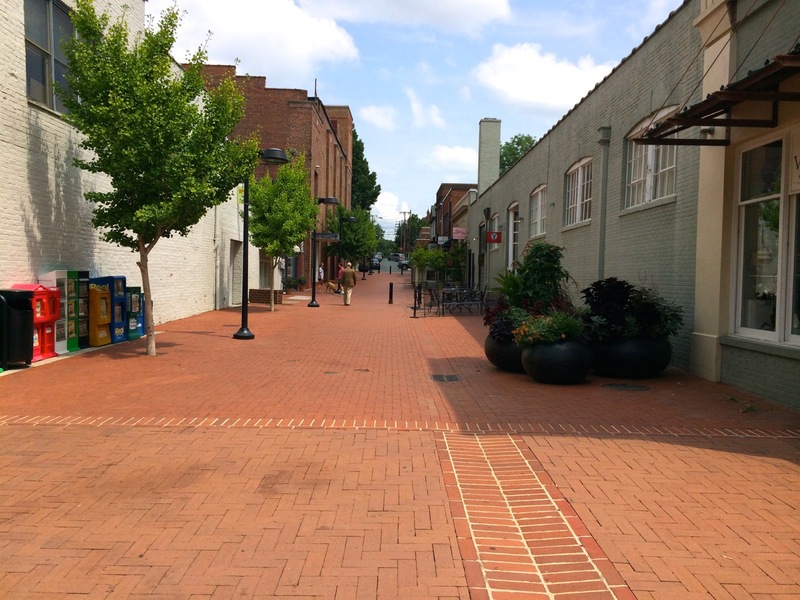 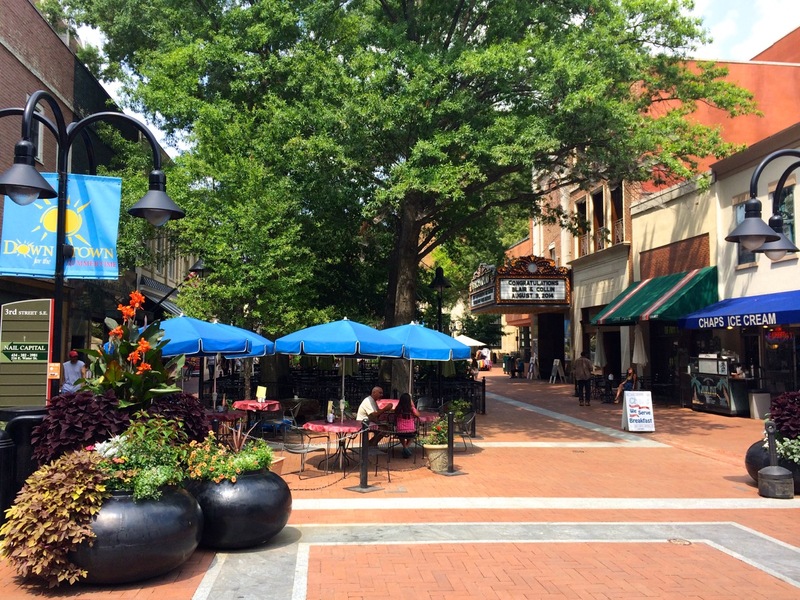 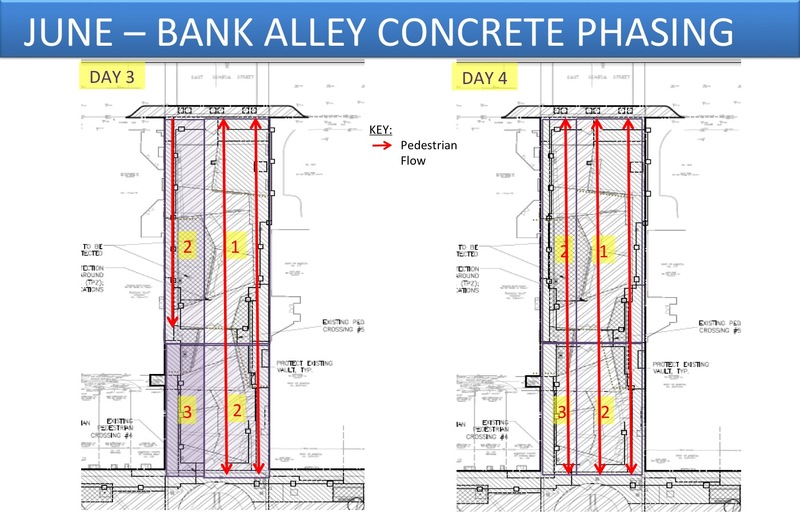 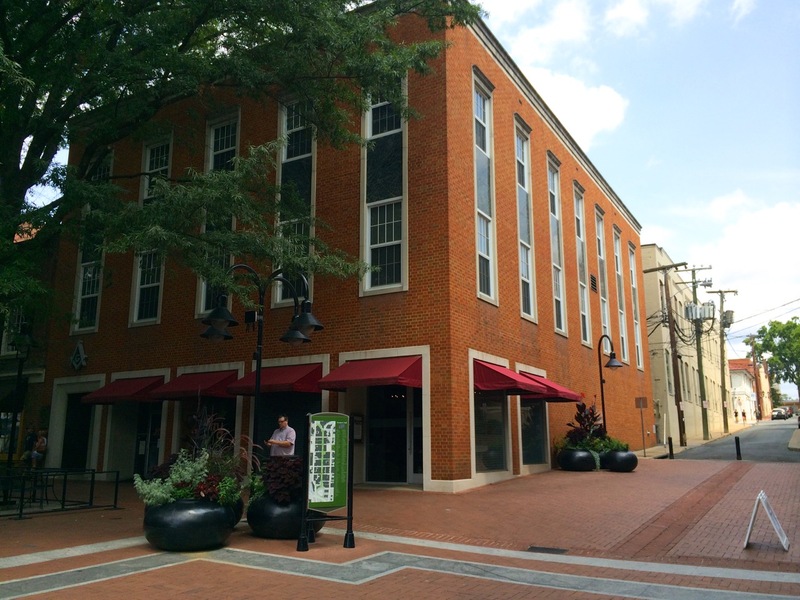 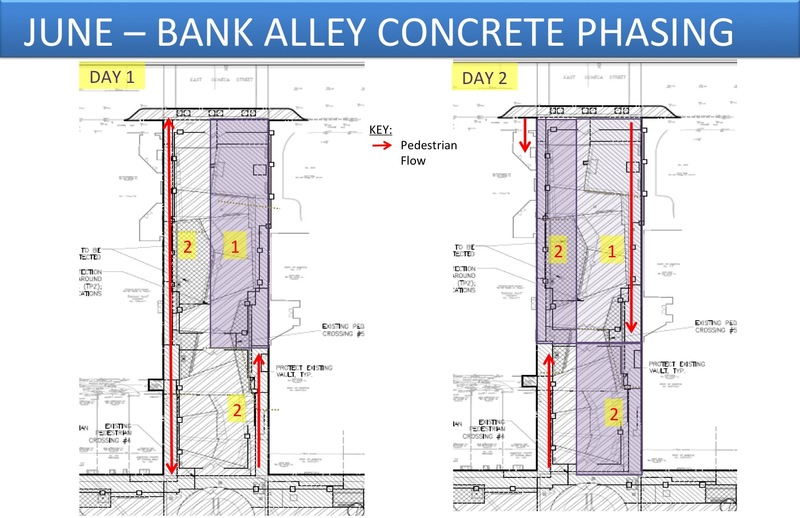 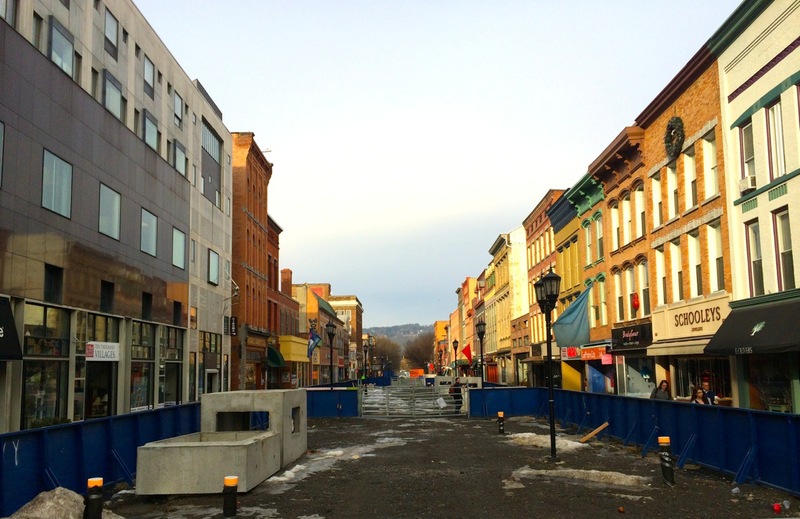 The positioning at Bank Alley is designed to draw interest from Seneca Street, and provide more space for concert venues, since viewers will now have a much longer line of sight. 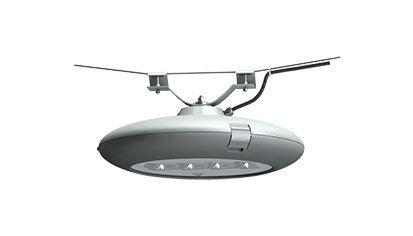 Out of all the features, I have to admit, these are probably my favorite. 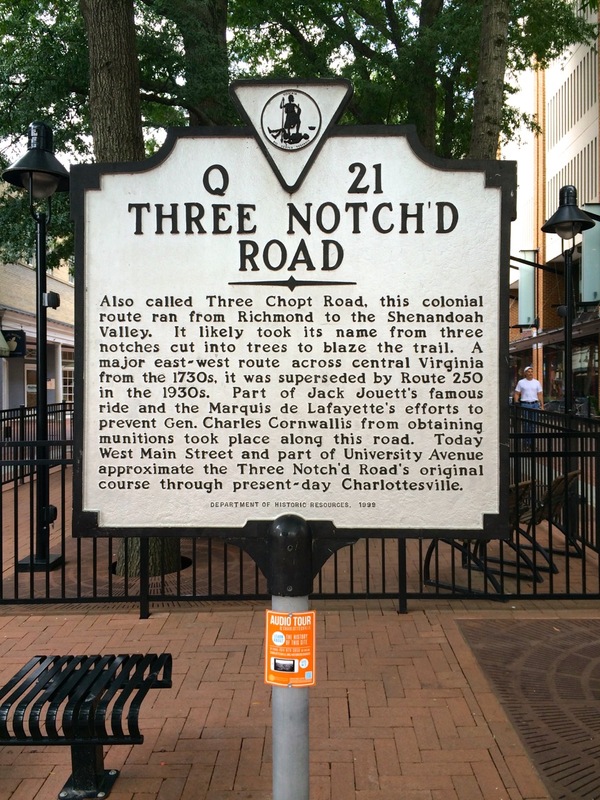 The former signs were rather small in comparison, but these large gateway structures are perfect for giving visitors a strong first impression. 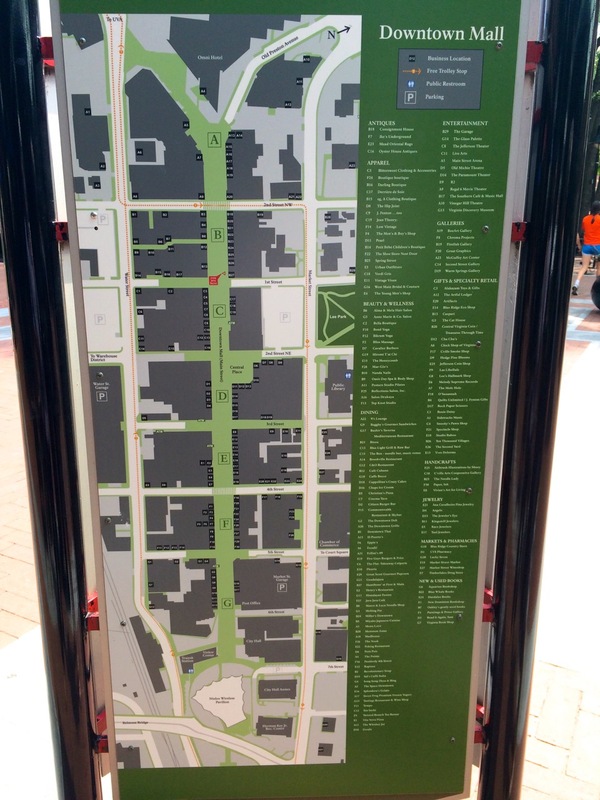 For people that have never been here, it’s not so easy to identify where the Commons is located. 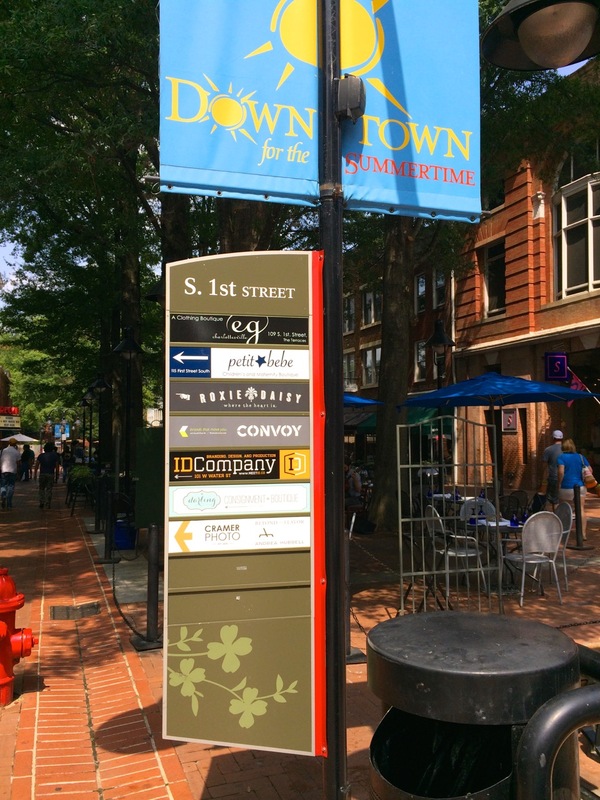 Large, tasteful signage goes a long way. 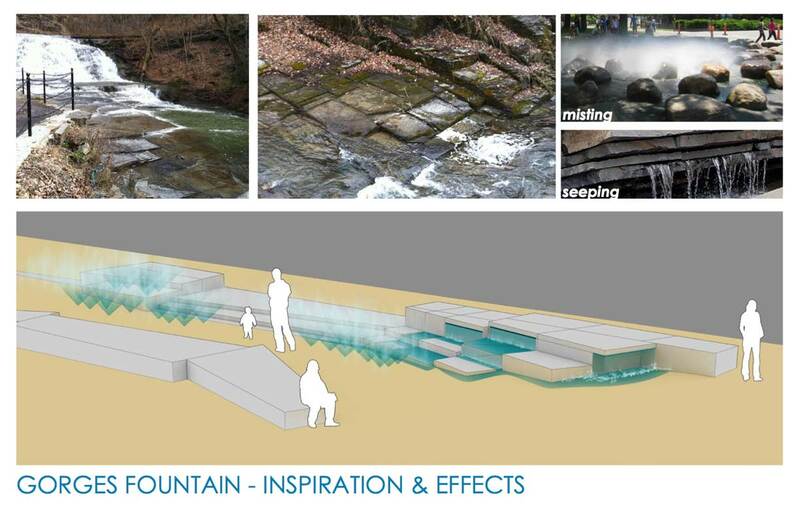 The water feature is a series of stepped-up stone blocks with water misting jets and puddle drains embedded in the crevices, and one under a stone cantilever, inspired by the effect of water streaming over rock layers in the Ithaca’s gorges. 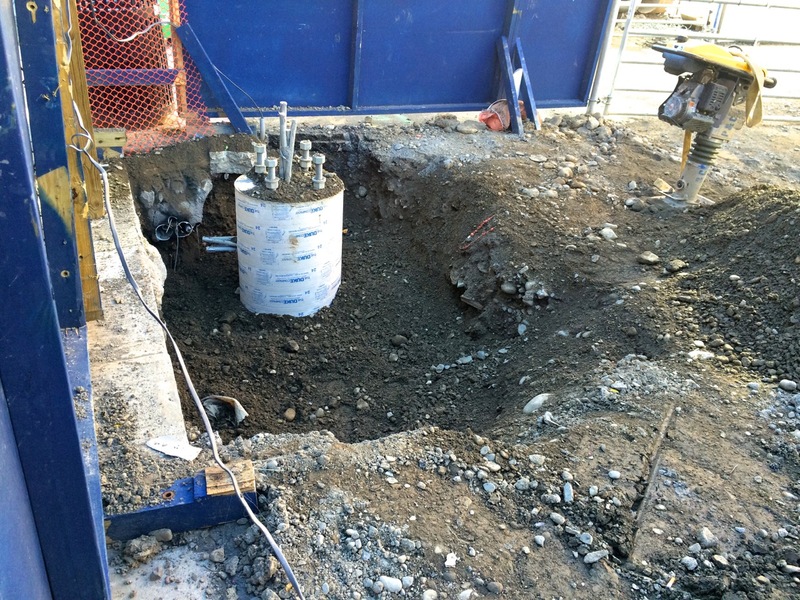 The water lines will run south to a main water vault with pumps and drains. 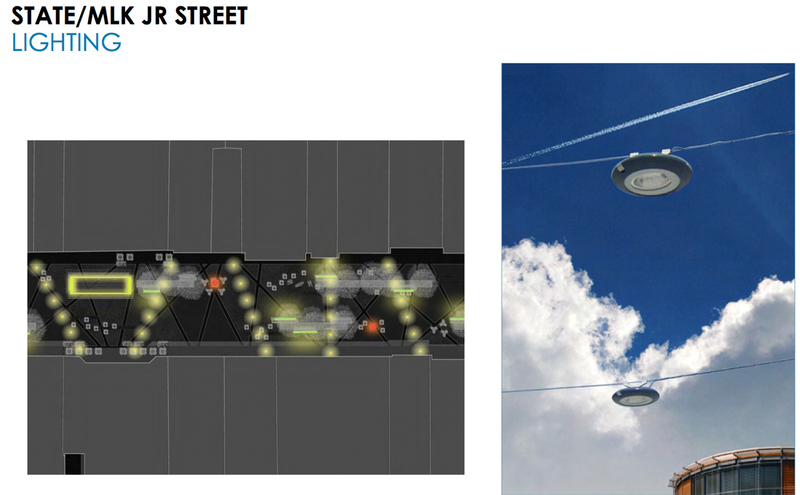 It’s no Trevi Fountain, but I think it’s a rather well-planned and inspired design. 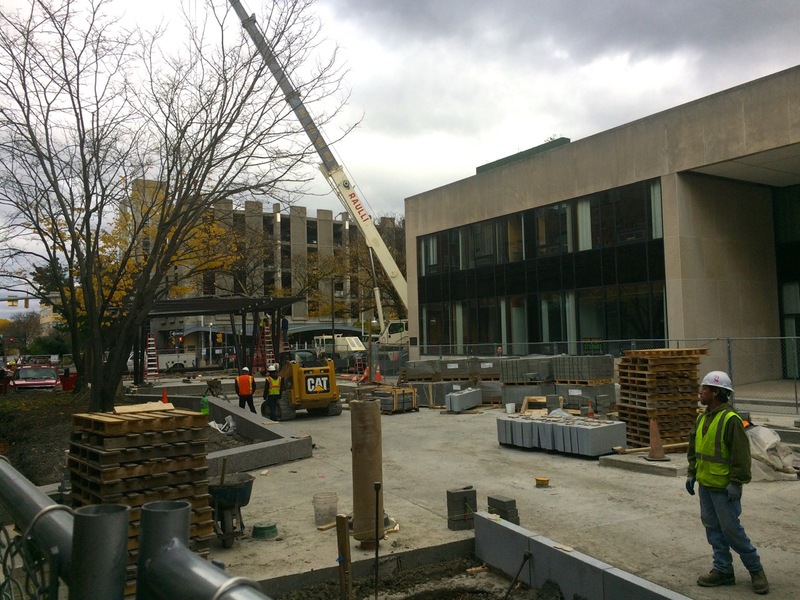 Phase Three (the last phase) of the Commons Rebuild project will start this Spring (bid opening is January 23rd), with the focus on installing the surfaces and amenities for the redesign. 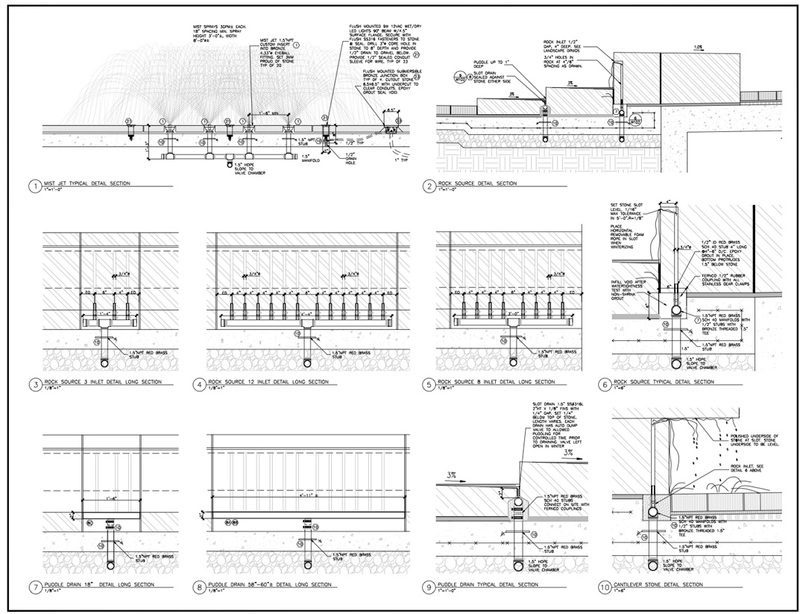 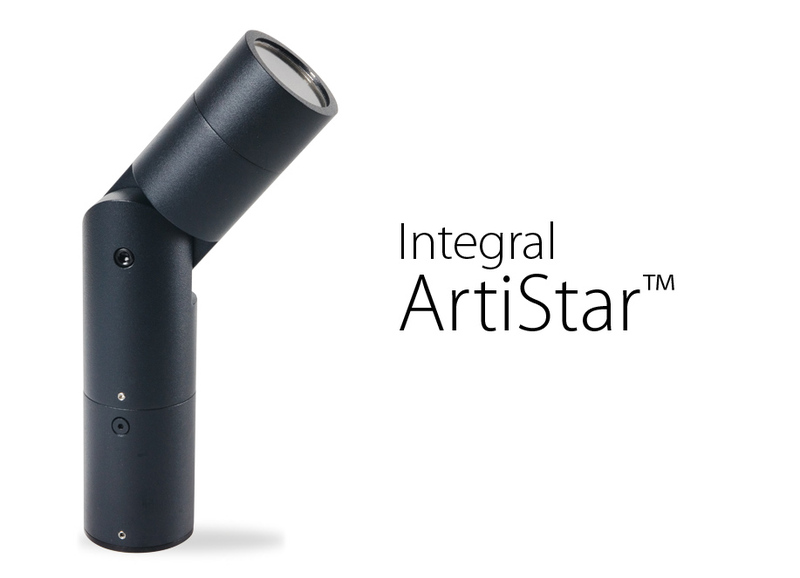 The full scope and contract documents run up to the 1,000-page range, so I thought I’d condense a few of the items down with basic explanations on finishes. 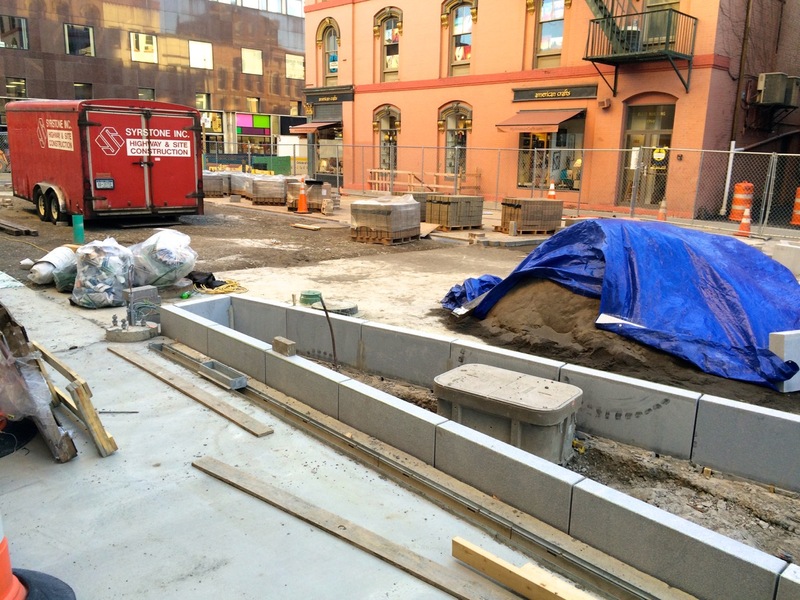 To prevent soil erosion and ensure proper drainage, cast iron surface and scupper drains will be put in place, much like the ones that exist now, and current drains will be cleared of any existing debris. 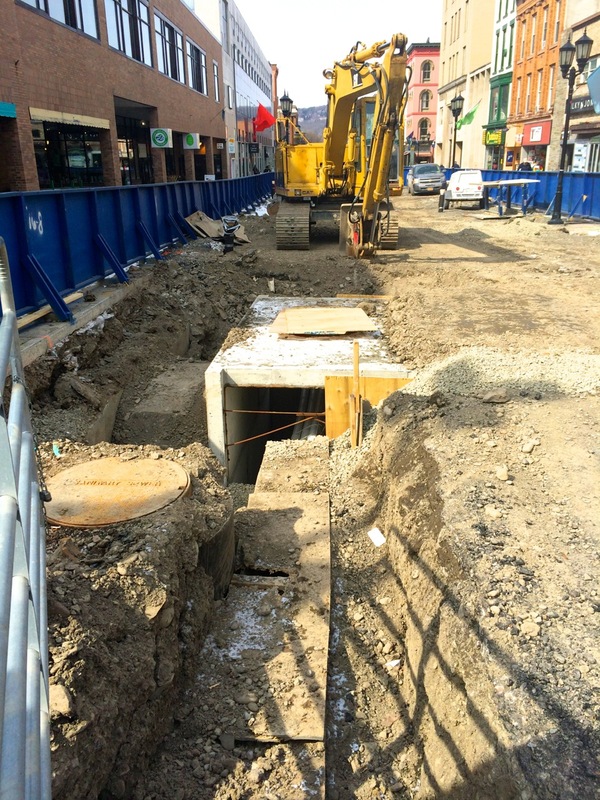 The drains are primarily located in the side areas where surface water funnels, since the surface is designed to elevate slightly towards the center, much like a street. 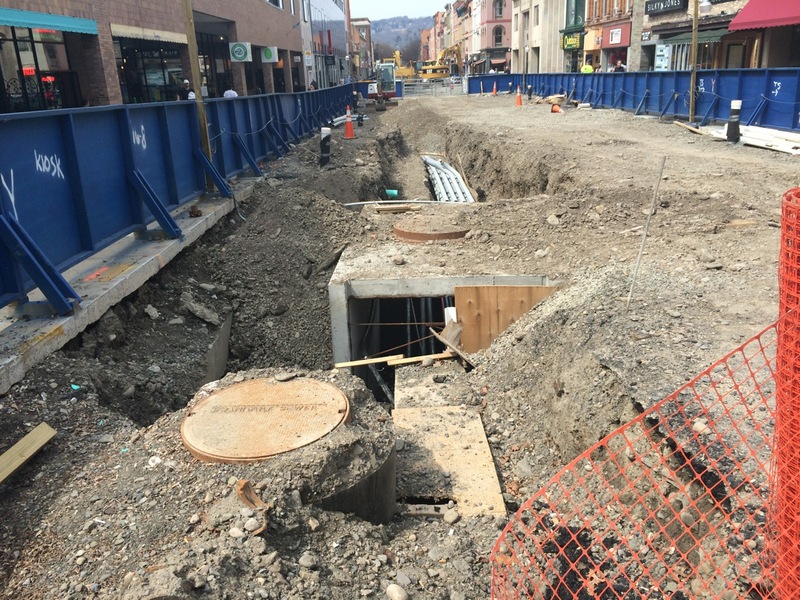 Each drain then feeds into the main stormwater sewer via PVC pipe. 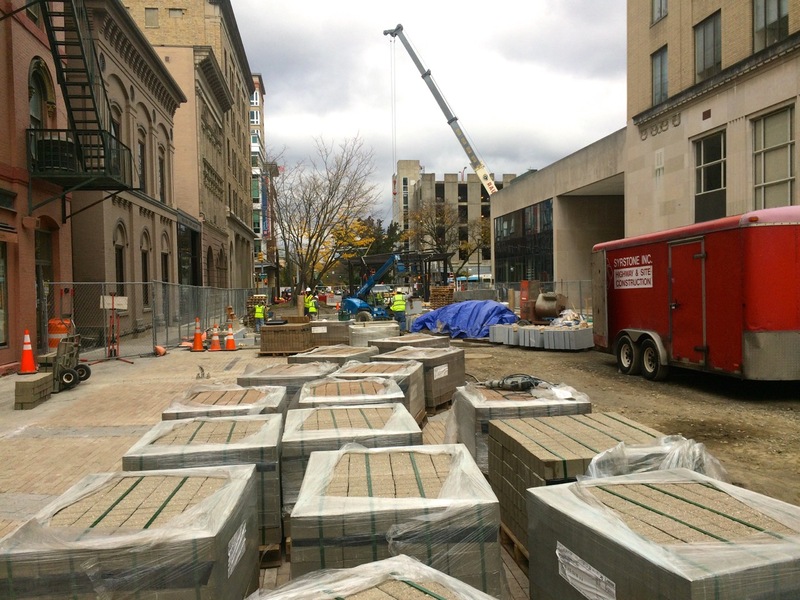 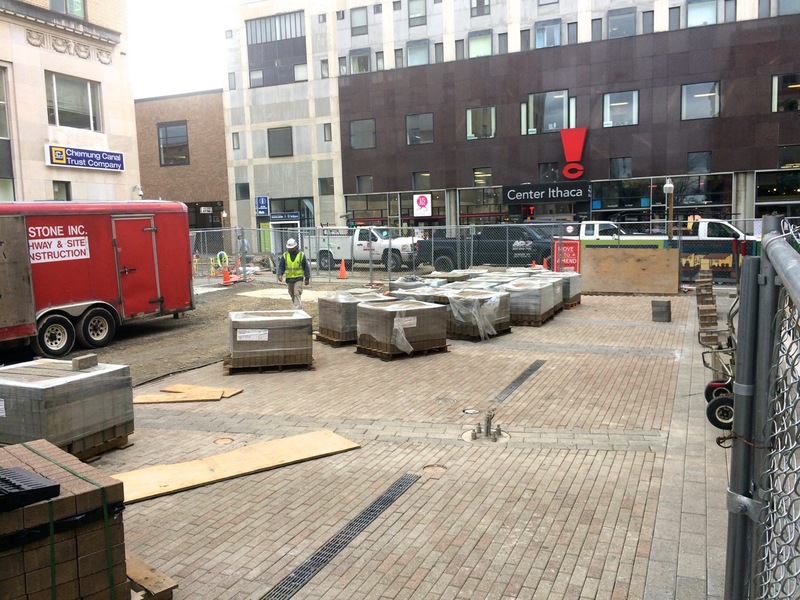 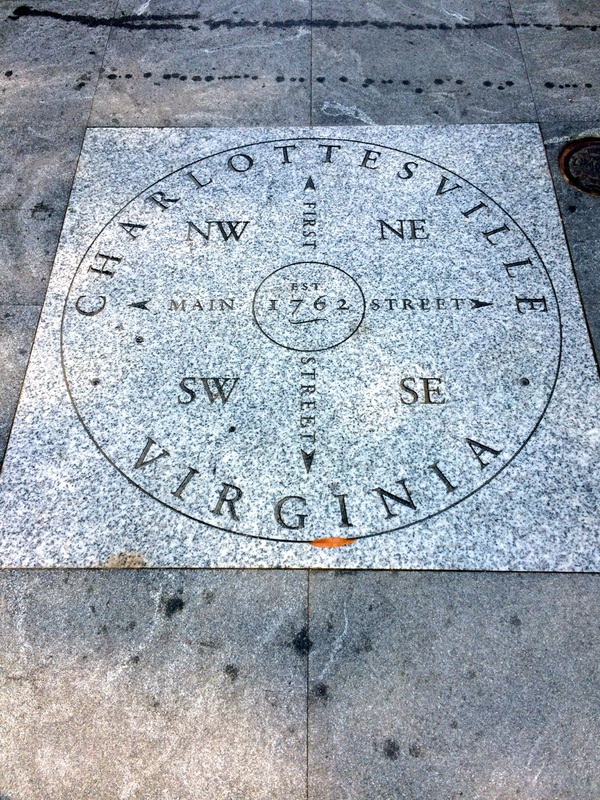 The surfaces will mainly comprise of textured and non-textured granite pavers, mortared granite pavers, concrete pavers, and cast in place concrete paving. 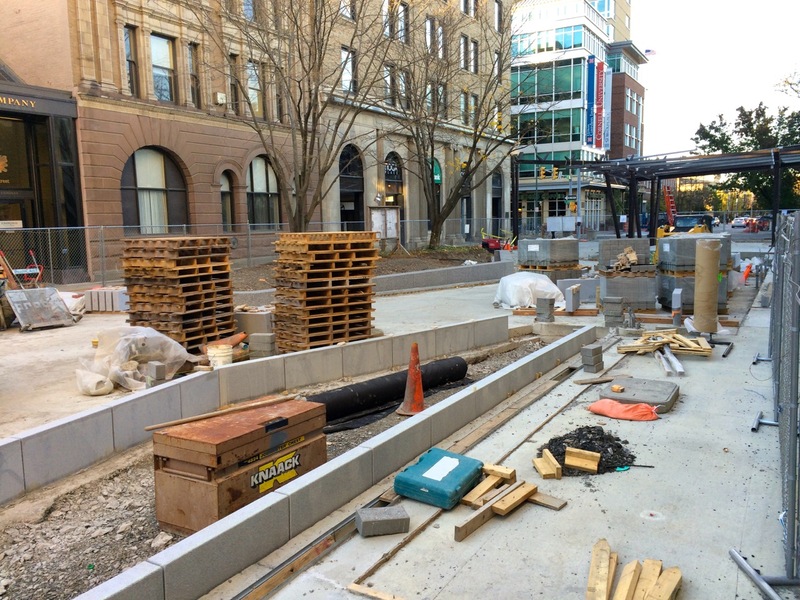 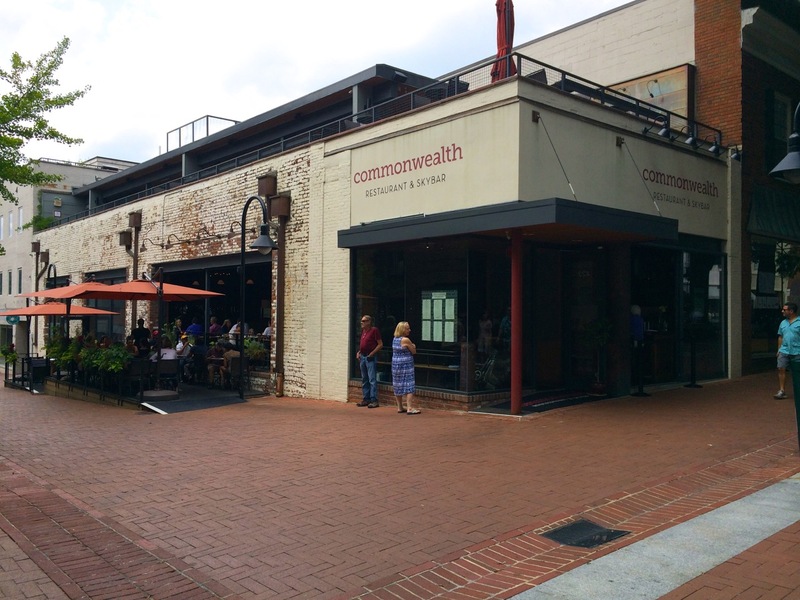 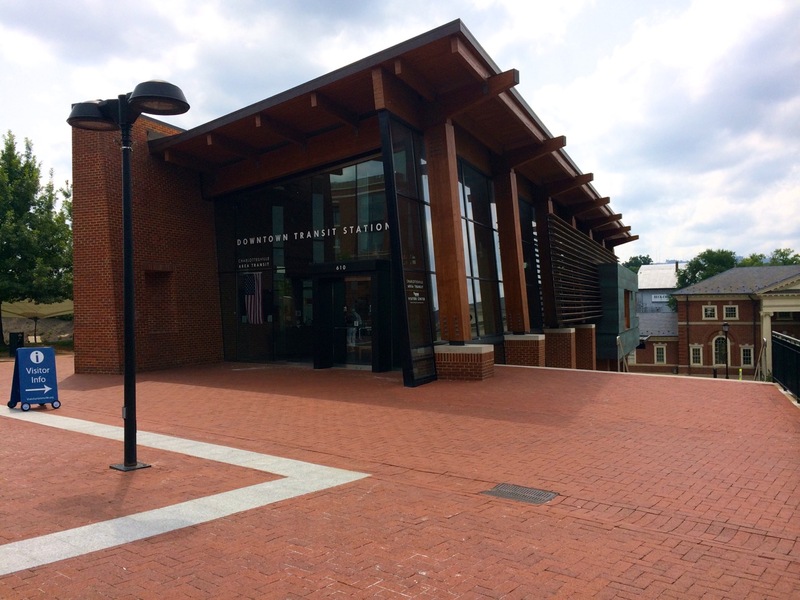 The granite pavers will be supplied by J.C. Stone (or equivalent- see Englishman’s Bay), and the concrete pavers will be from Hanover Architectural Products (or equivalent- see PlankStone). 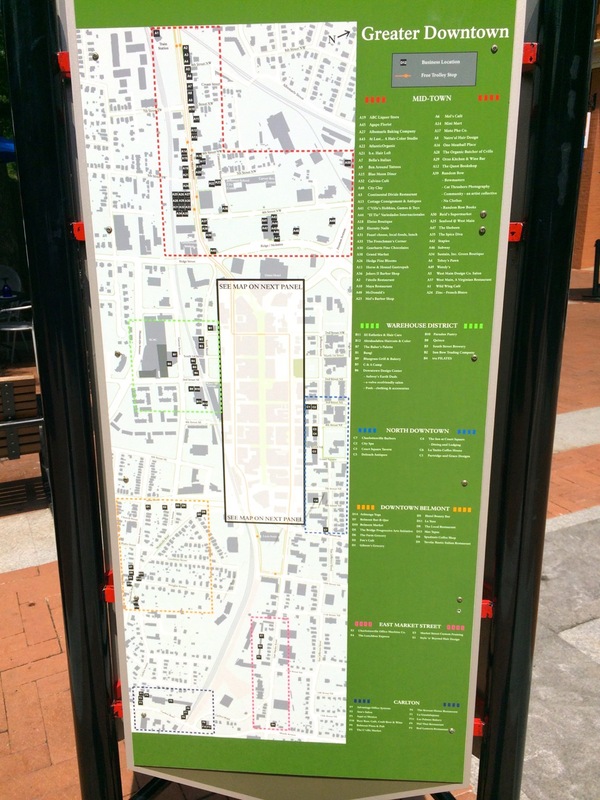 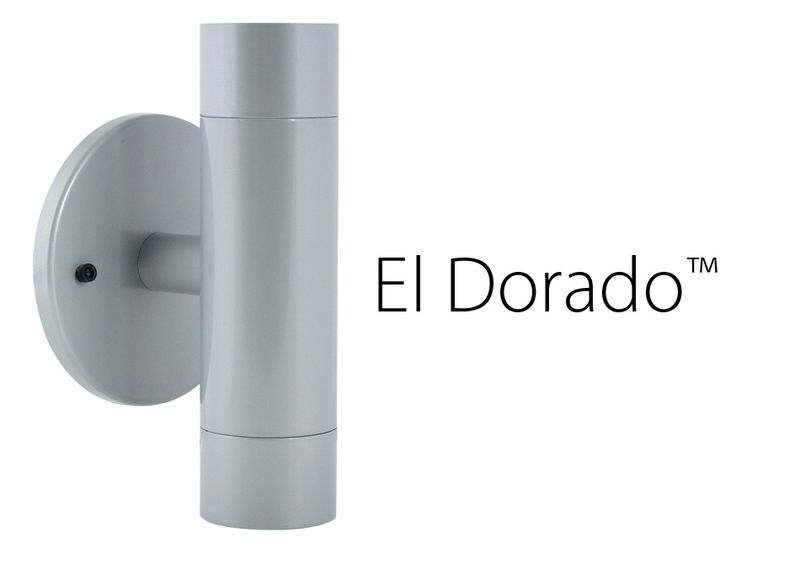 Pretty self-explanatory- there are two different sizes, with various locations. 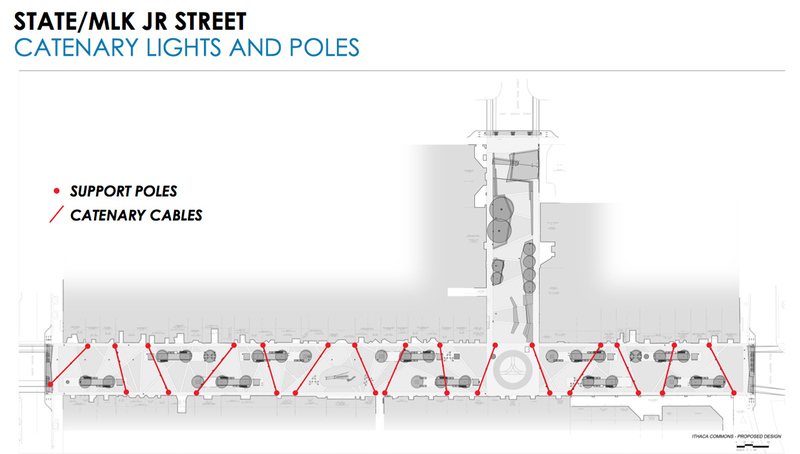 The final lighting will be mostly a combination of lamp post and cable-suspended (the term is “catenary lighting”) Selux Discera 600 LEDs (along the pedestrian way and Bank Alley), Selux Ritorno LED Retrofit Kits (at gateways), BK Lighting “El Dorado” series (at the pavilion and gateways), and “BK Lighting Integral AriStars” (at the pavilion). 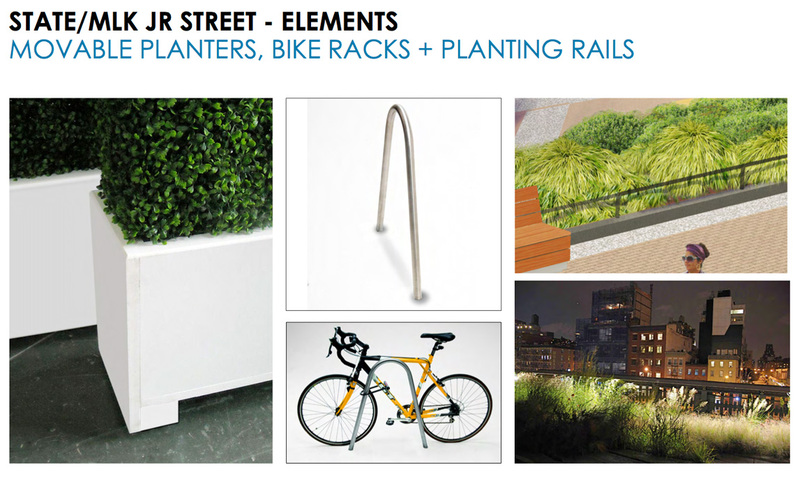 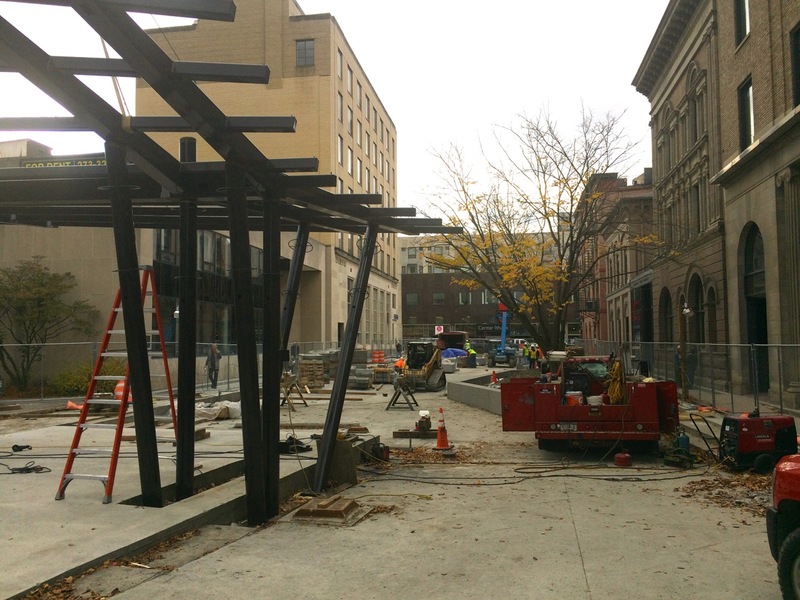 Part Two will contain details on benches, tables, bike racks, plantings, the pavilion, and water features. 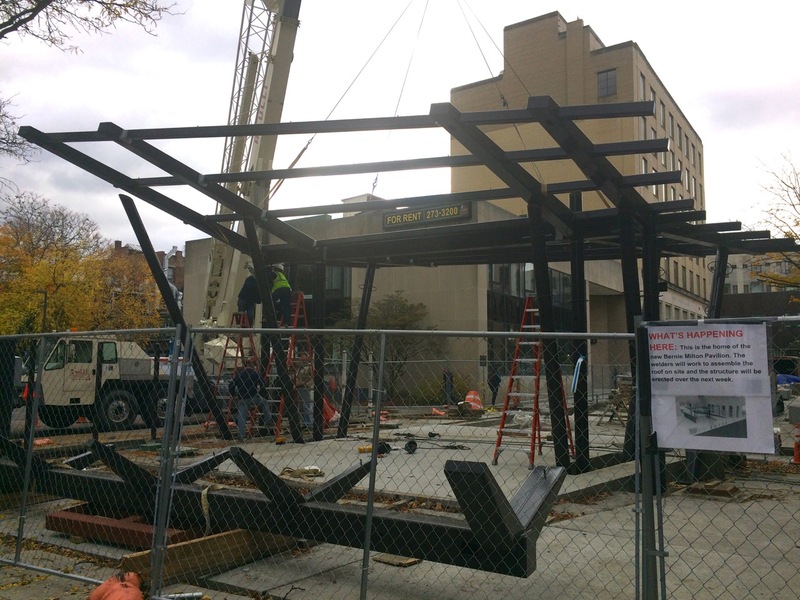 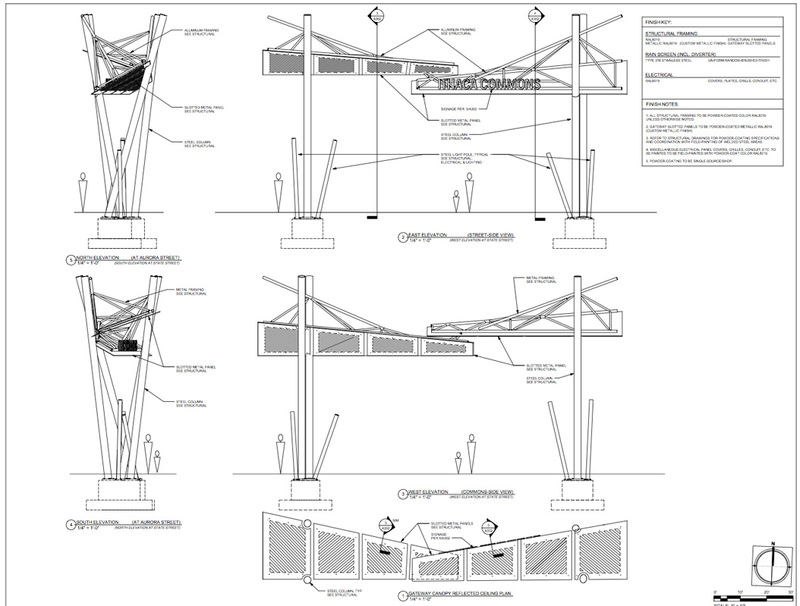 Last month, the City of Ithaca requested proposals to design the new future custom play structure for the Commons Rebuild project. 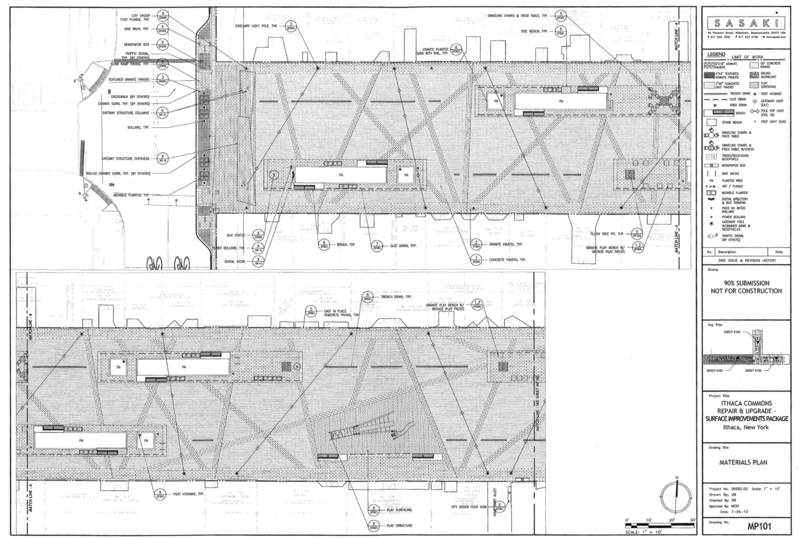 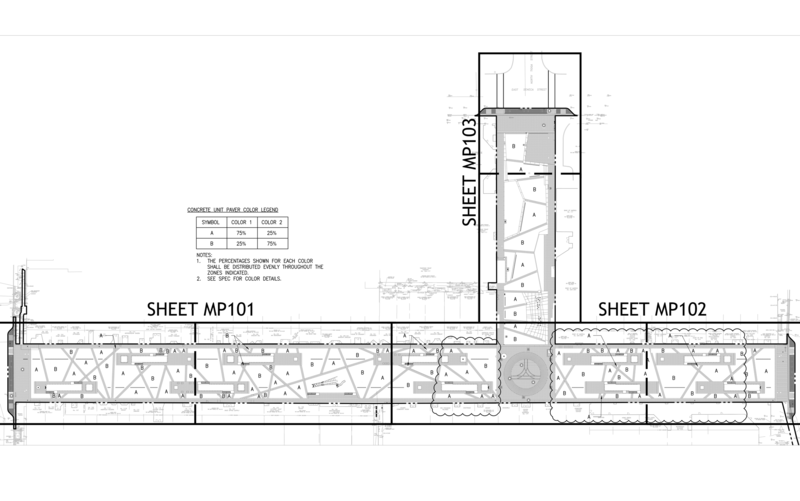 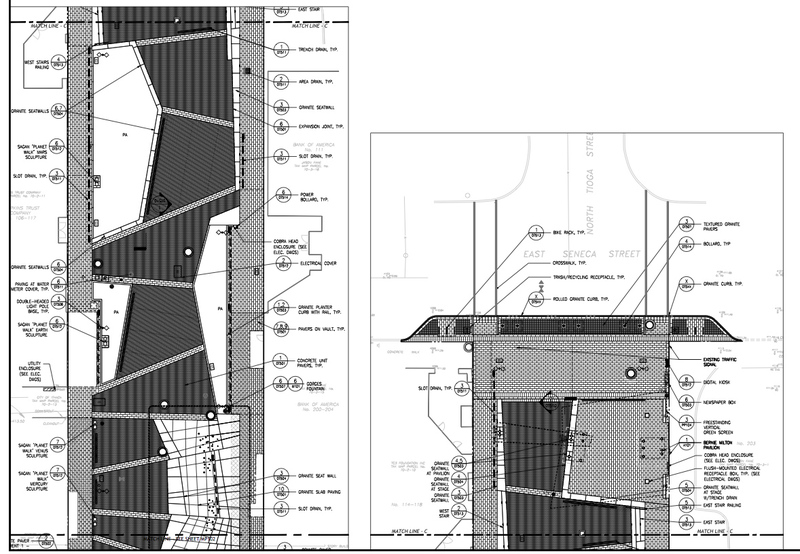 Below are the location map documents, and the RFP. 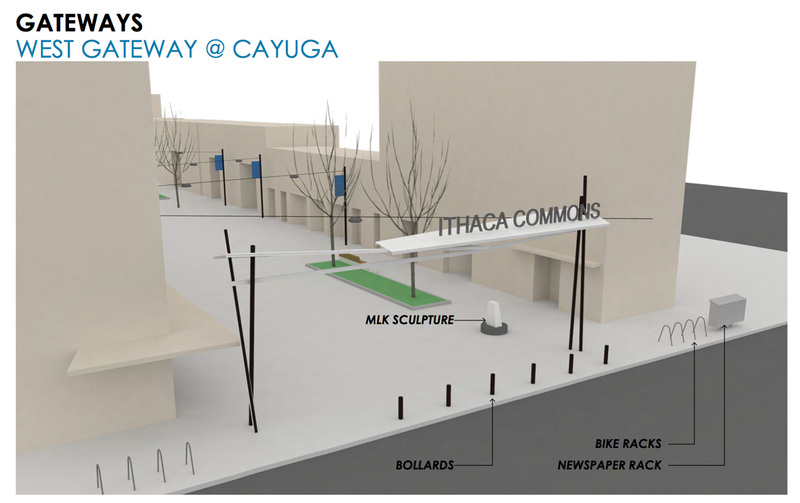 The initial design was a proposed model from Sasaki Associates, the design consultants for the Commons Rebuild project. 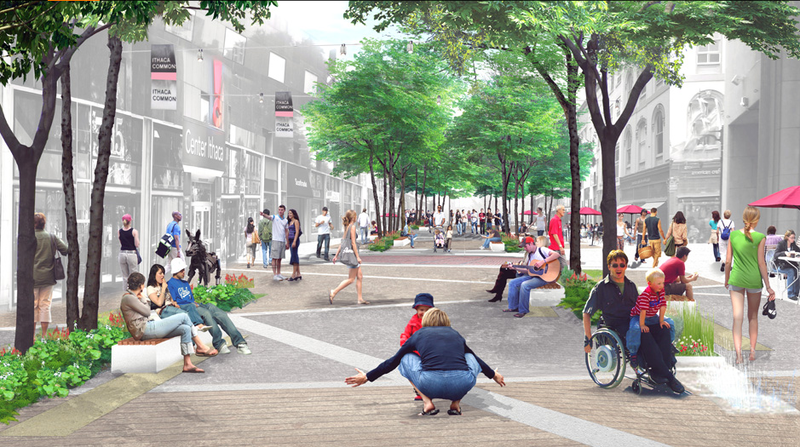 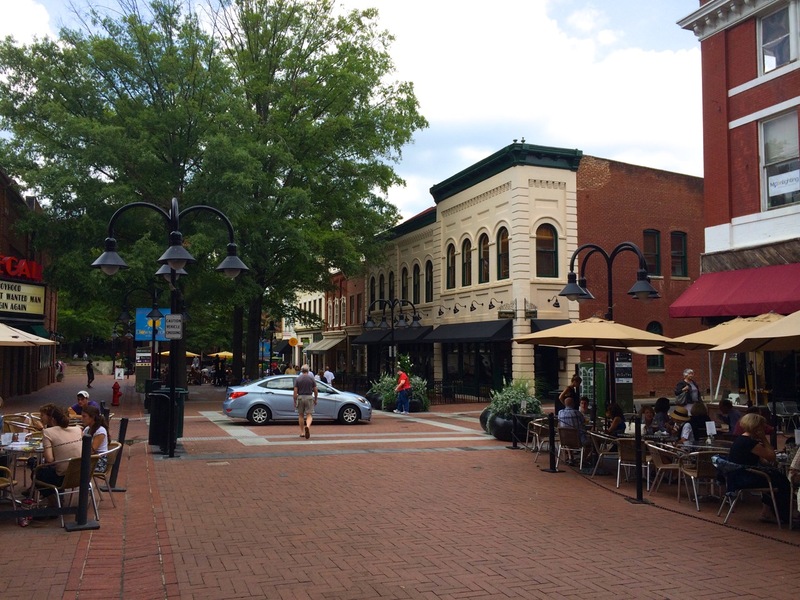 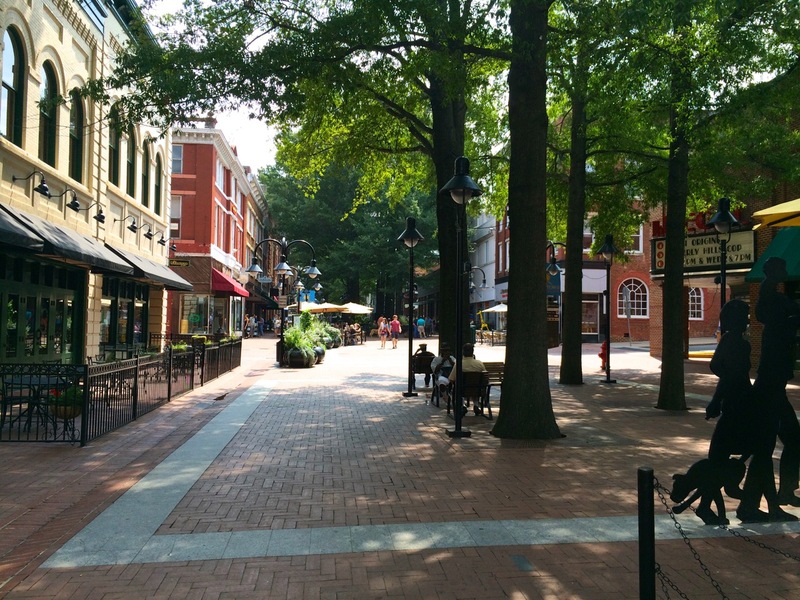 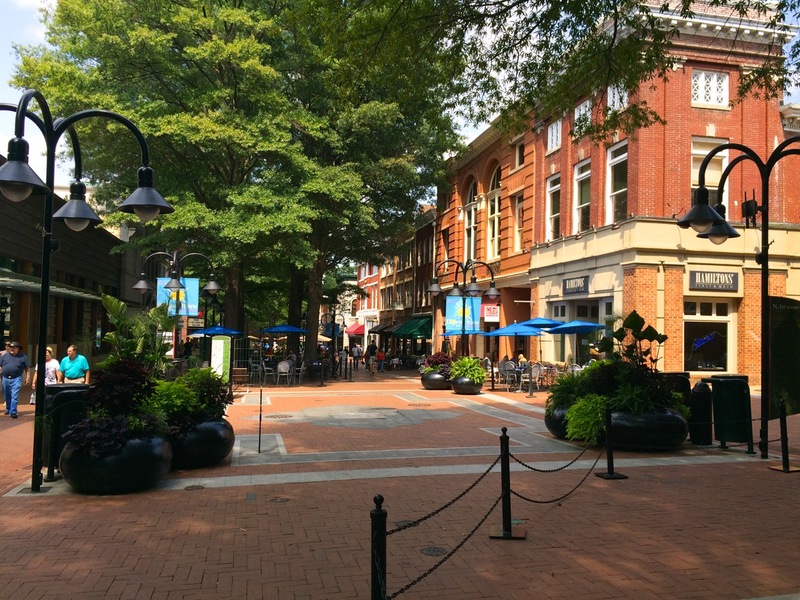 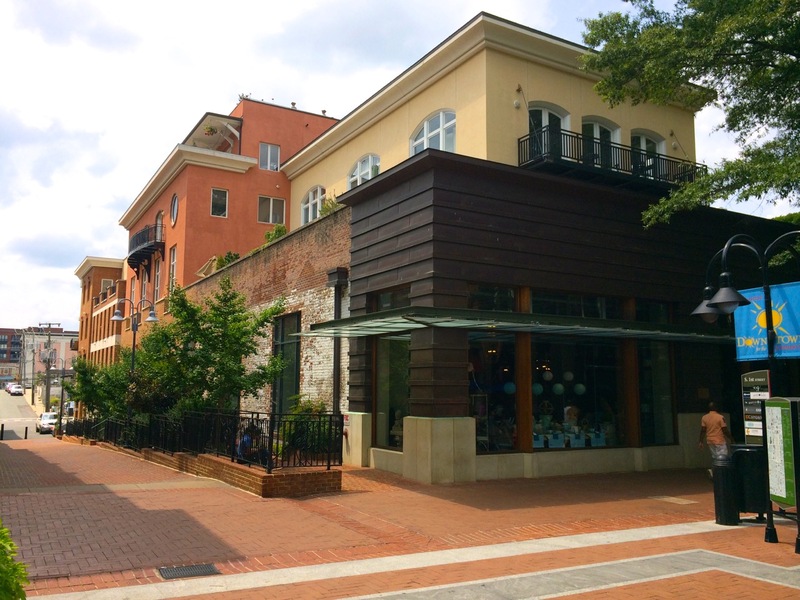 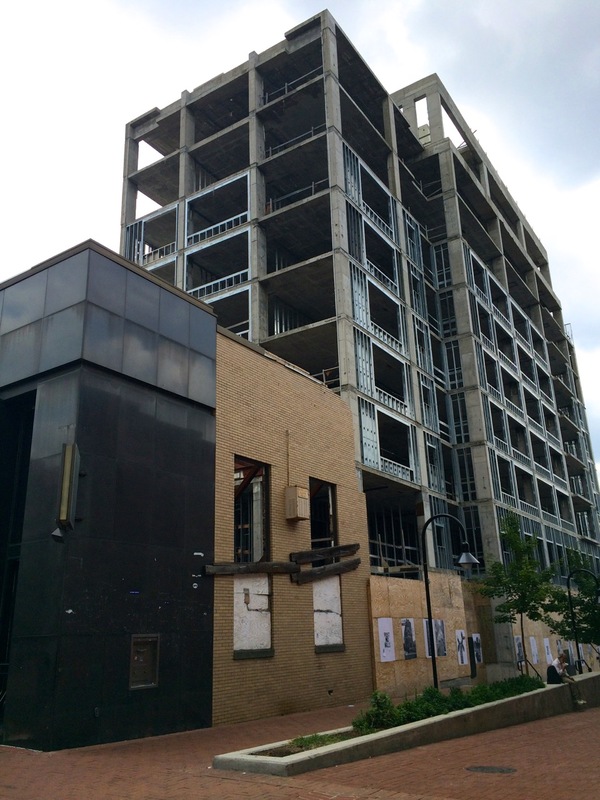 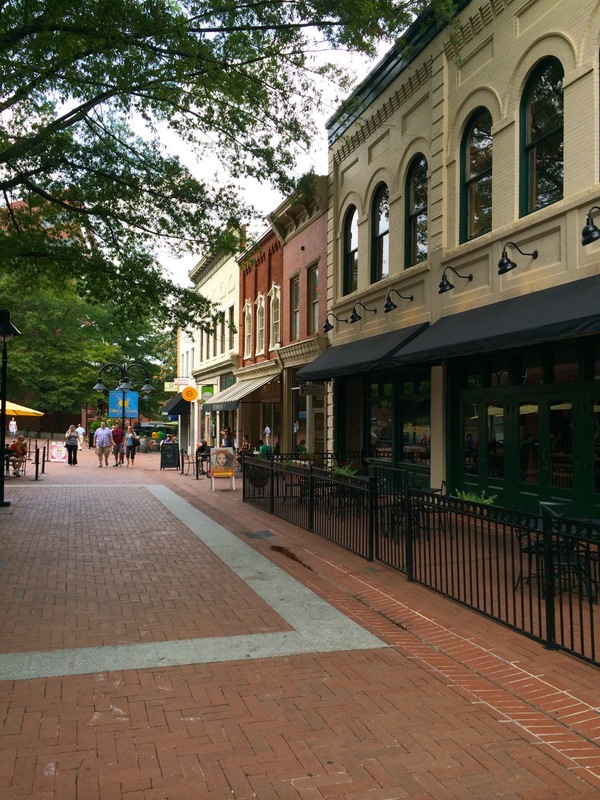 The design proposals would likely be reviewed at a future Planning & Development Meeting. 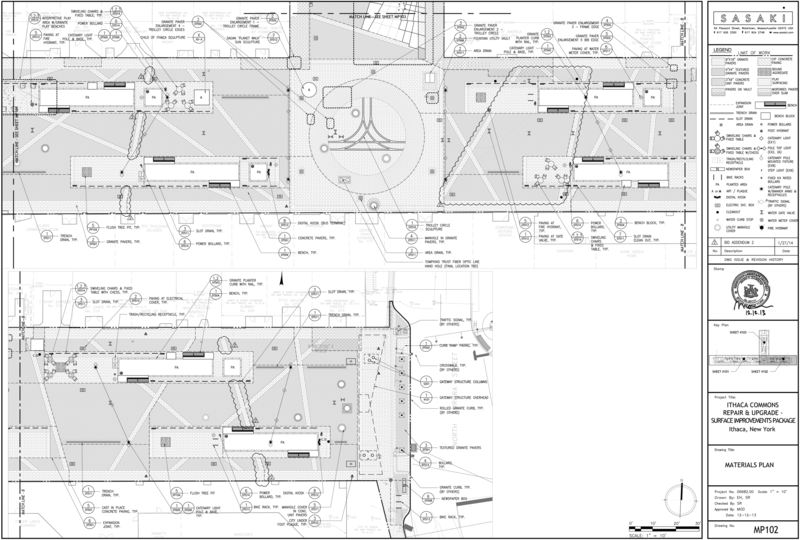 The proposal calls for play features that exceed ADA requirements- there is a section in the Americans with Disabilities Act that outlines the requirements for these features, which include accessible routes, ground level activities, and transfer stations (there’s a good link here to some short descriptions of each requirement). 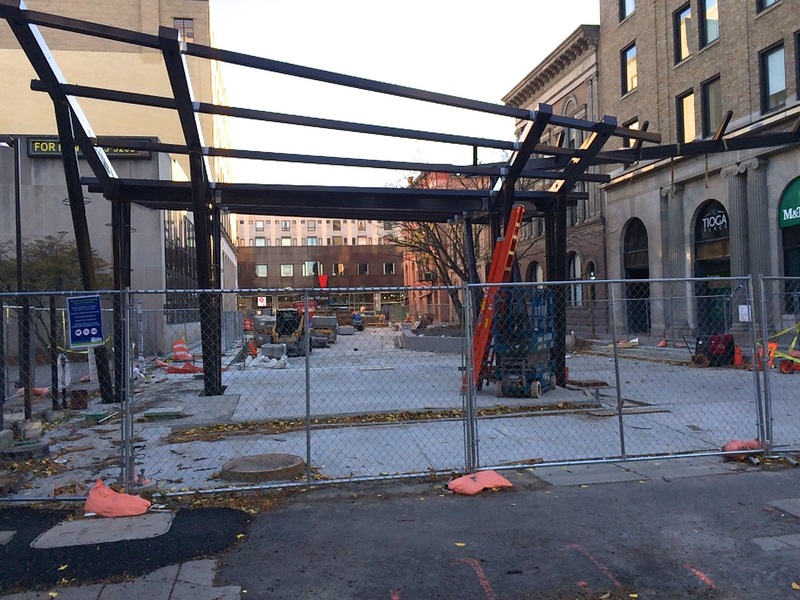 Architect Robert Leathers, founder of Playgrounds by Leathers is originally from Ithaca and has practiced here for quite a long time (his son Marc now runs the company). 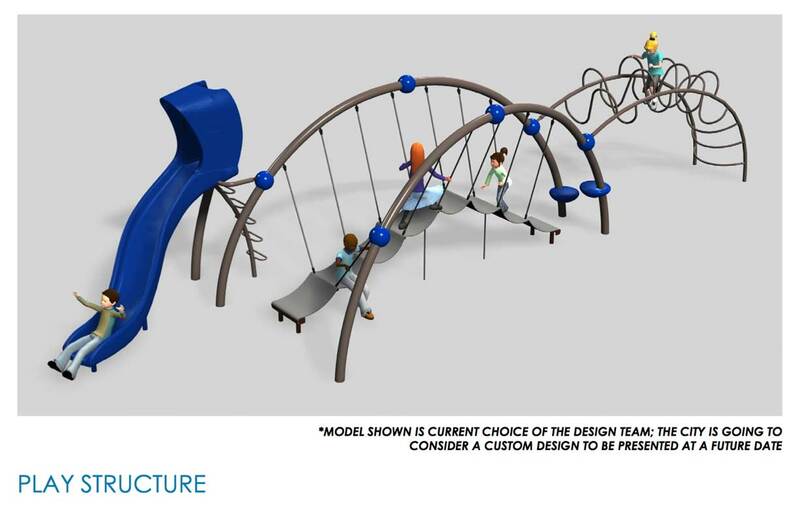 He is quite well-known in the playground design world for his work all over the country and outside with over 3,000 playgrounds designed and built. 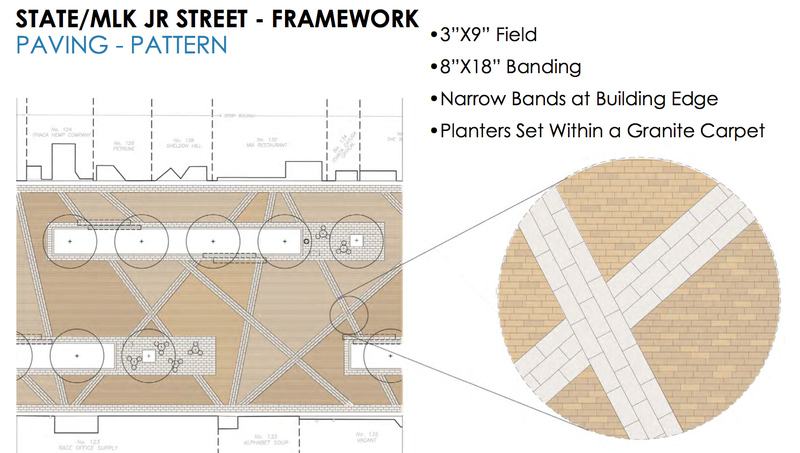 Their process focuses on bringing-in local residents, and especially, the children to help design each project. 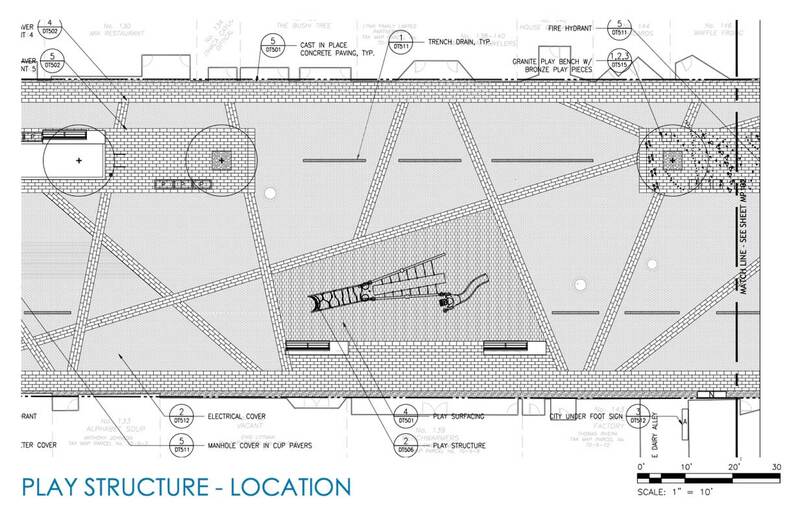 I don’t know if his firm has submitted a proposed design, however, it would make for an interesting turn of events. 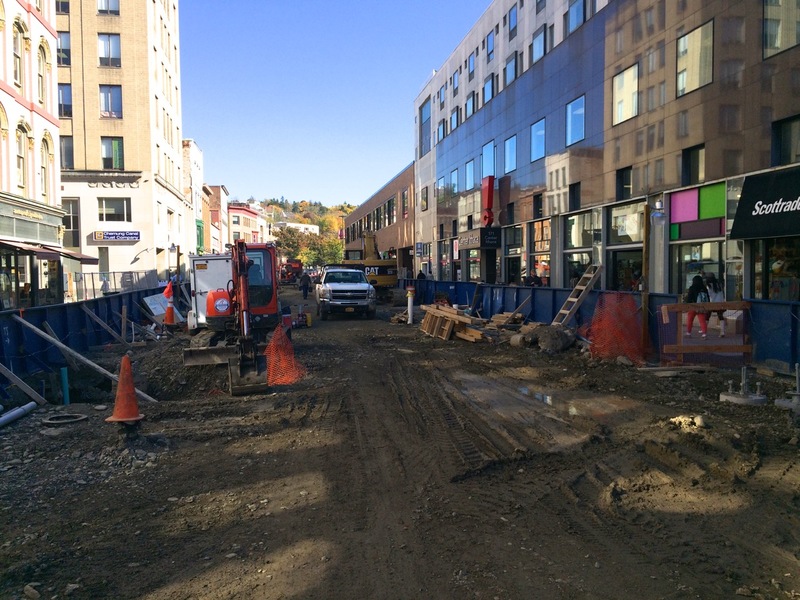 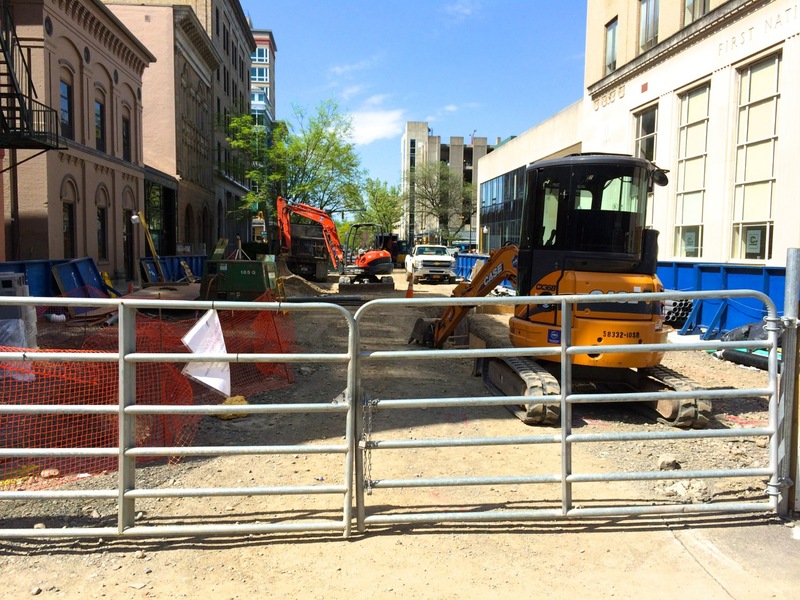 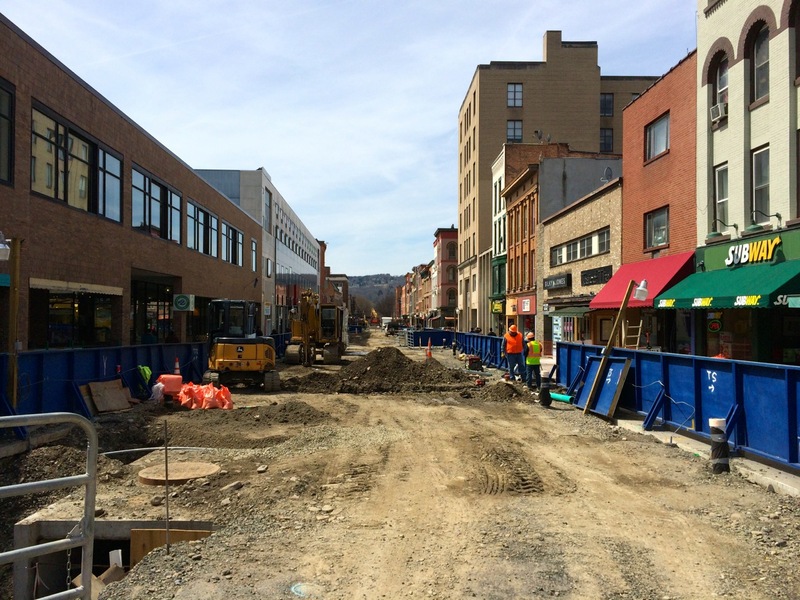 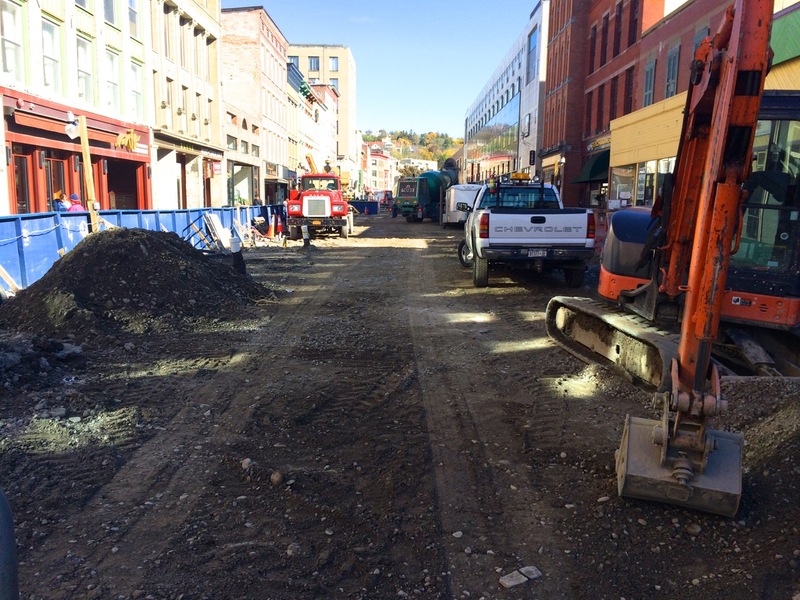 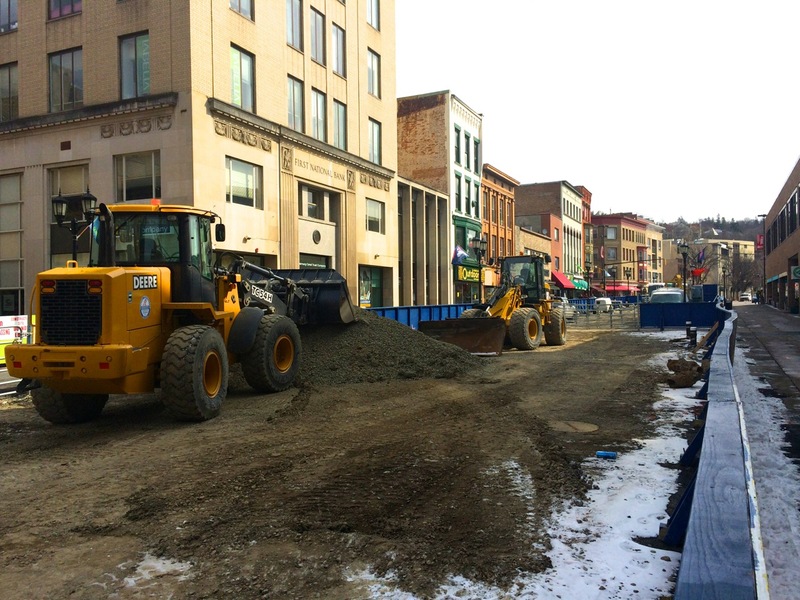 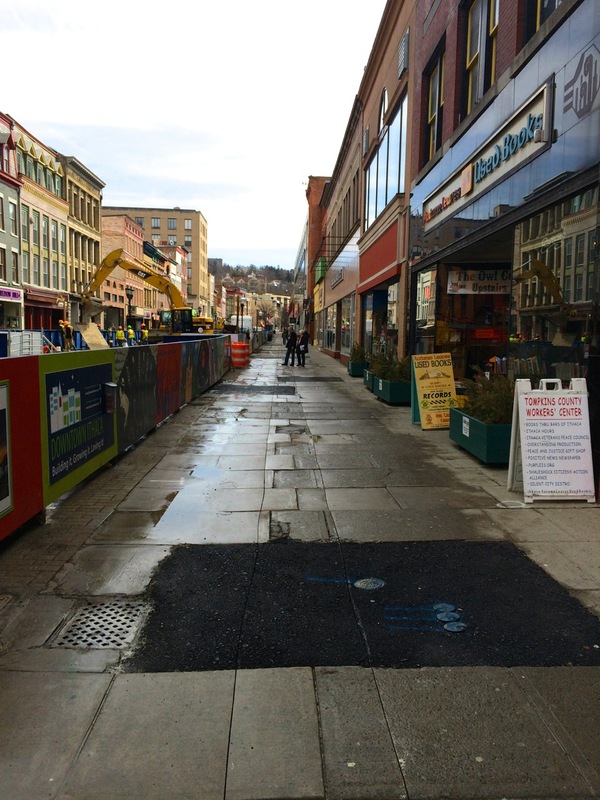 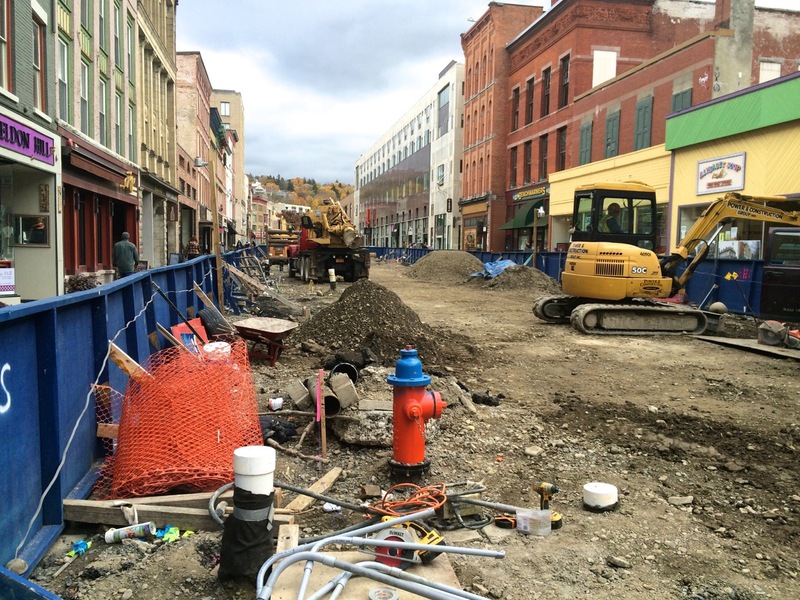 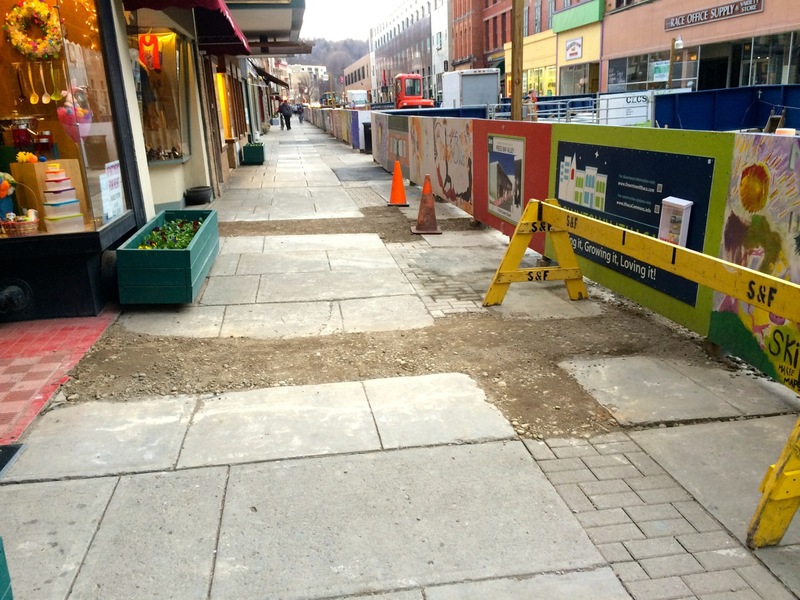 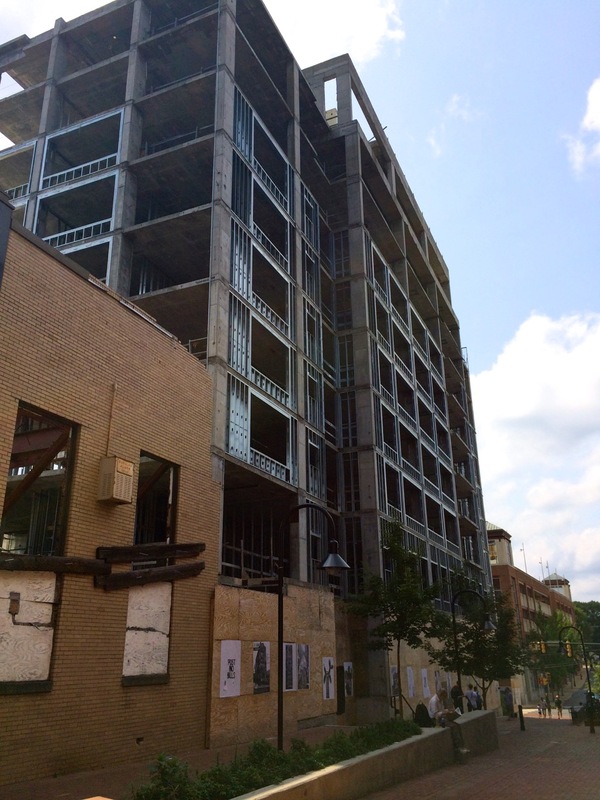 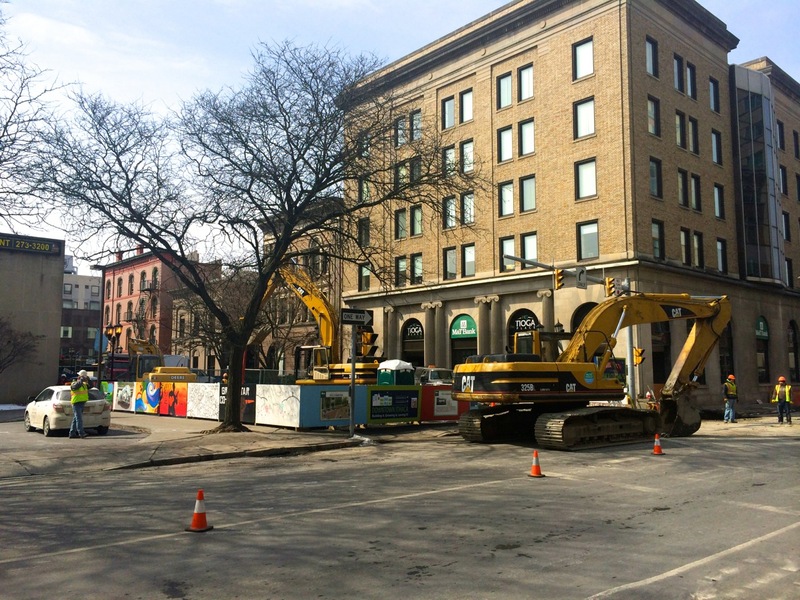 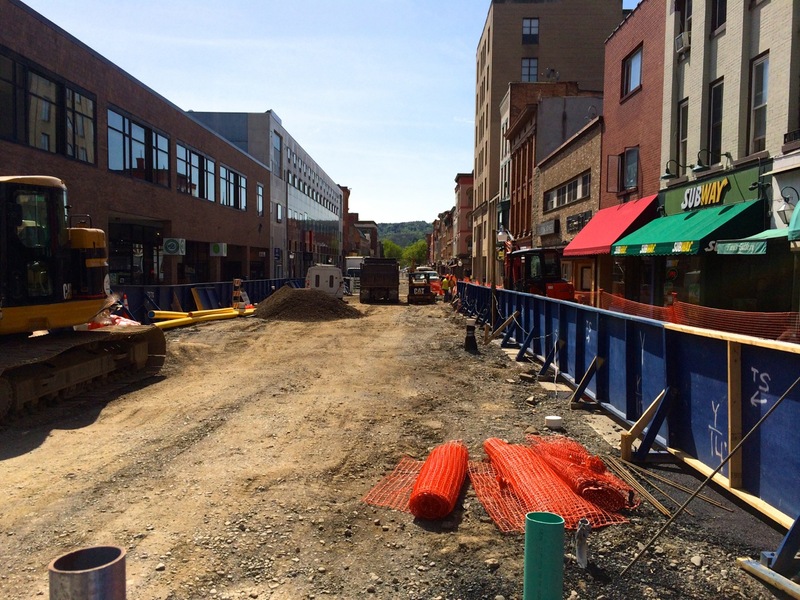 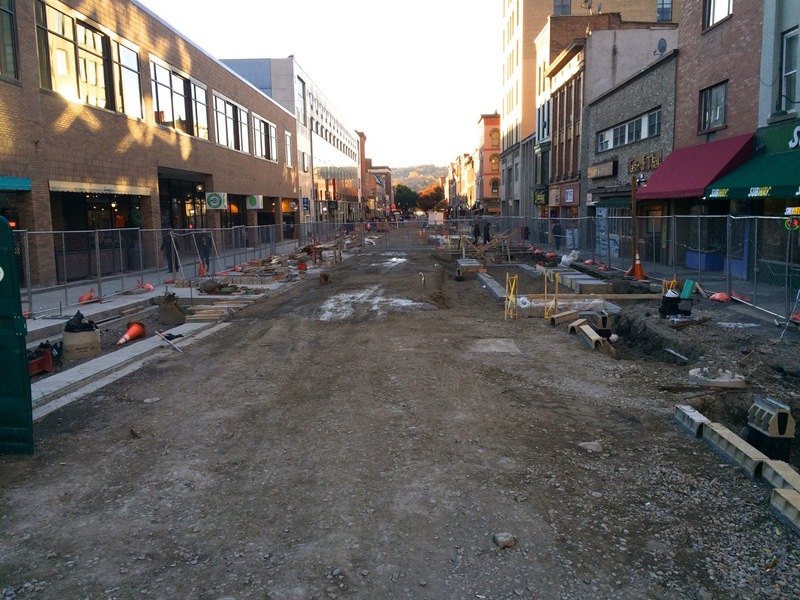 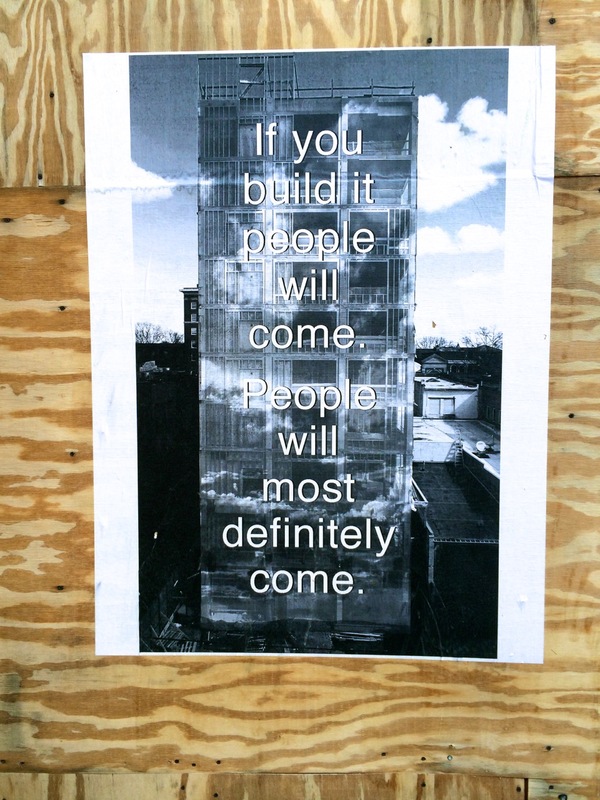 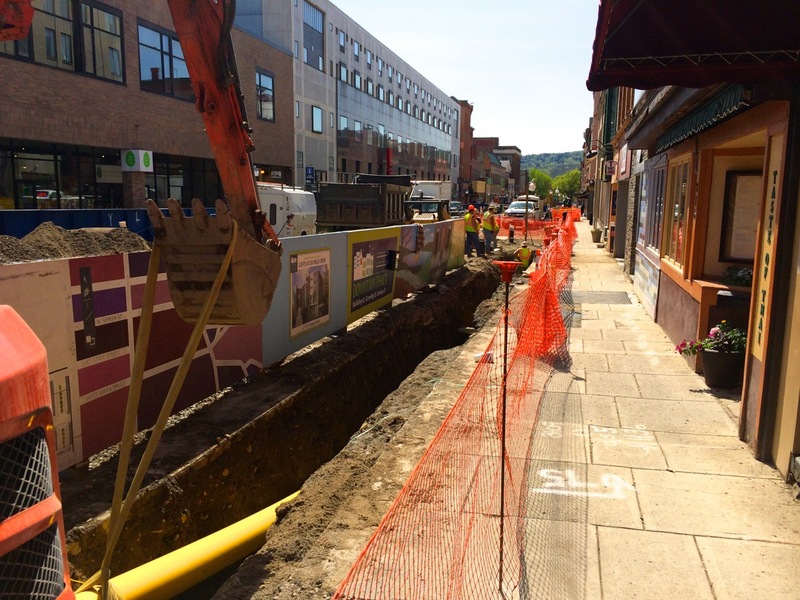 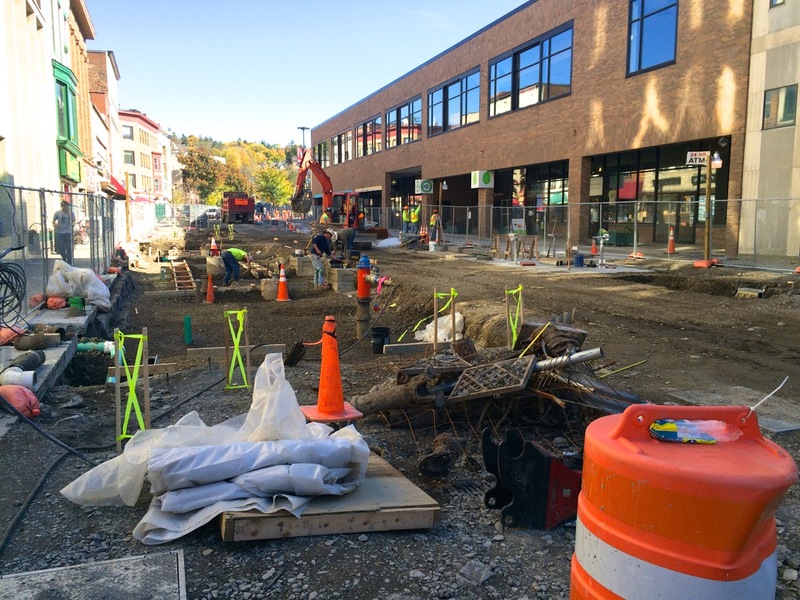 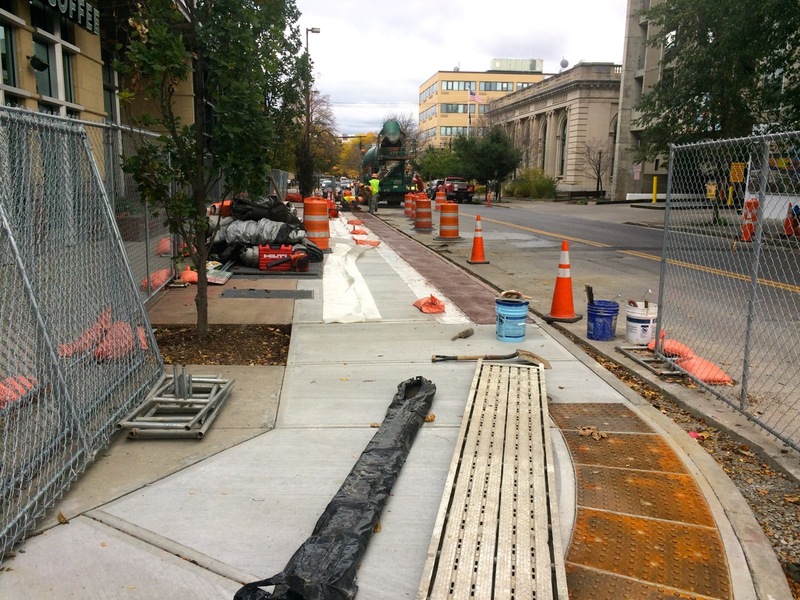 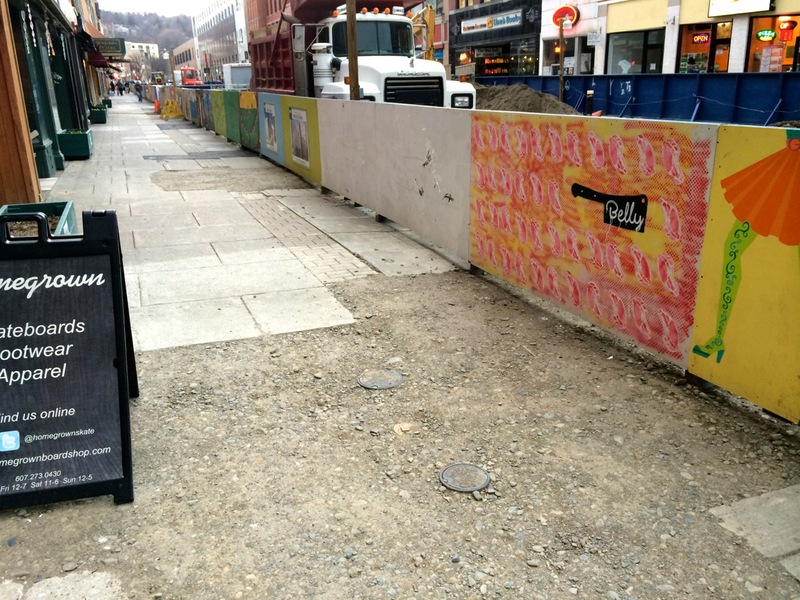 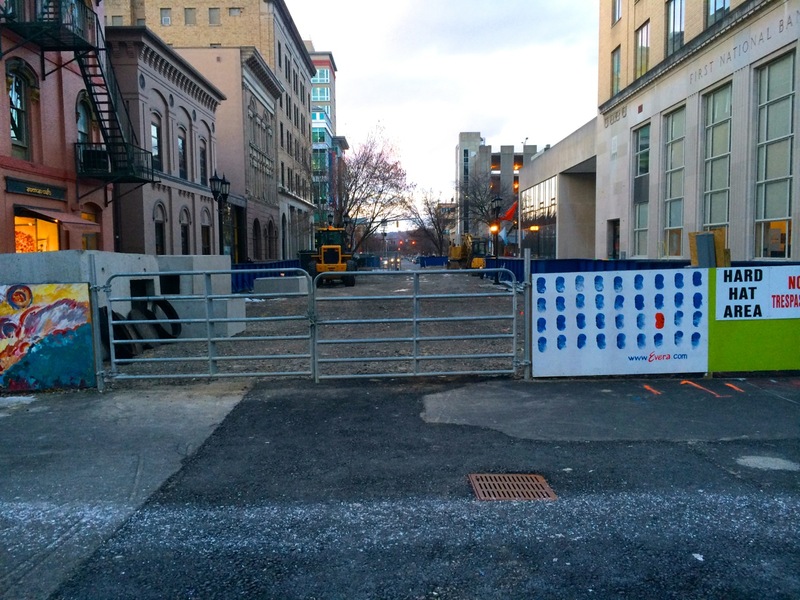 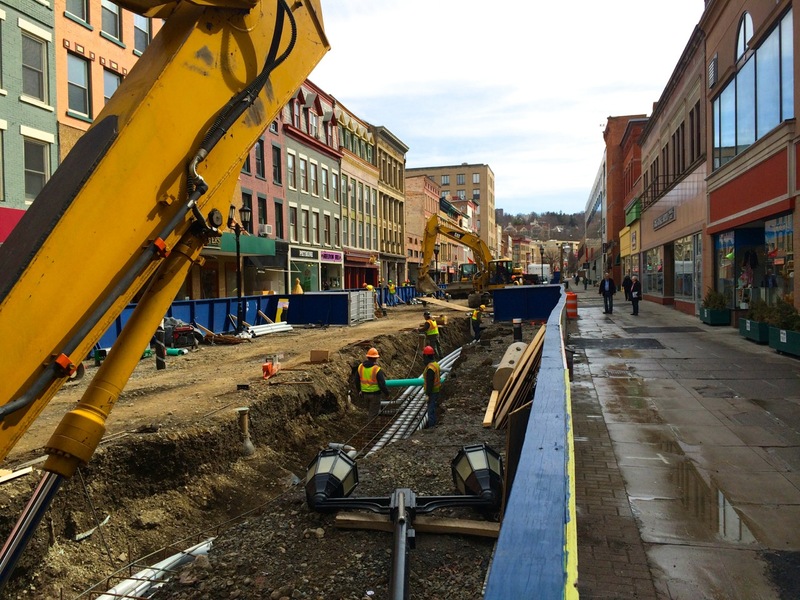 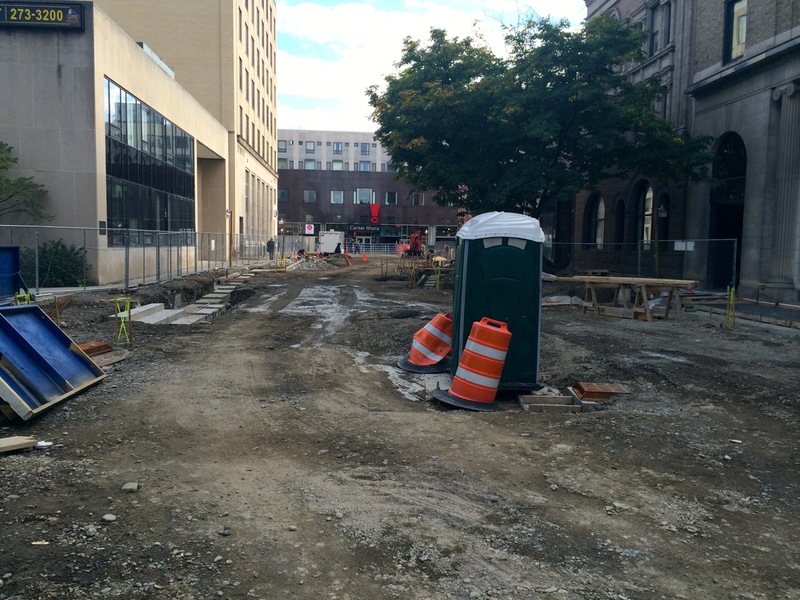 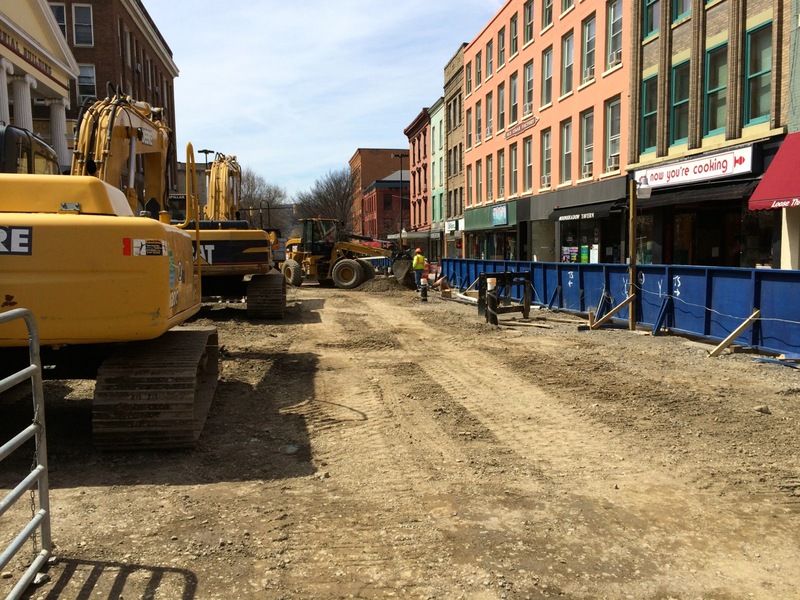 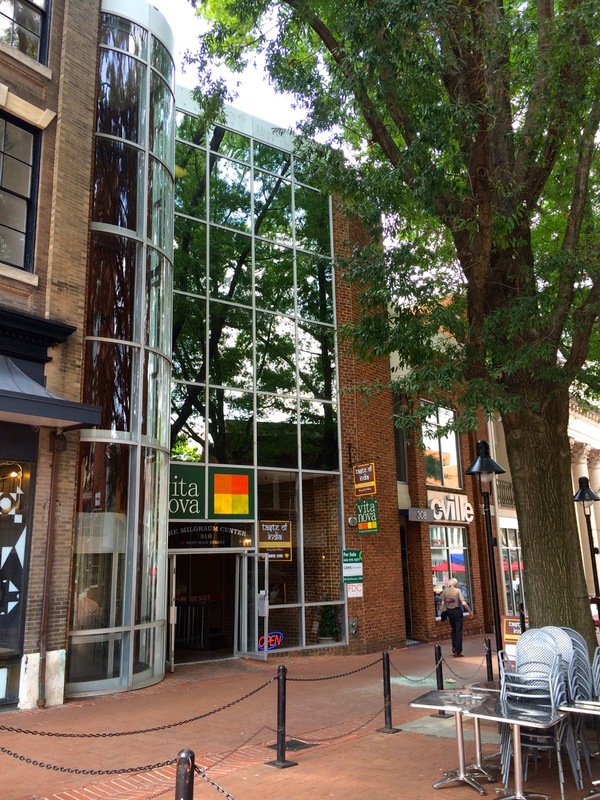 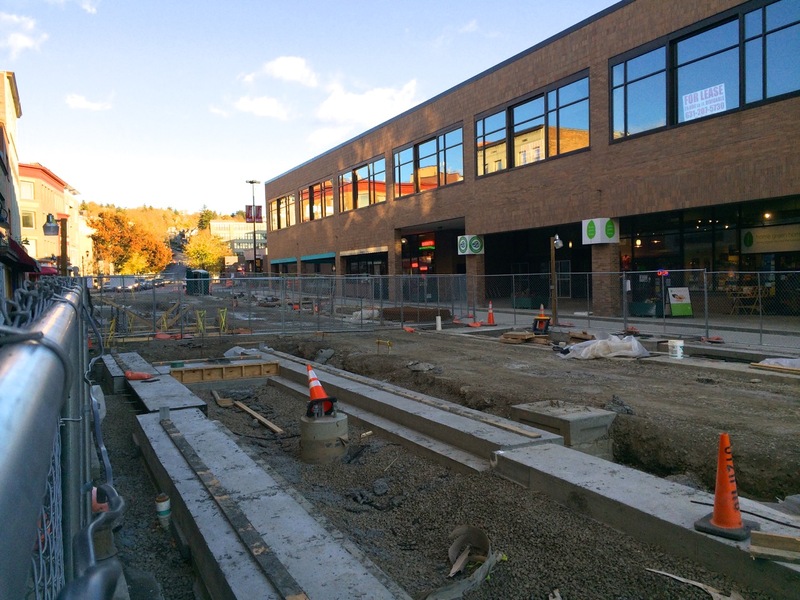 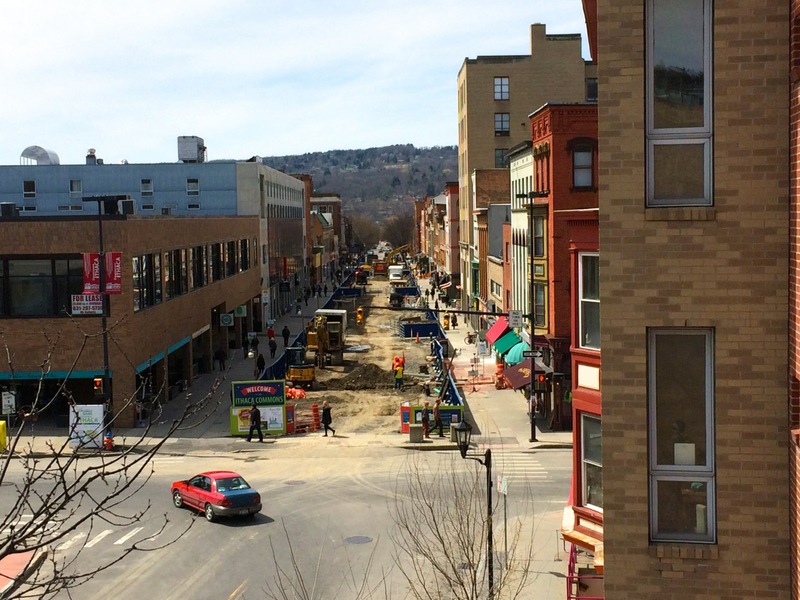 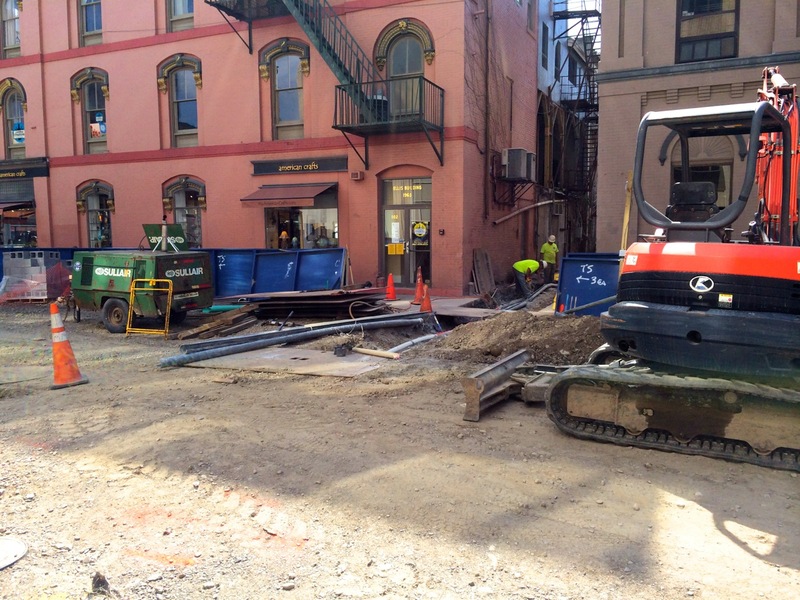 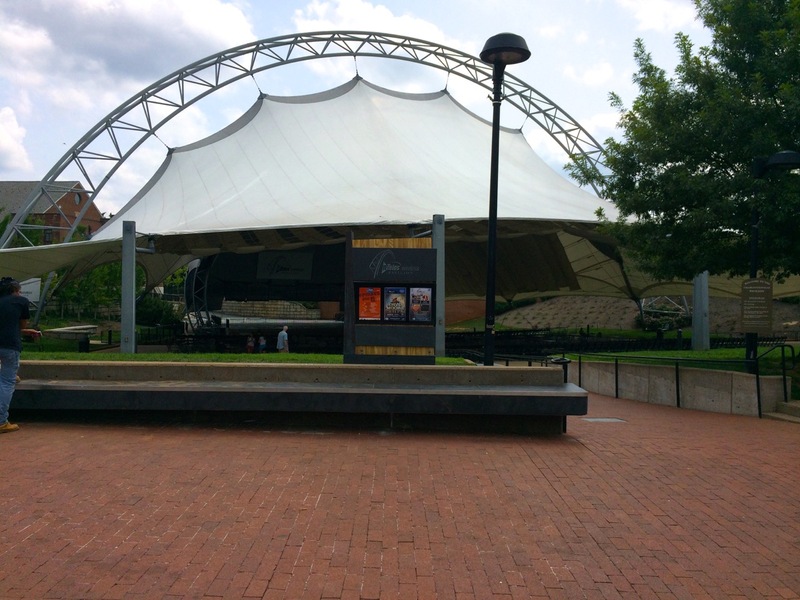 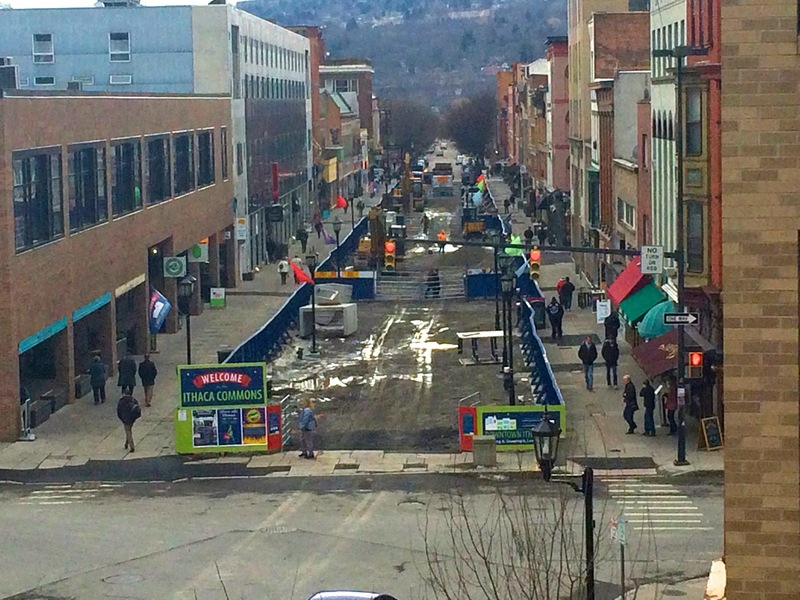 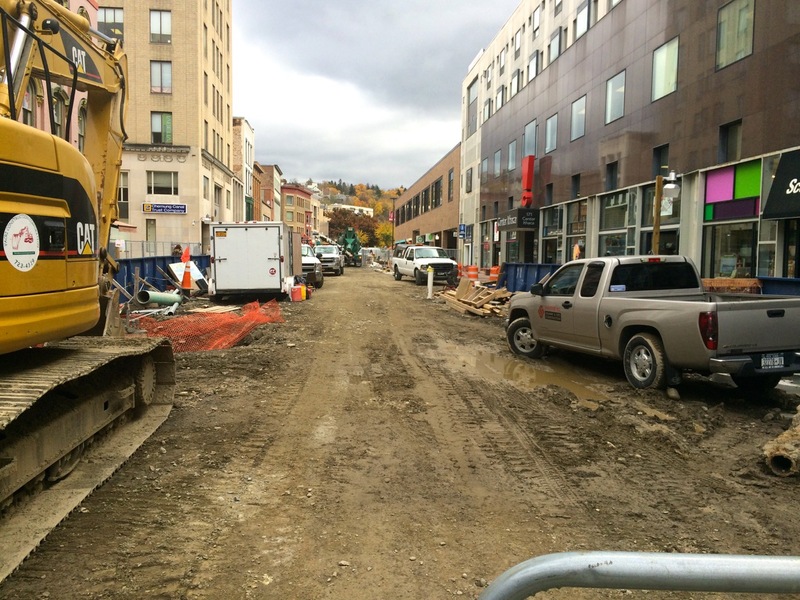 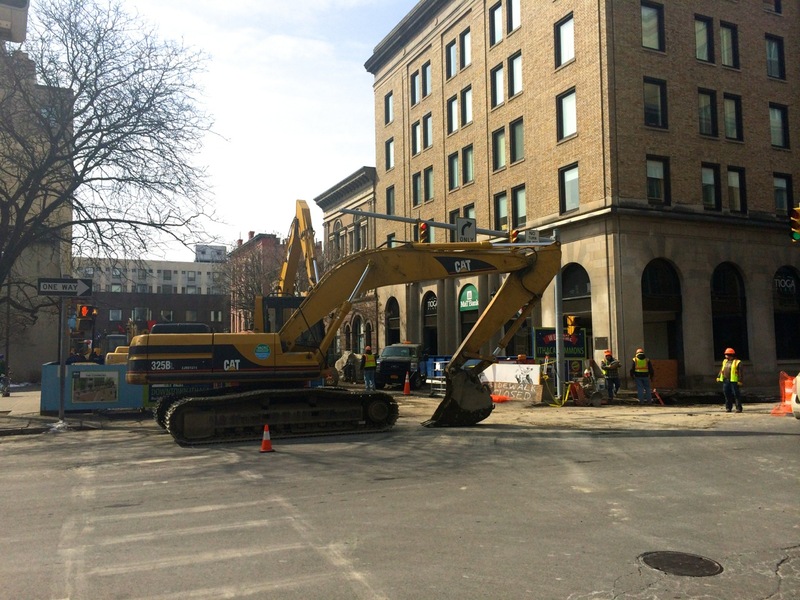 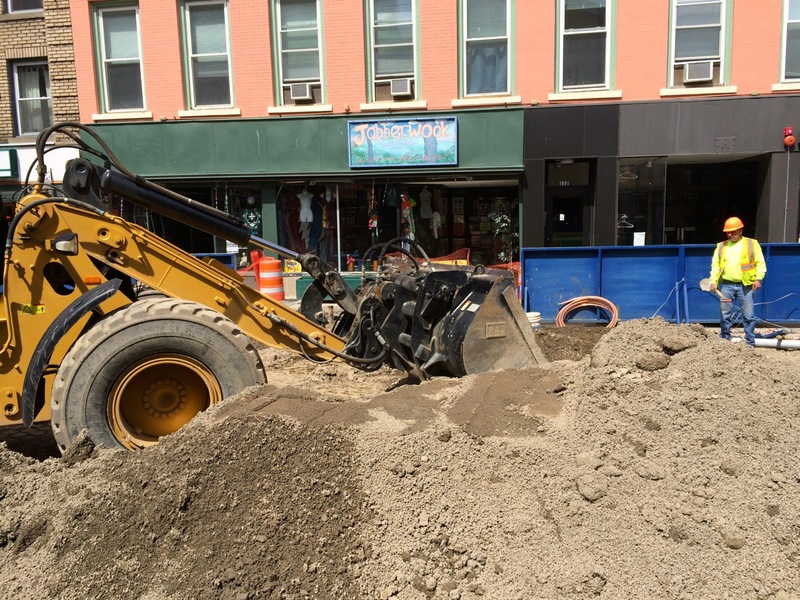 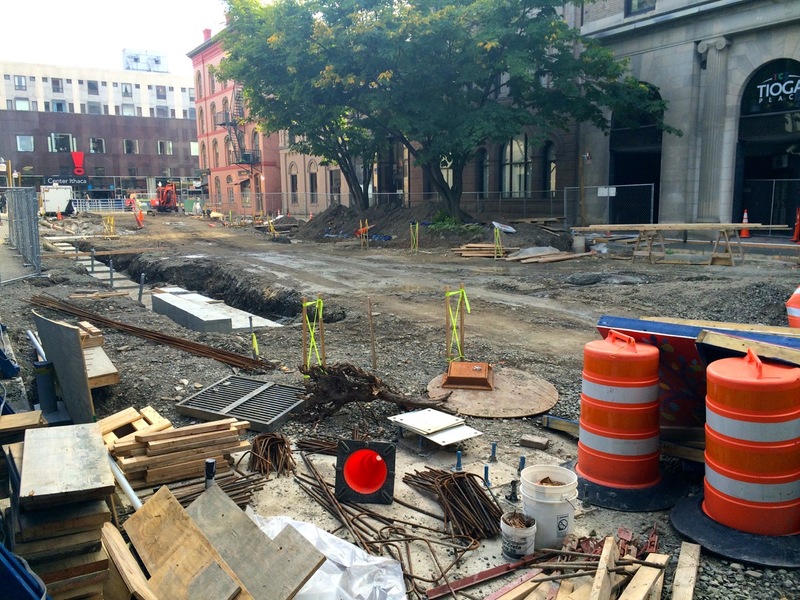 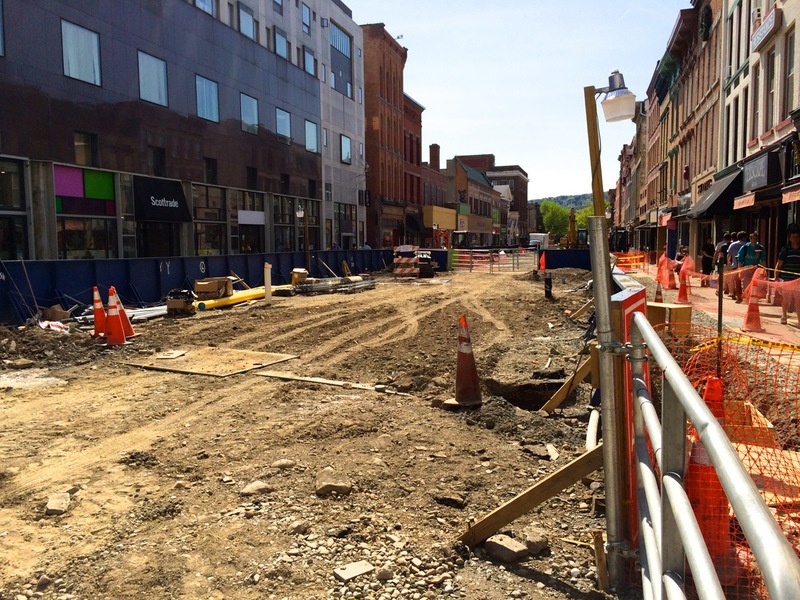 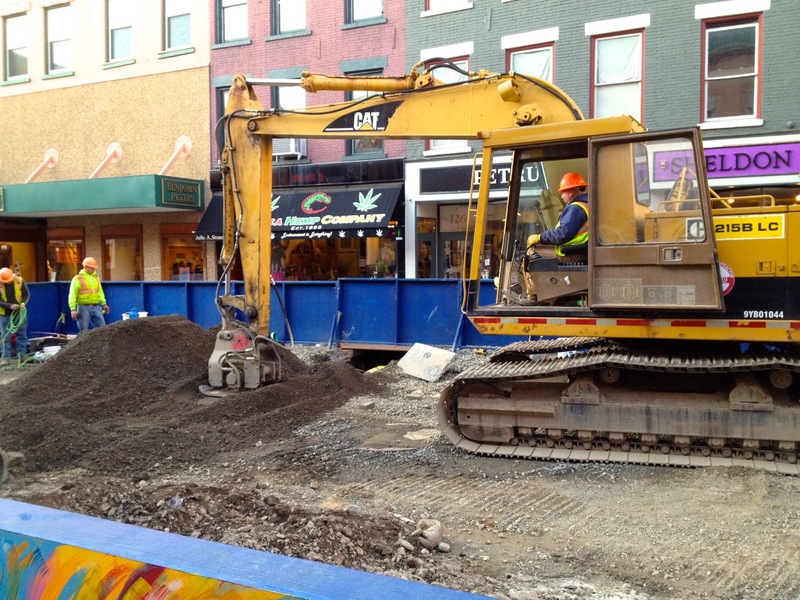 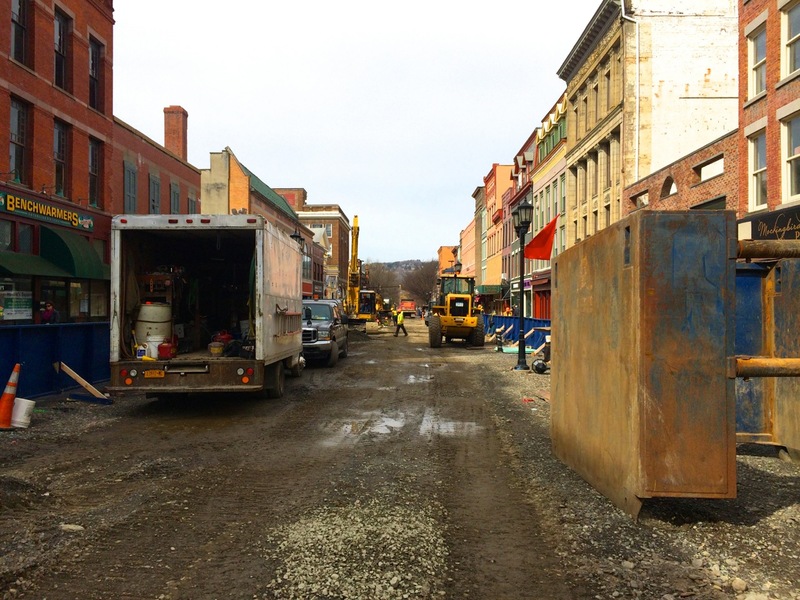 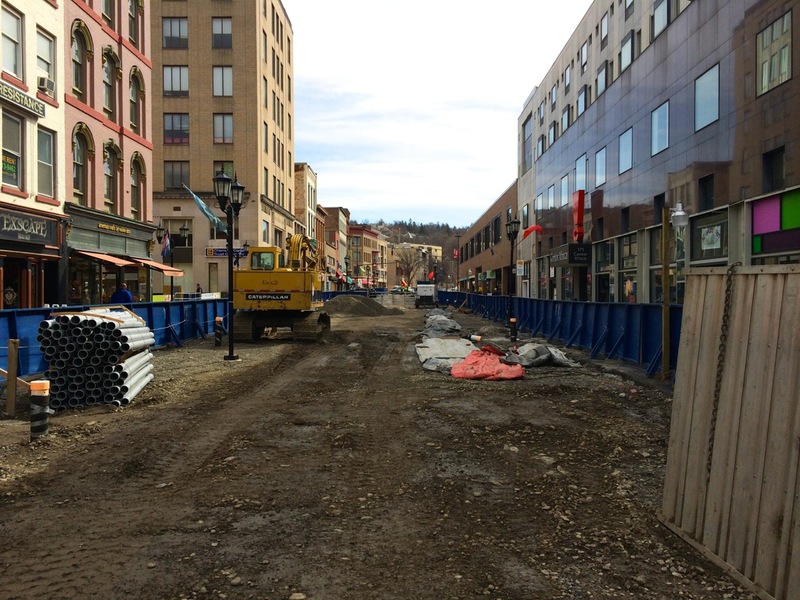 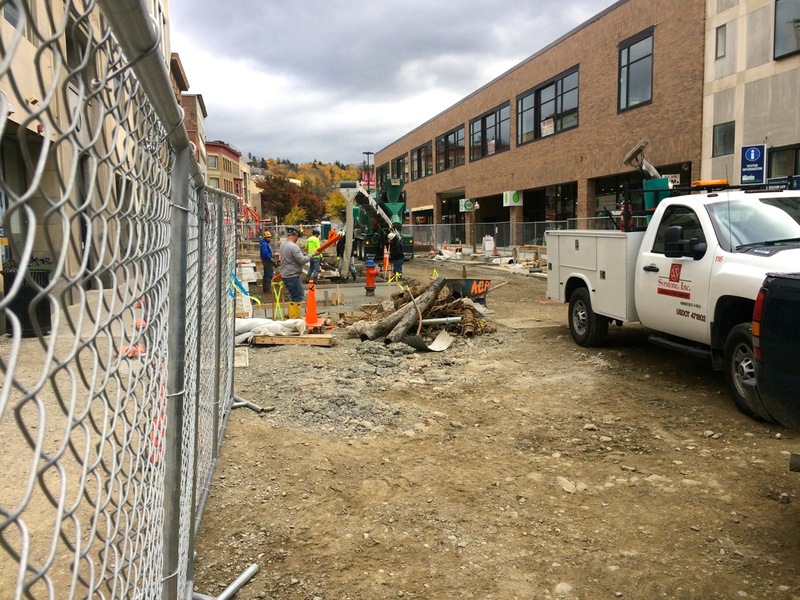 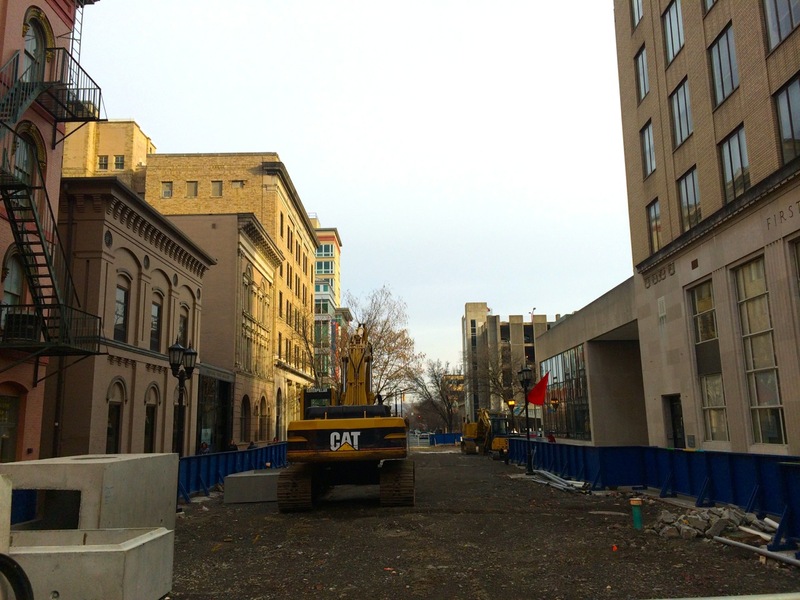 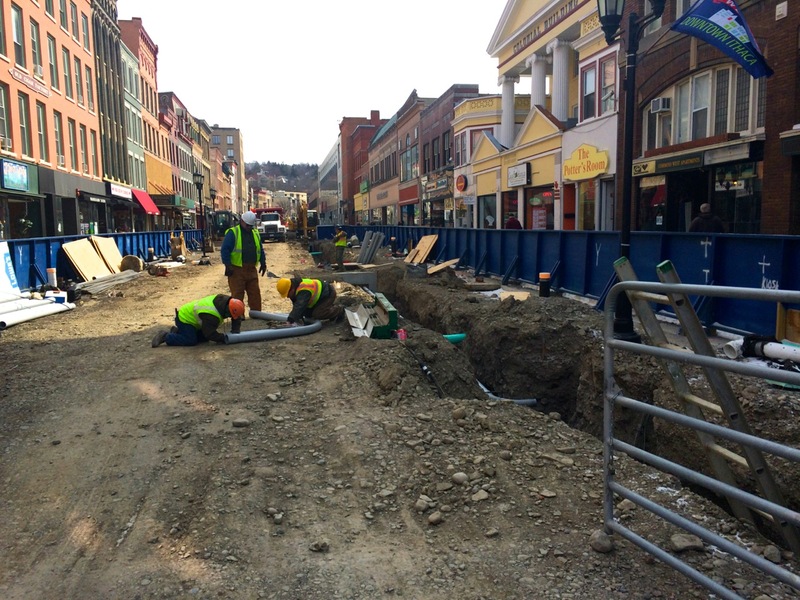 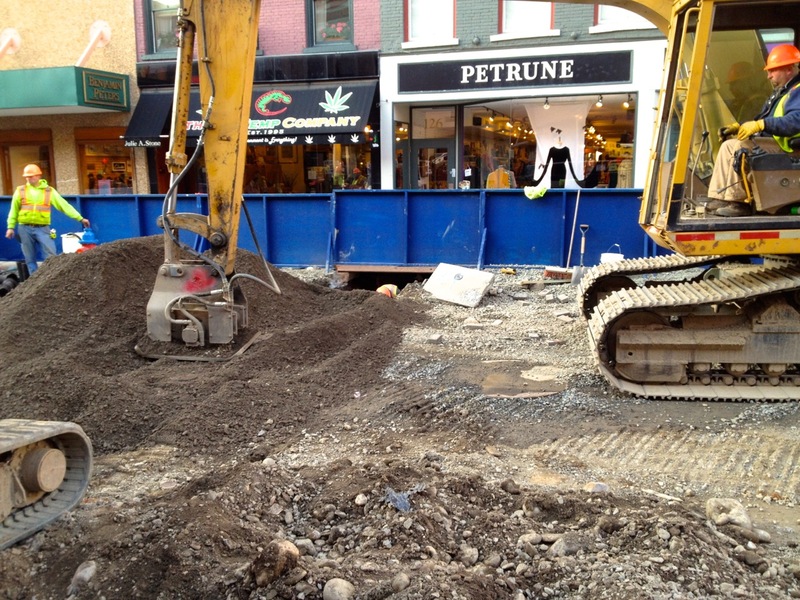 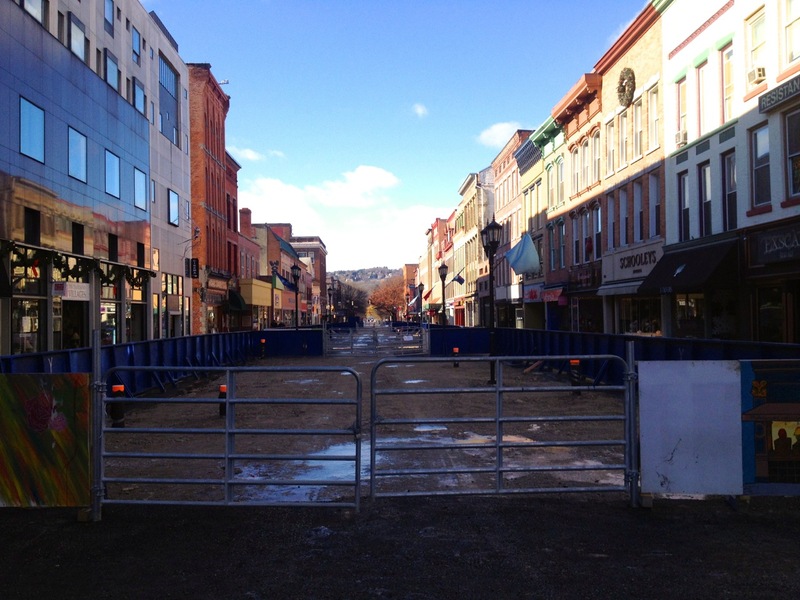 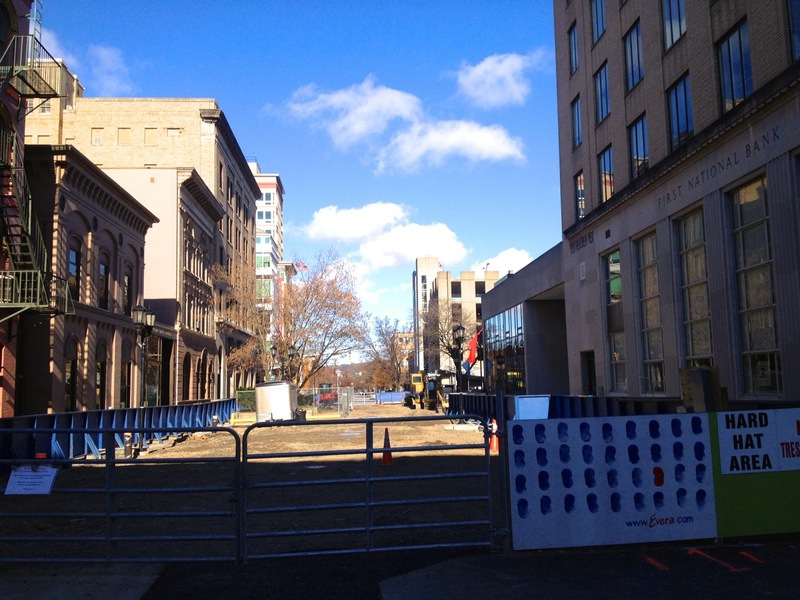 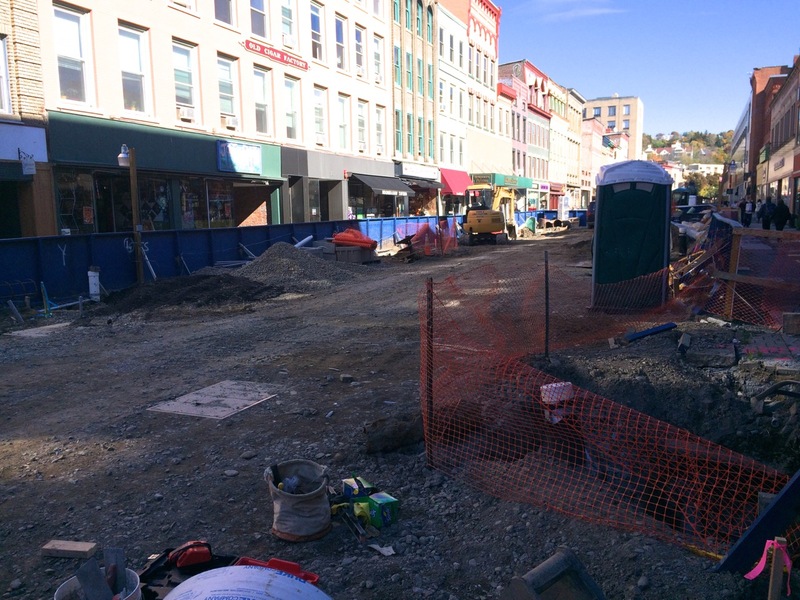 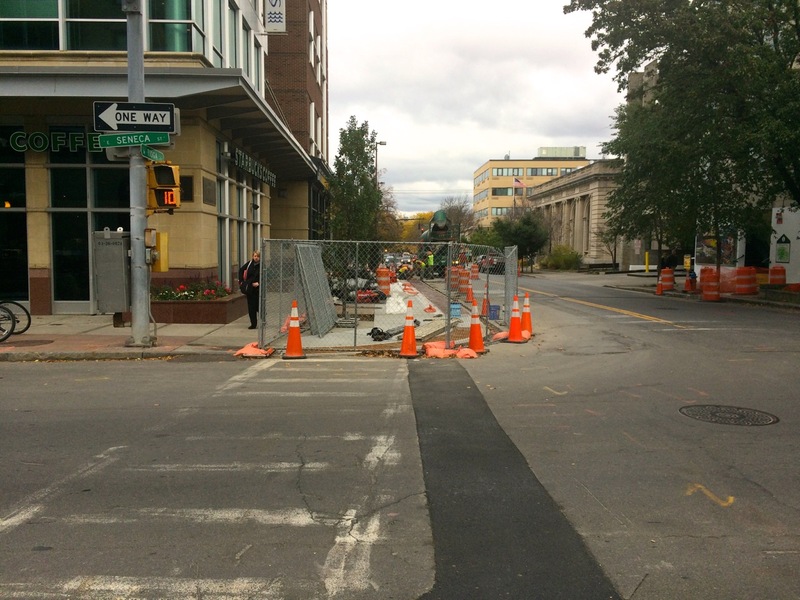 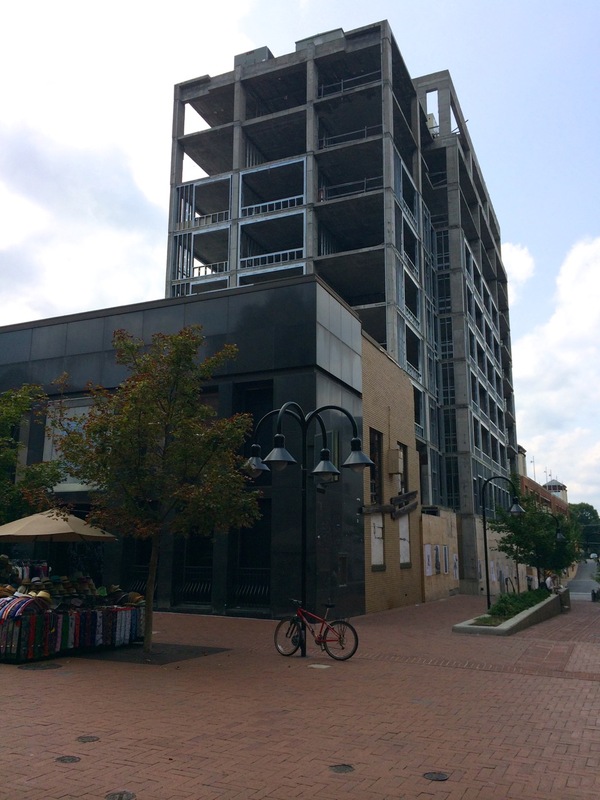 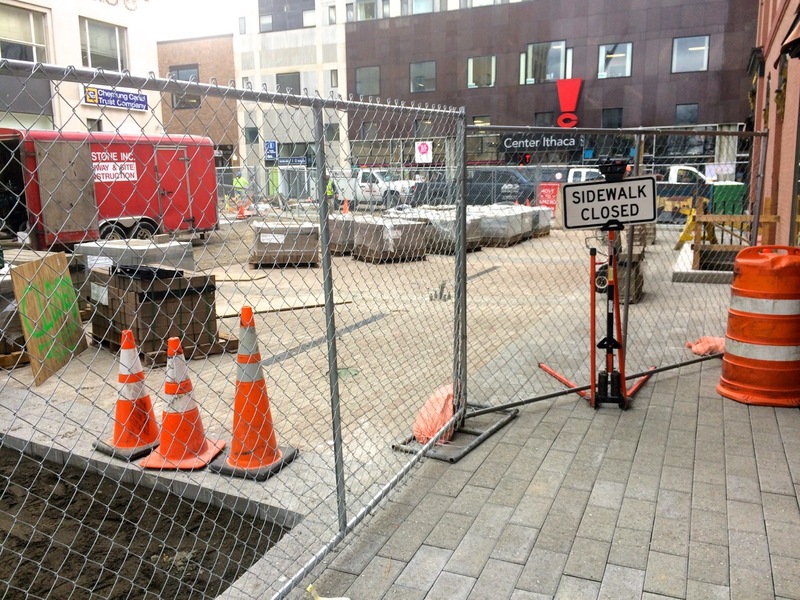 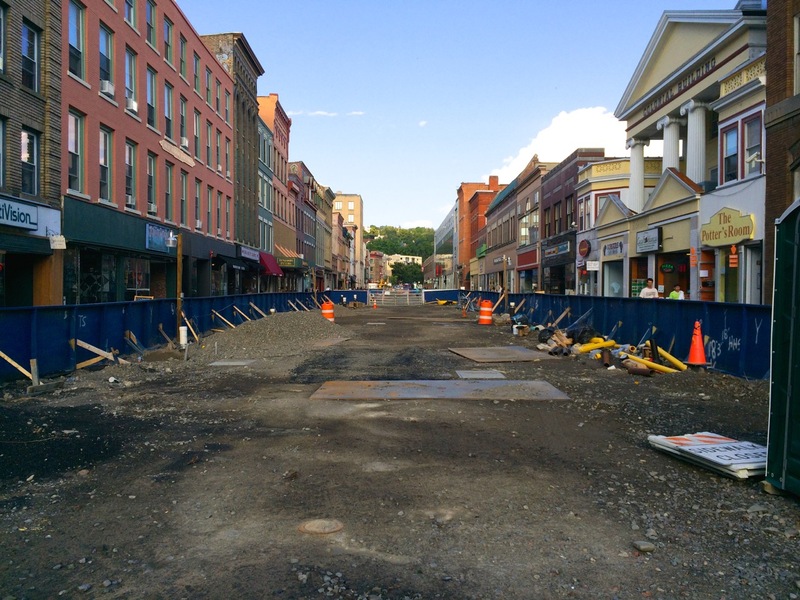 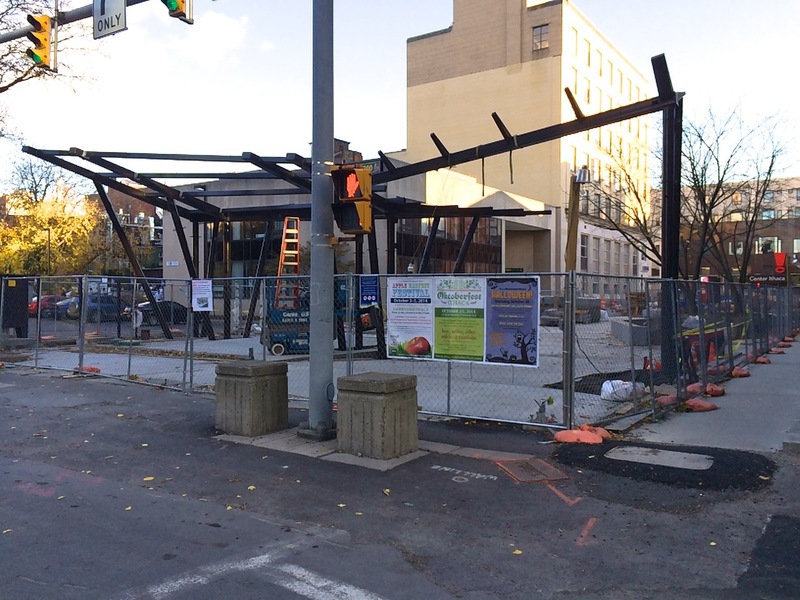 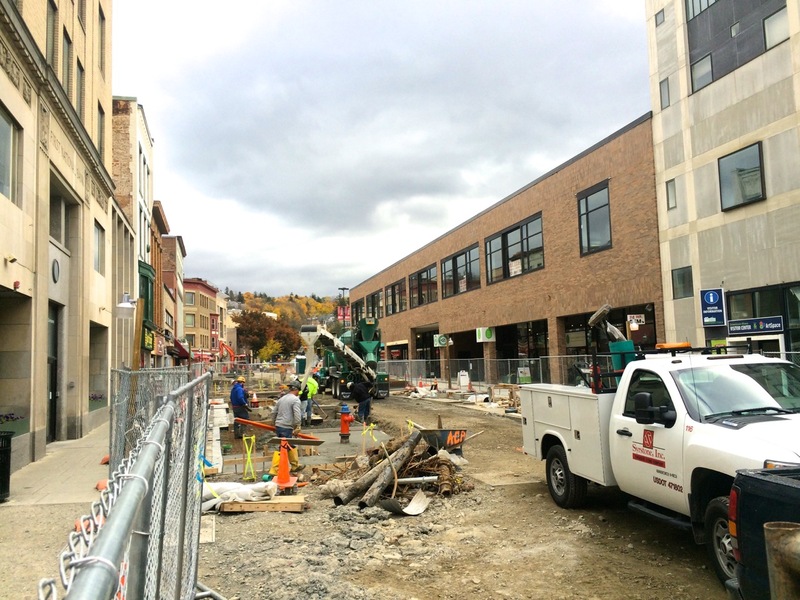 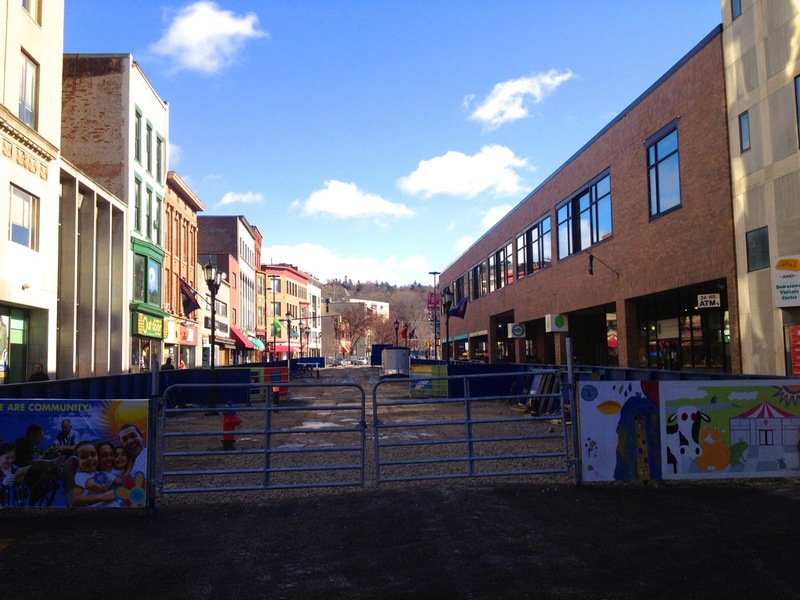 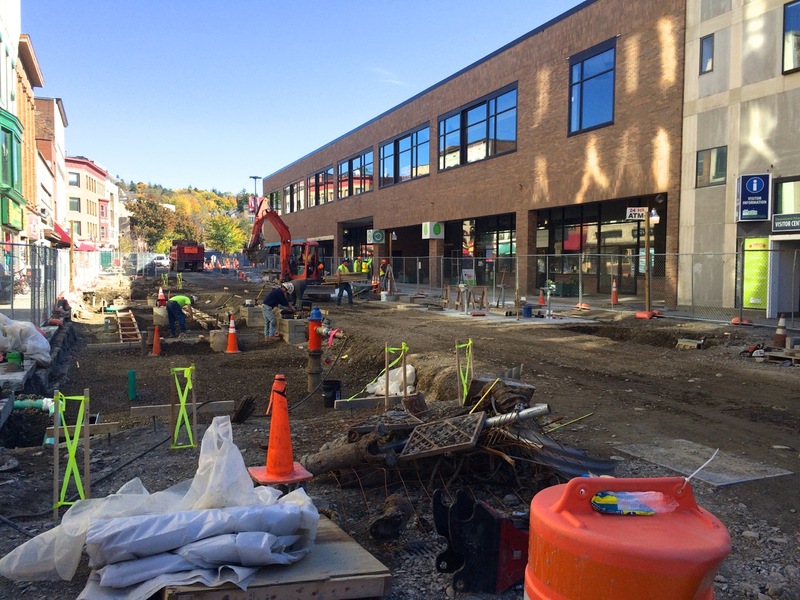 As announced on the Ithaca Commons project page, Vacri Construction‘s team wrapped-up last week for this year’s Phase Two, but they’ll be returning sometime between January and March to finish-up some additional telecom work. 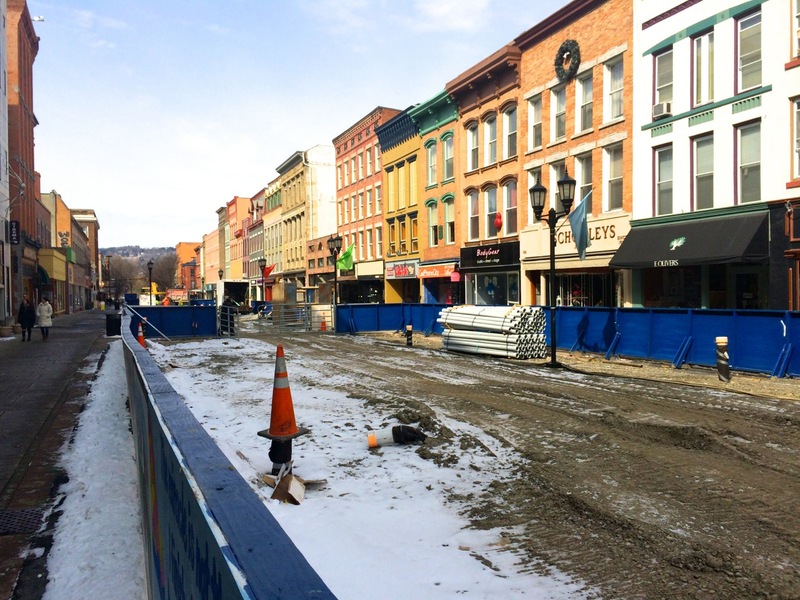 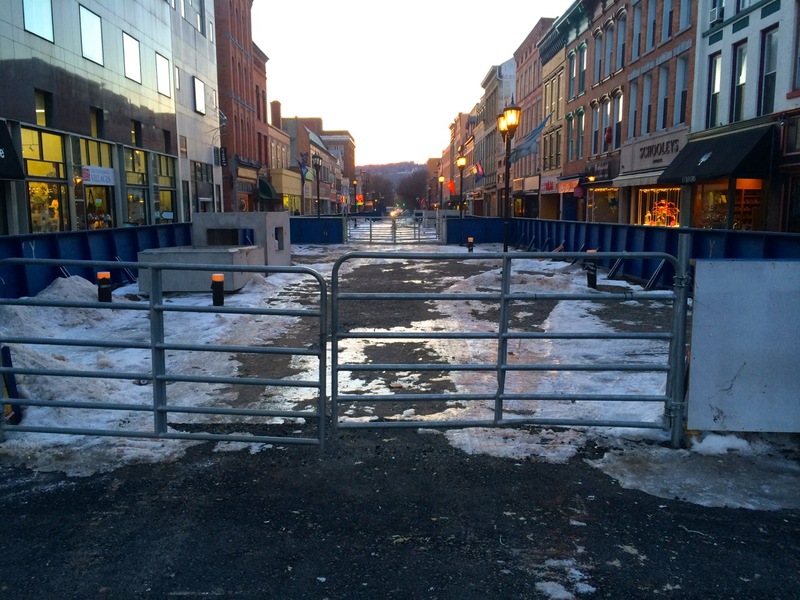 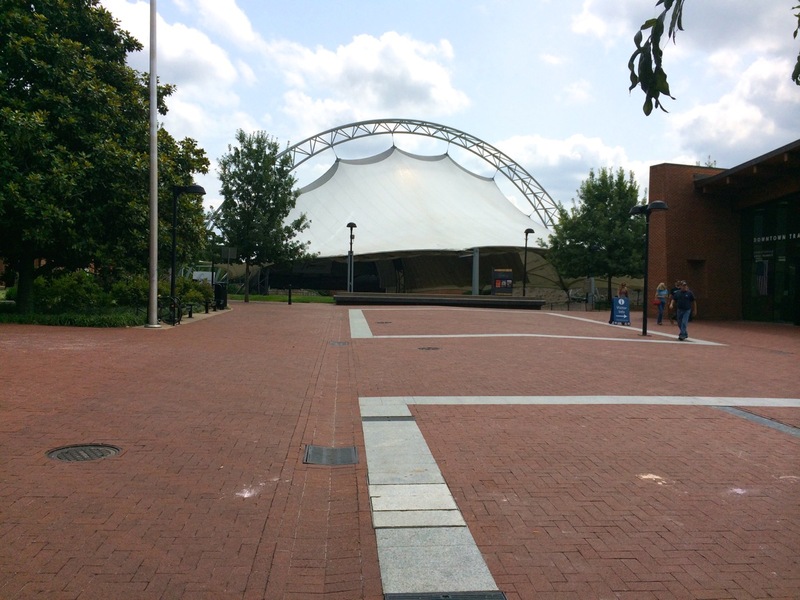 For now, the space in front of Center Ithaca is opened-up and paved for events (Ice Wars and Chowder Cook-Off is December 13th & 14th). 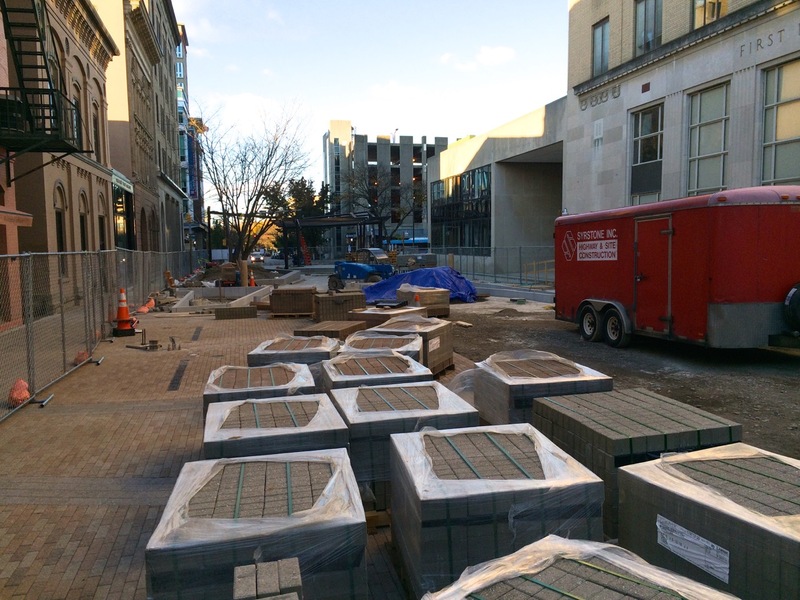 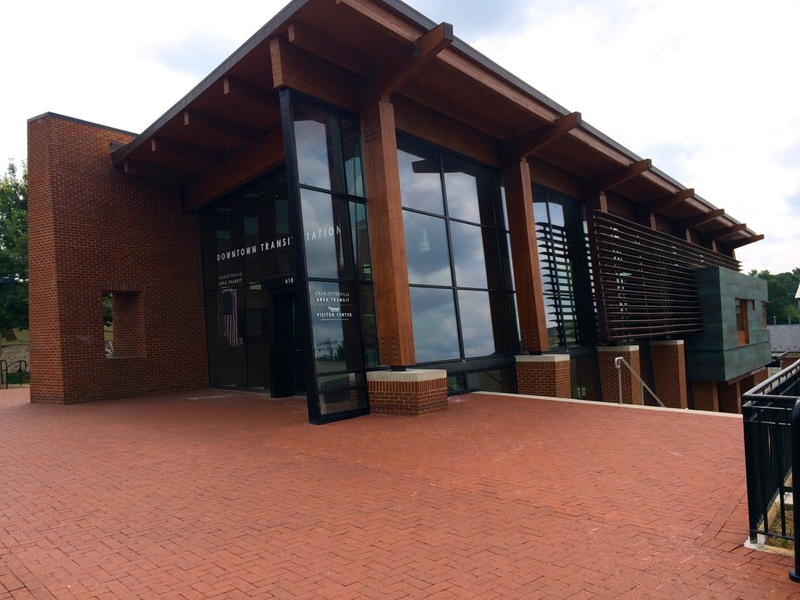 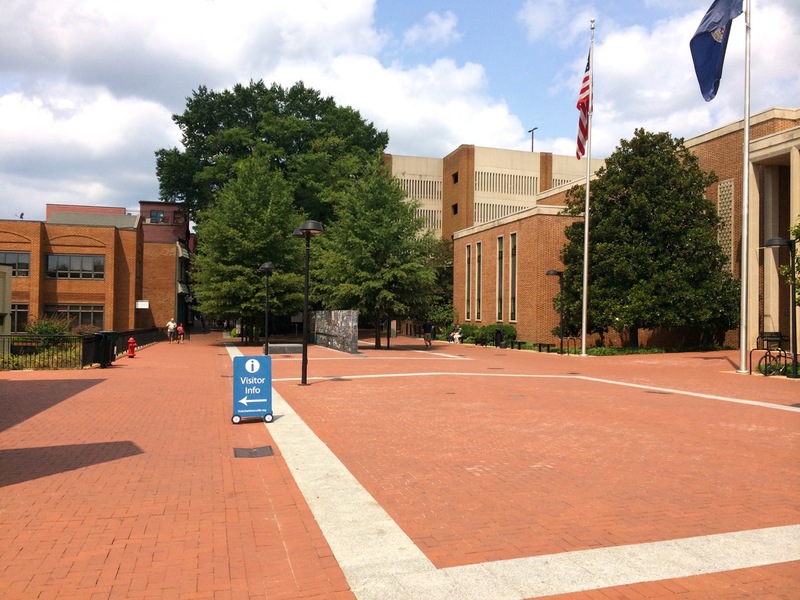 The Surface Improvements Phase begins Spring 2014, which will see the installation of the new pavers, chairs, tables, play structures, pavillion, and other features that will greatly enhance the public space. 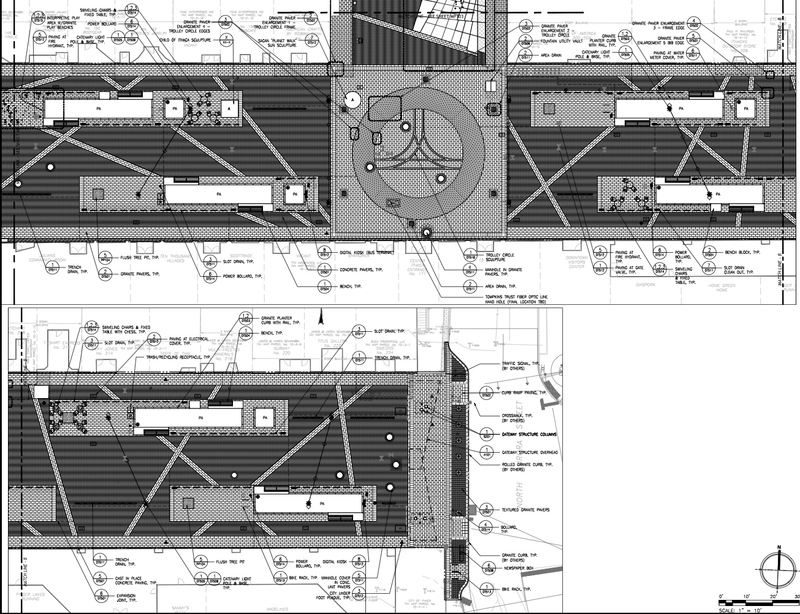 Plans for the improvements posted here.